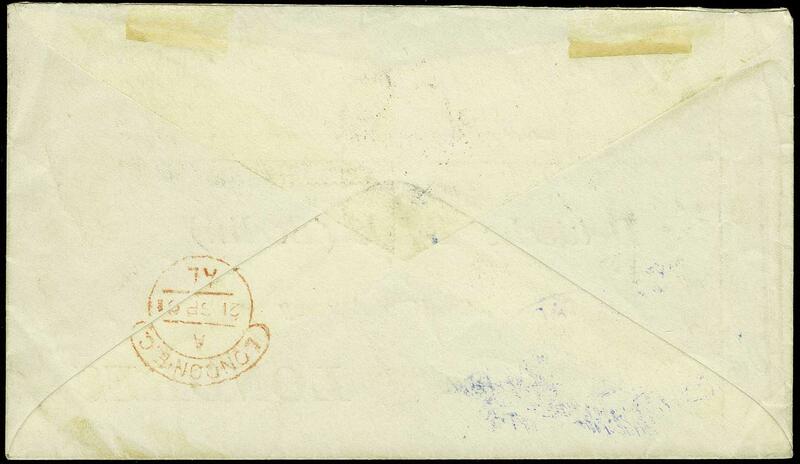 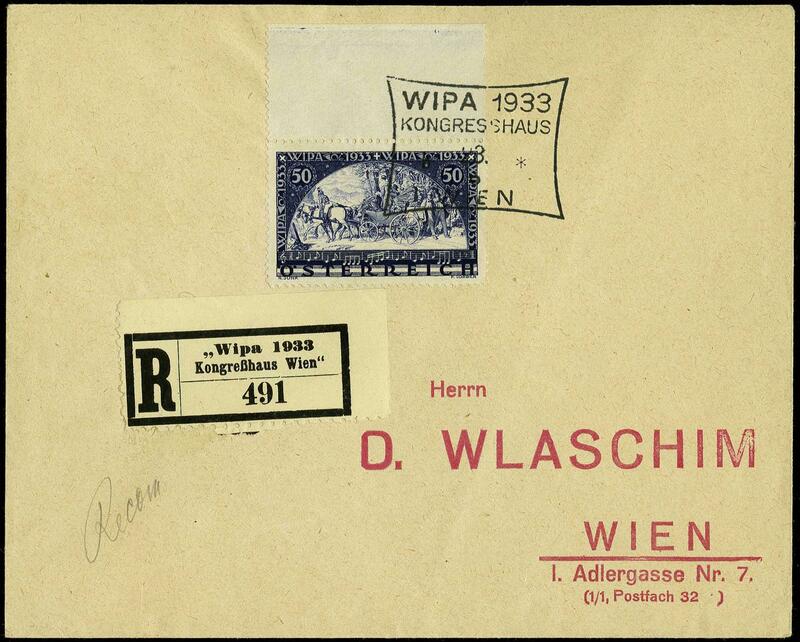 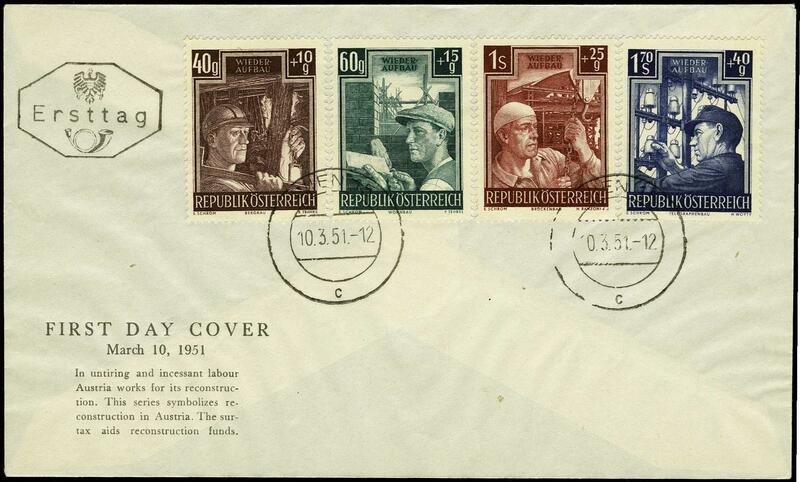 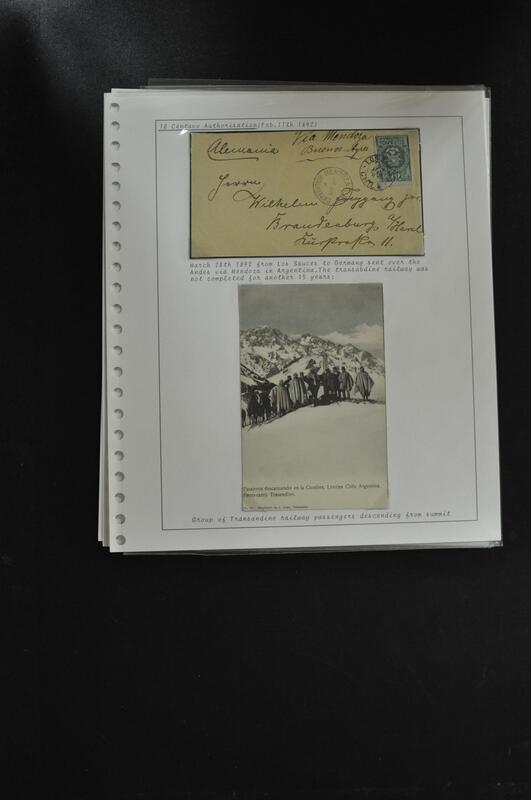 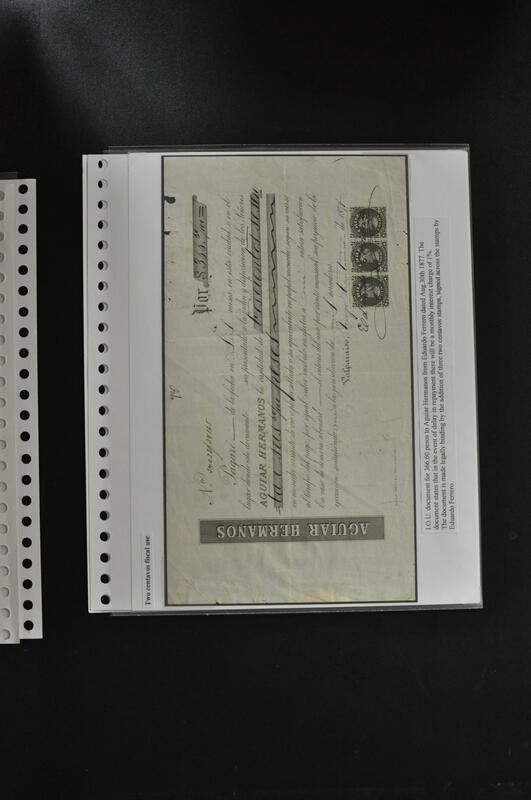 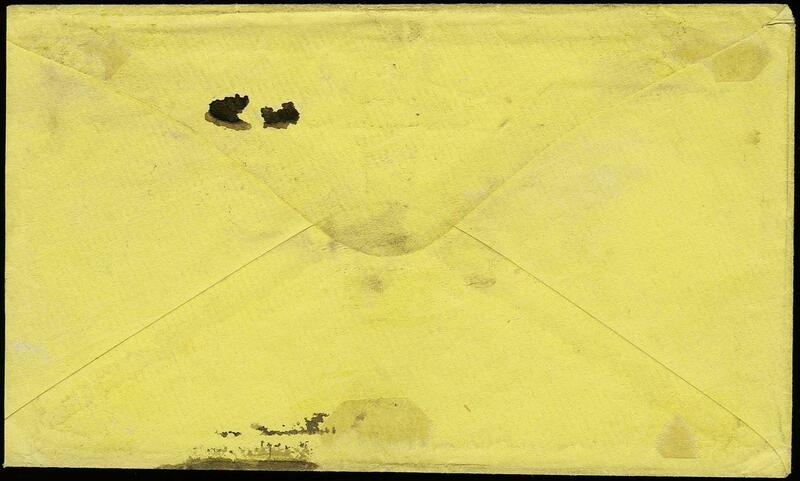 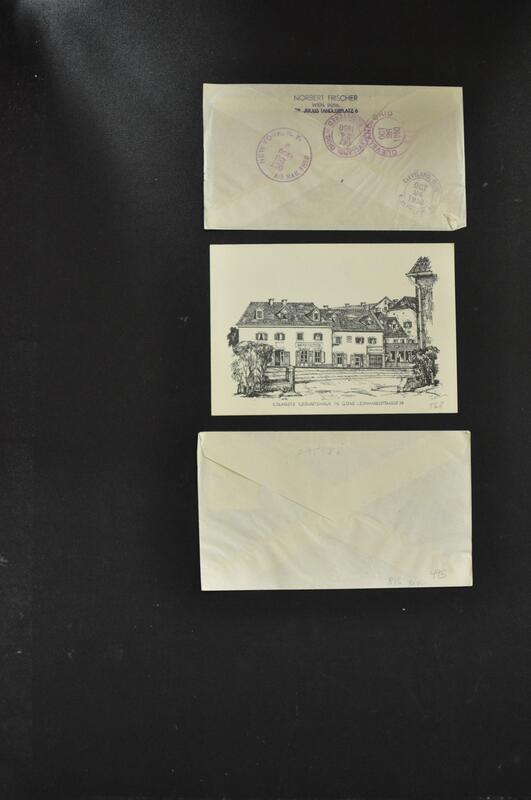 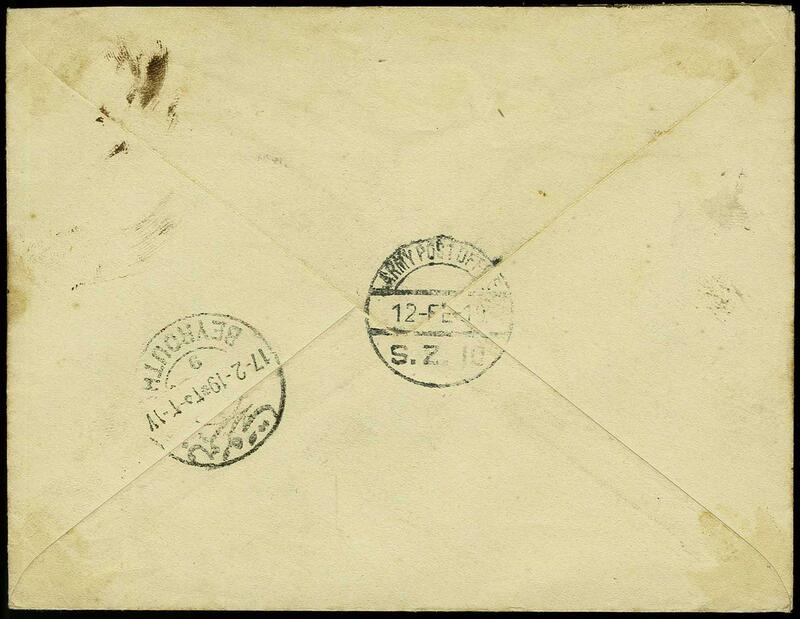 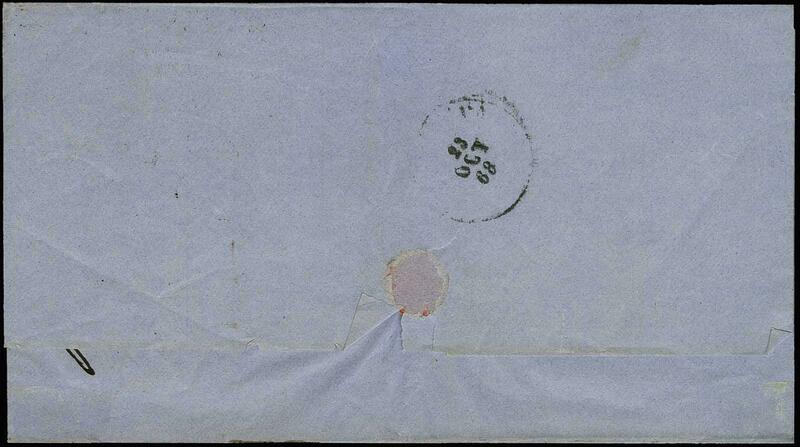 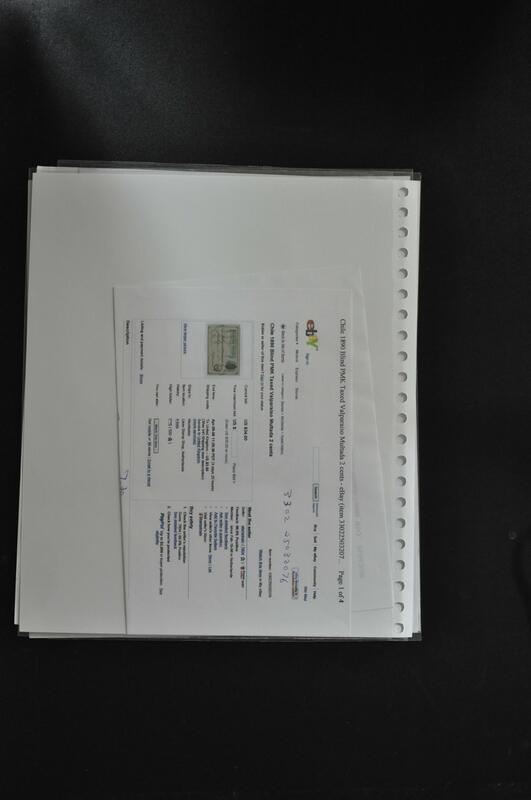 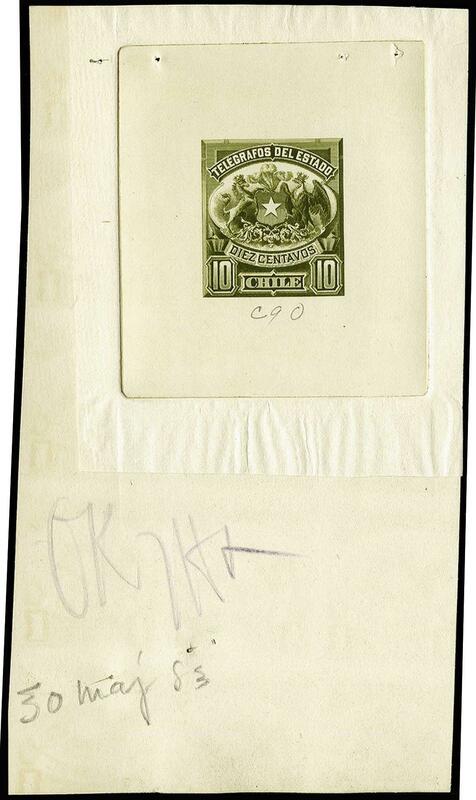 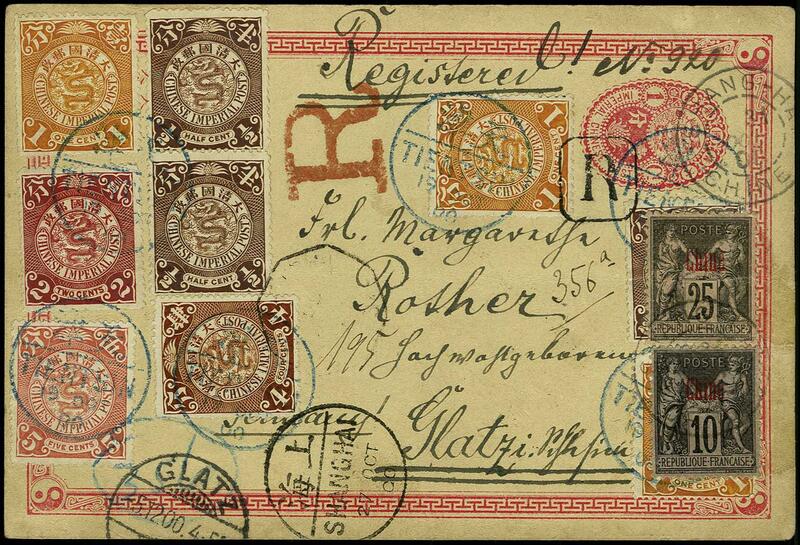 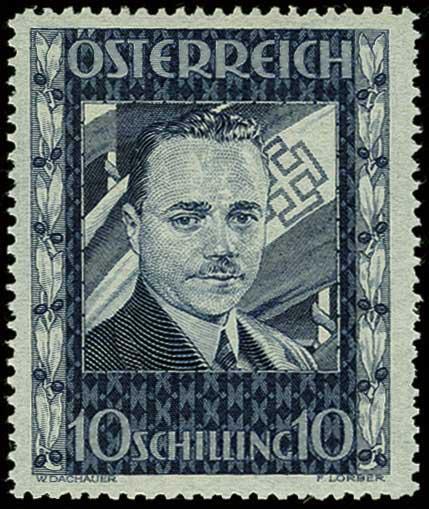 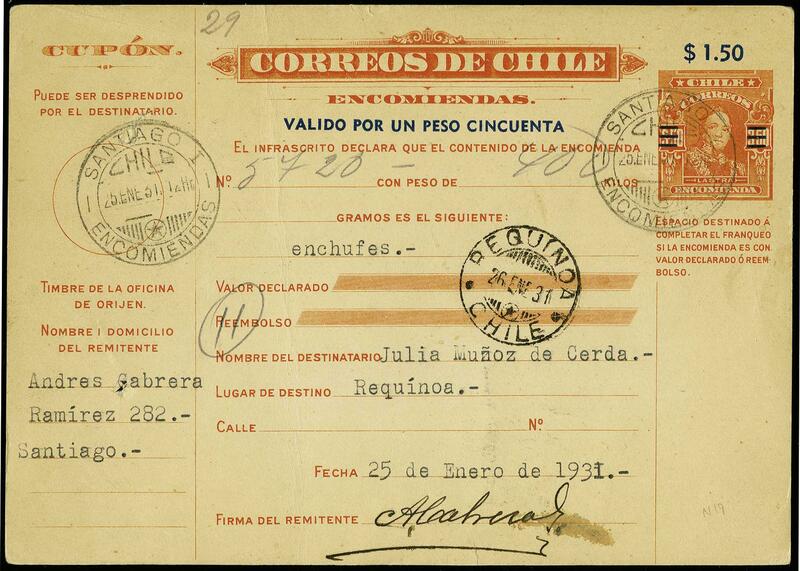 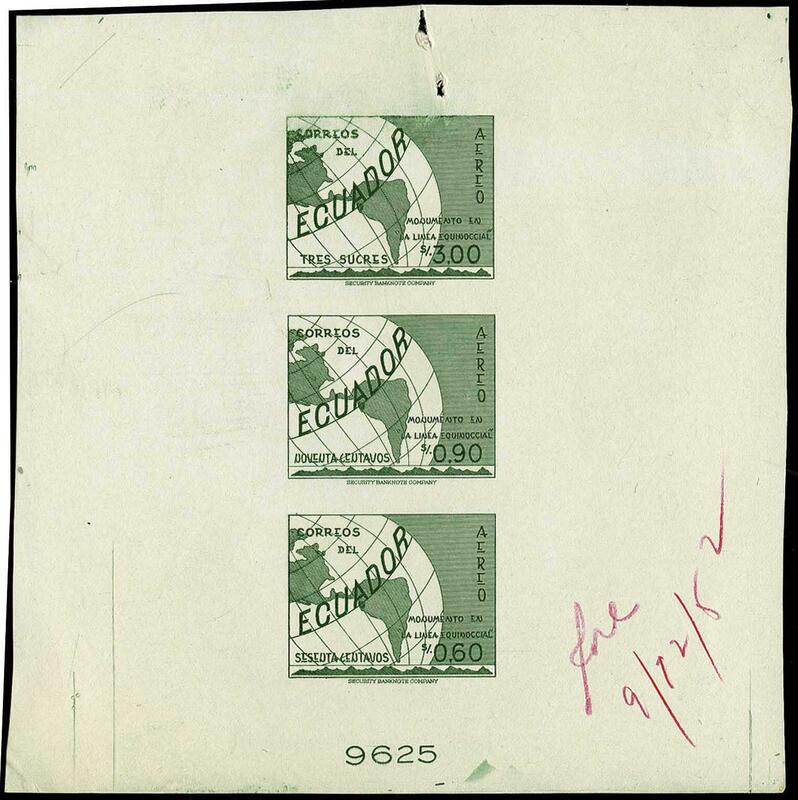 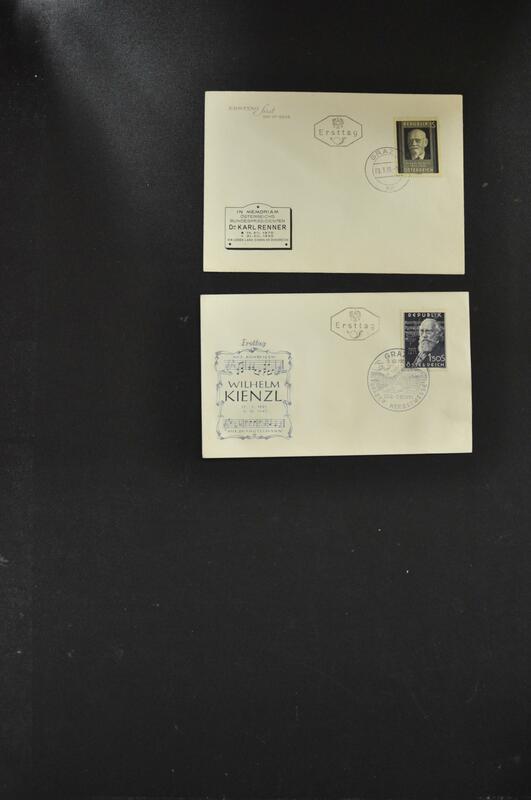 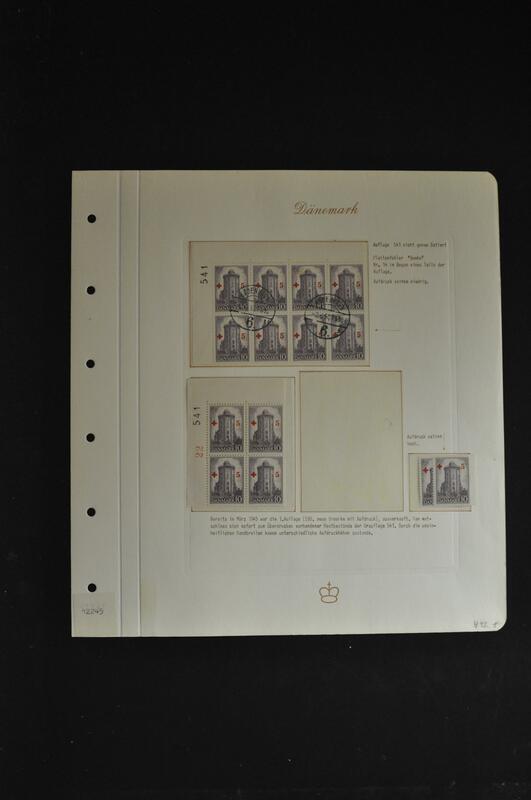 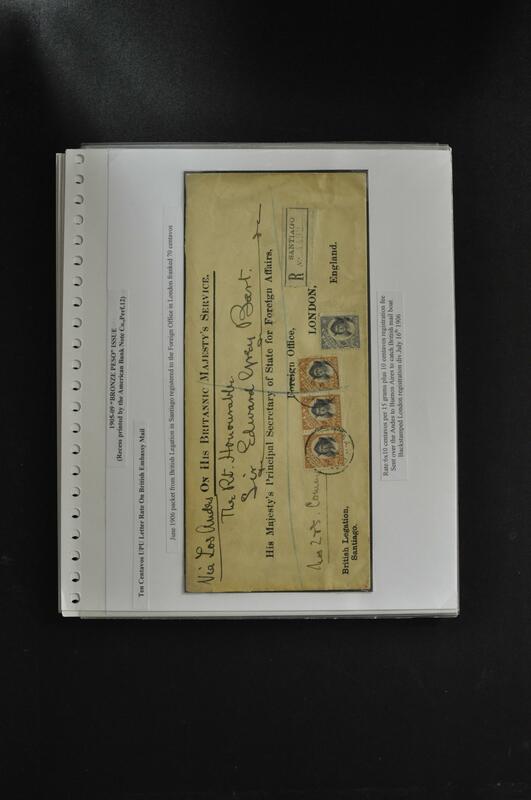 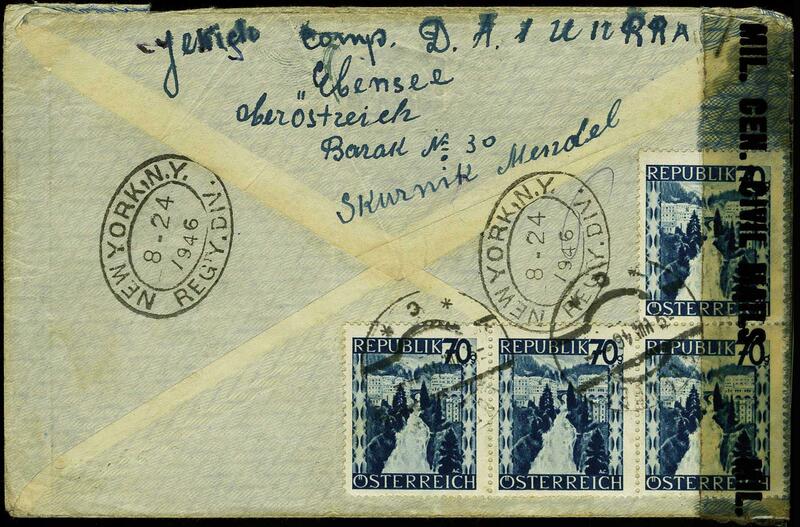 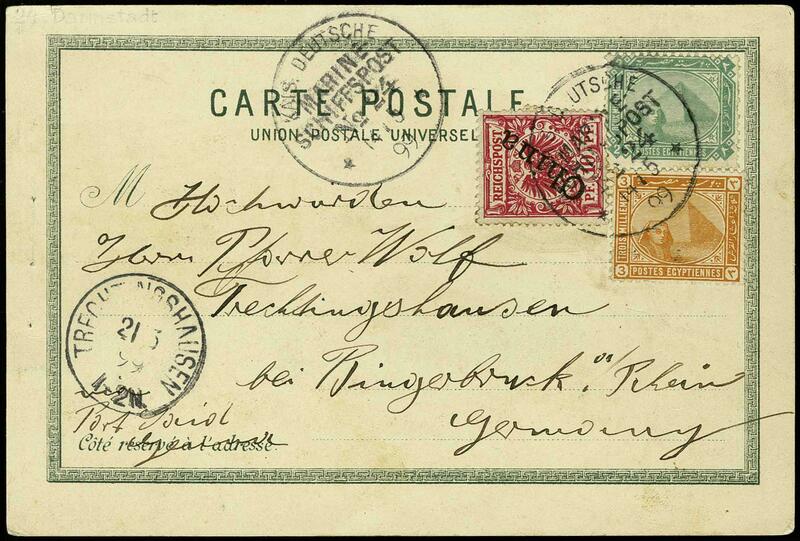 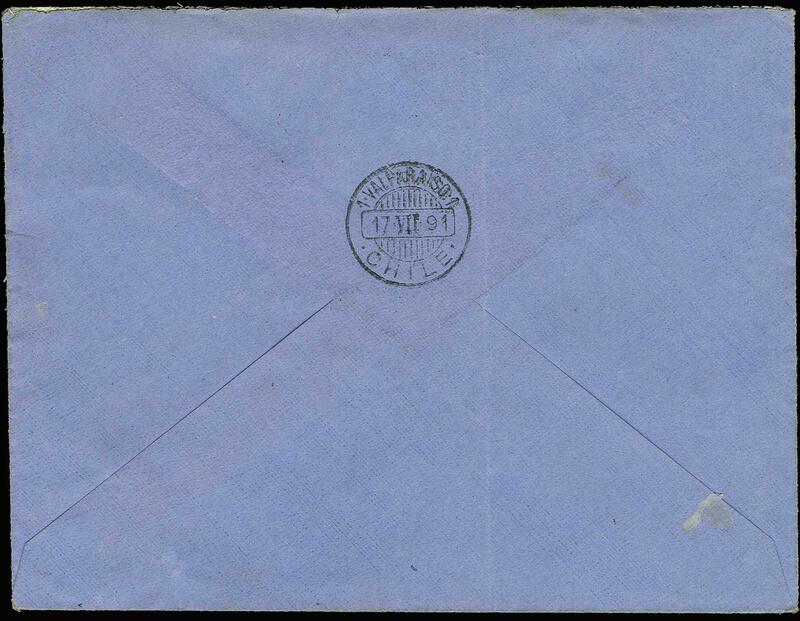 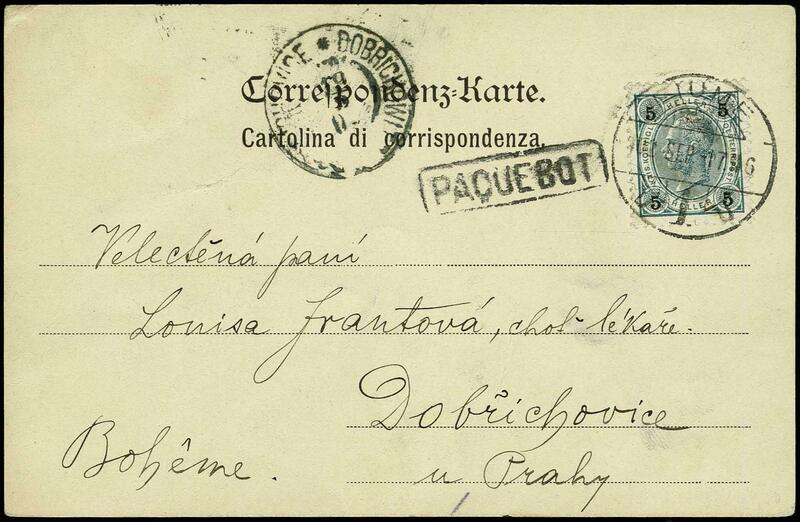 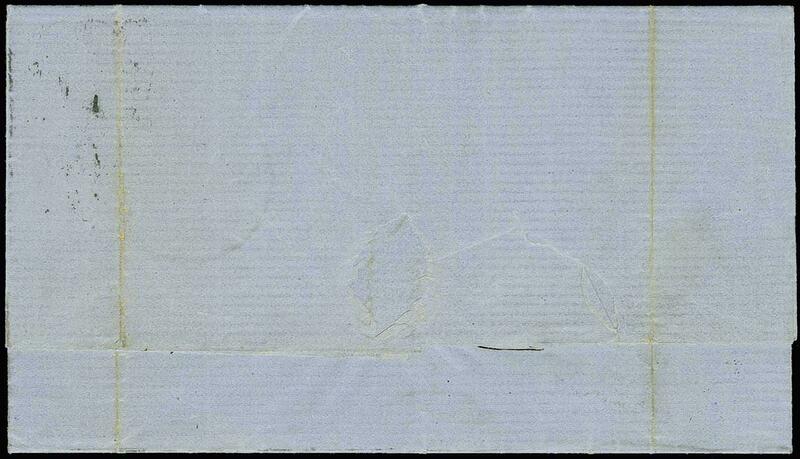 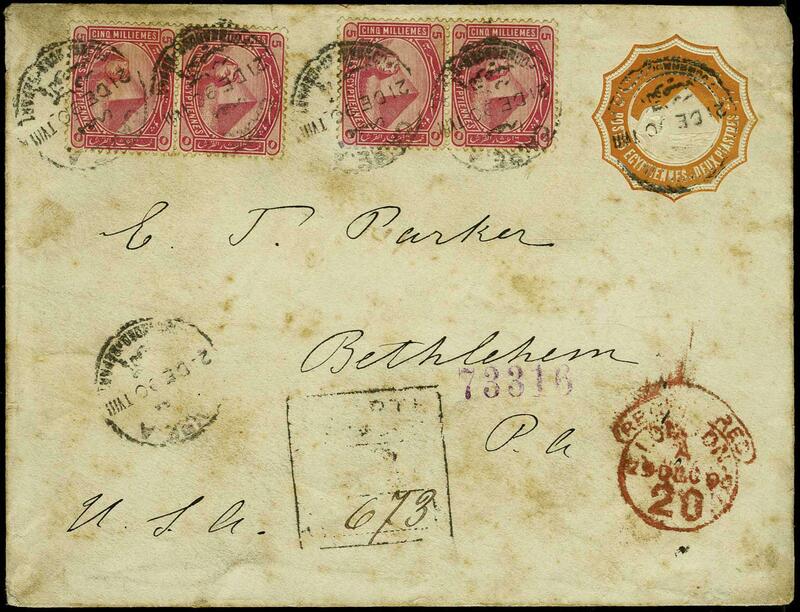 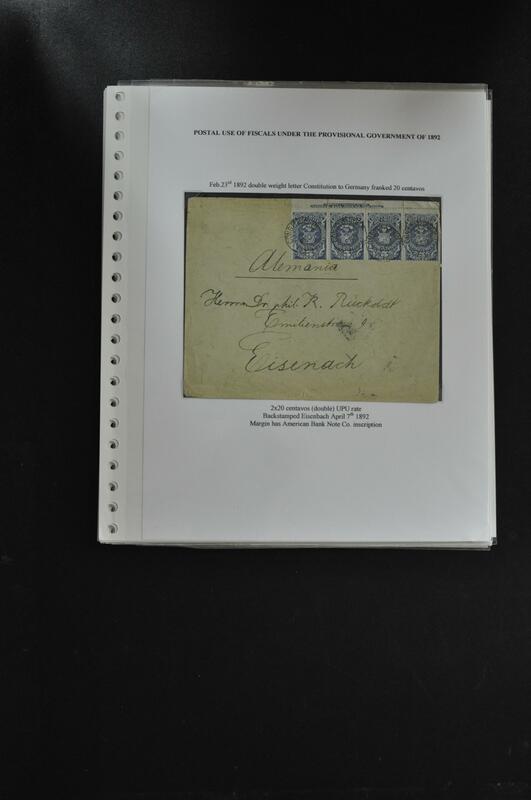 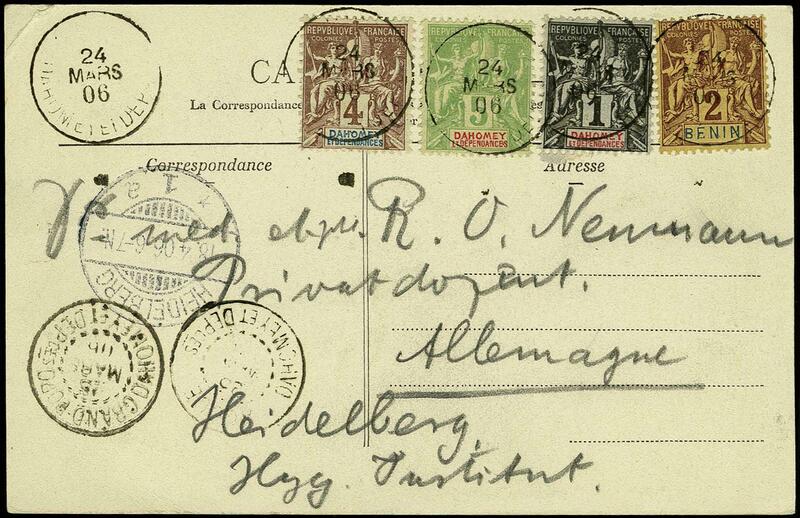 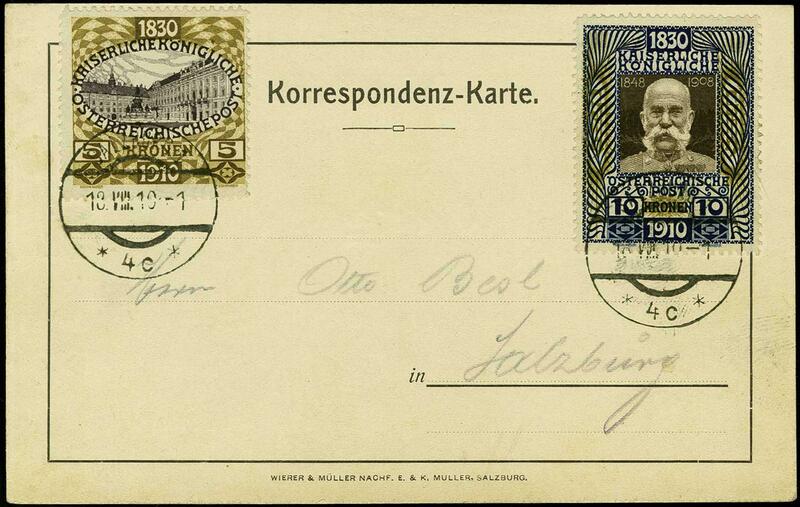 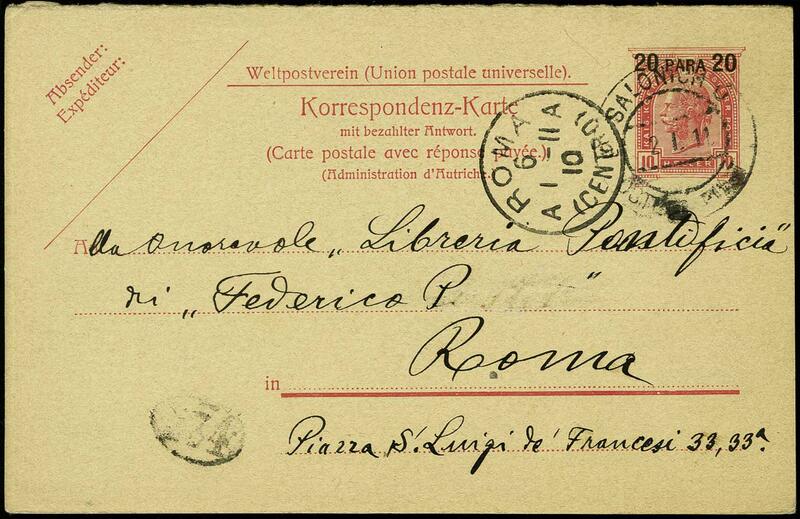 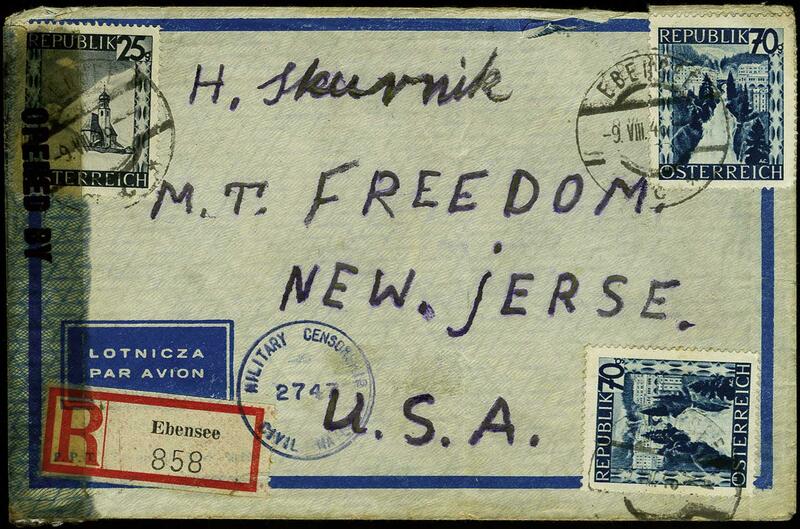 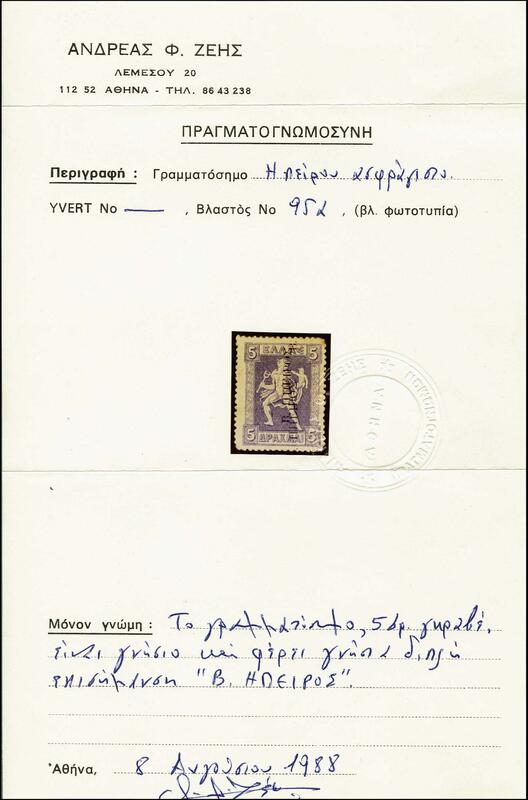 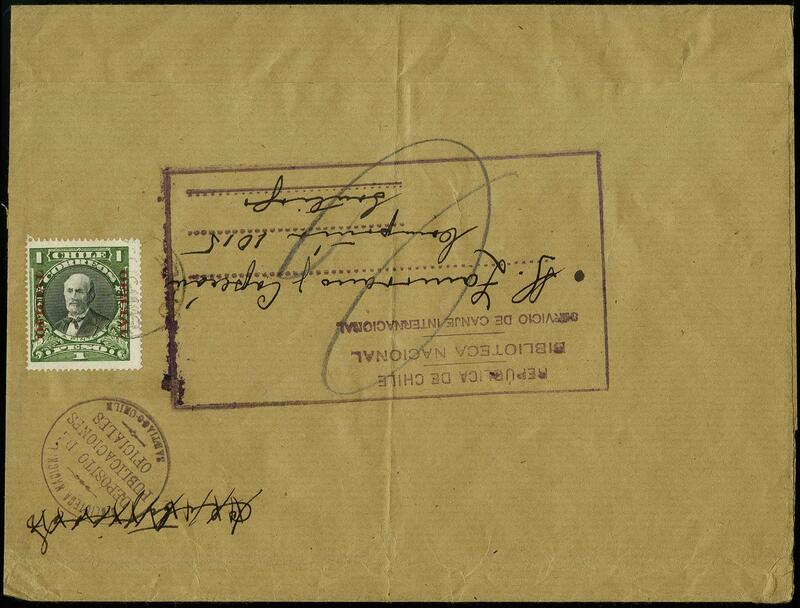 1946 Registered Censored Cover from EBENSEE Jewish Concentration Camp, sent by a Polish/Russian Jew, Skurnik Mendel, to New Jersey, USA, franked with a 25g and six 70g Austrian stamps; typical wear, Fine and scarce use; this camp was managed by UNRRA (United National Relief & Rehabilitation Administration). 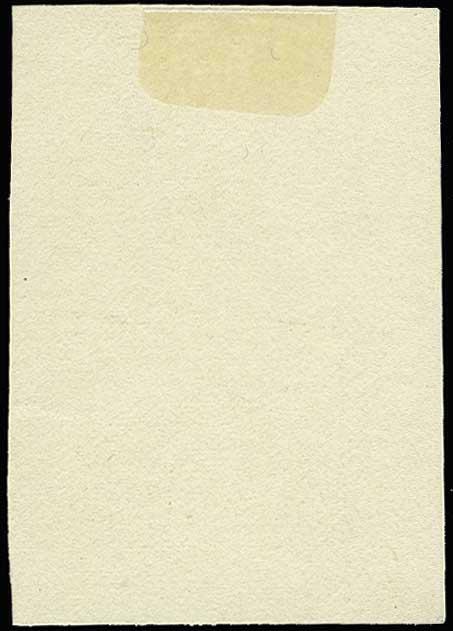 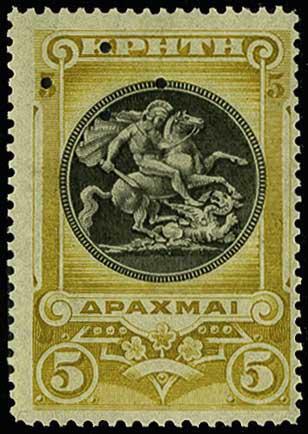 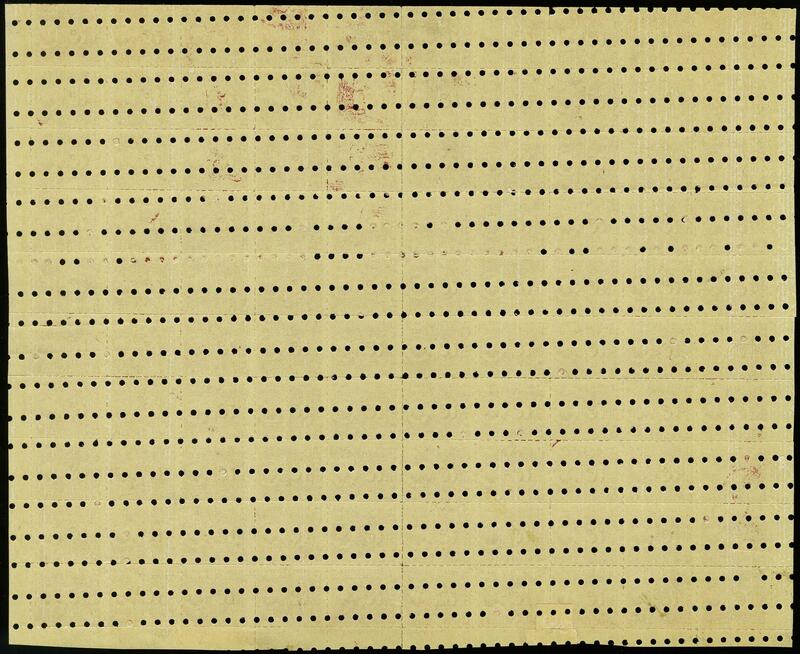 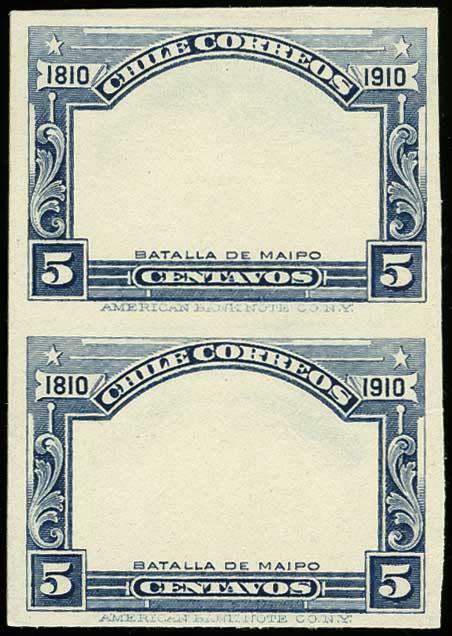 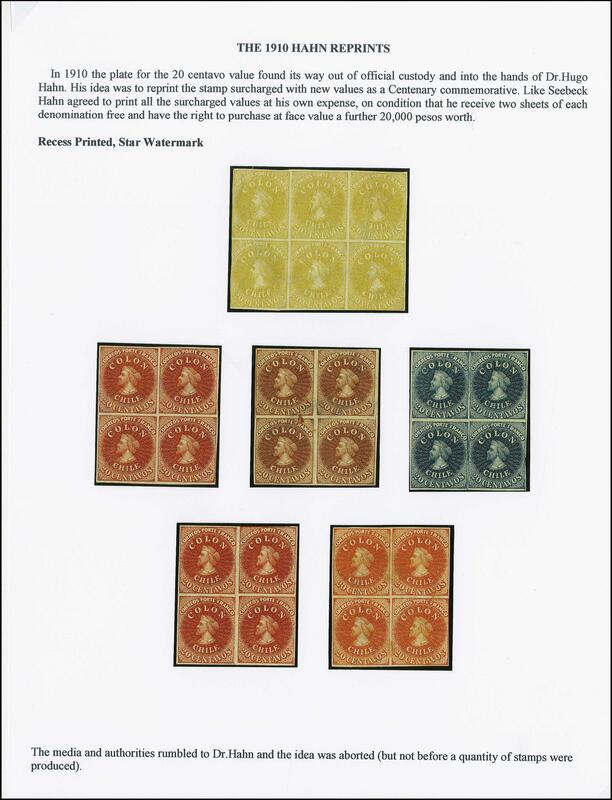 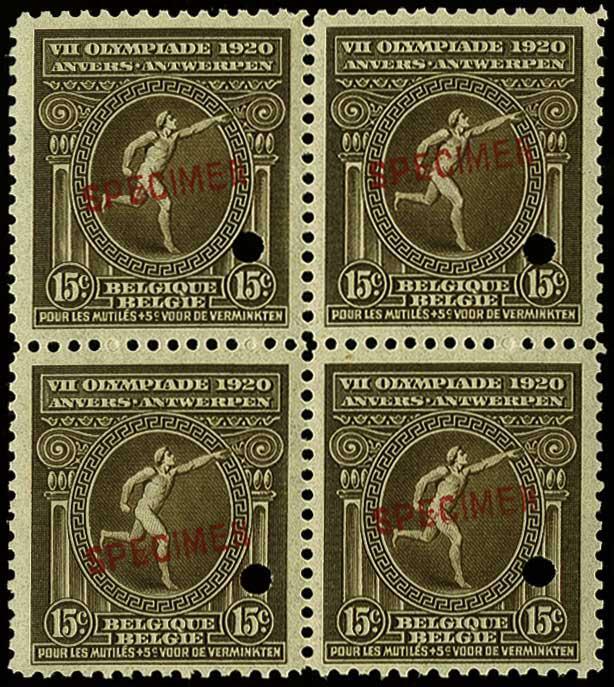 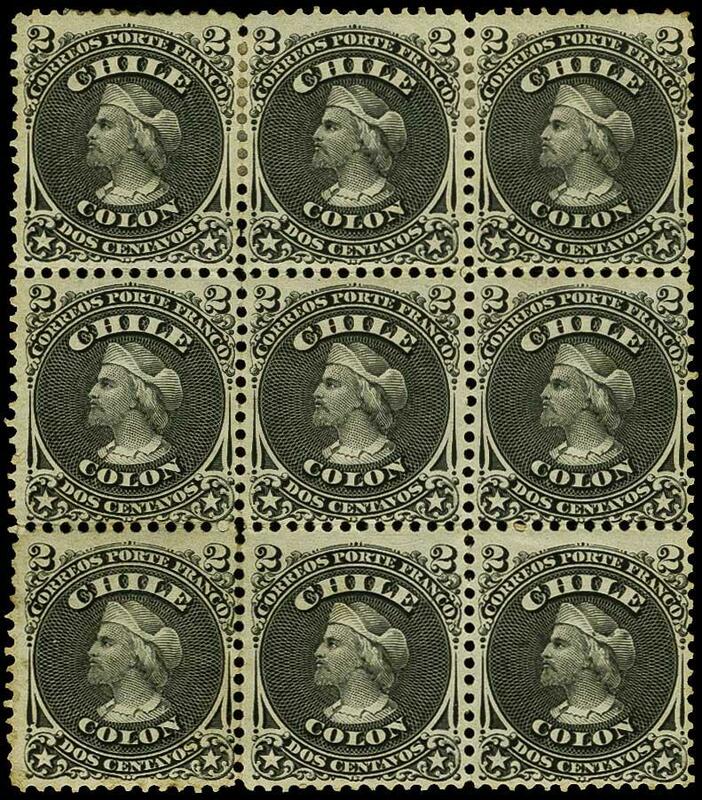 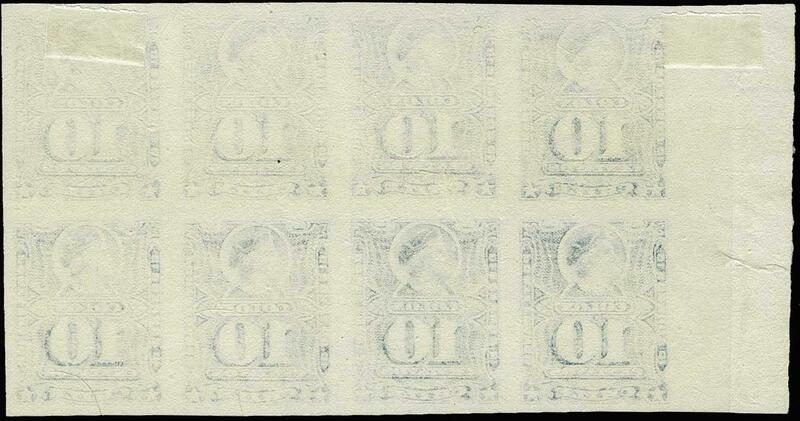 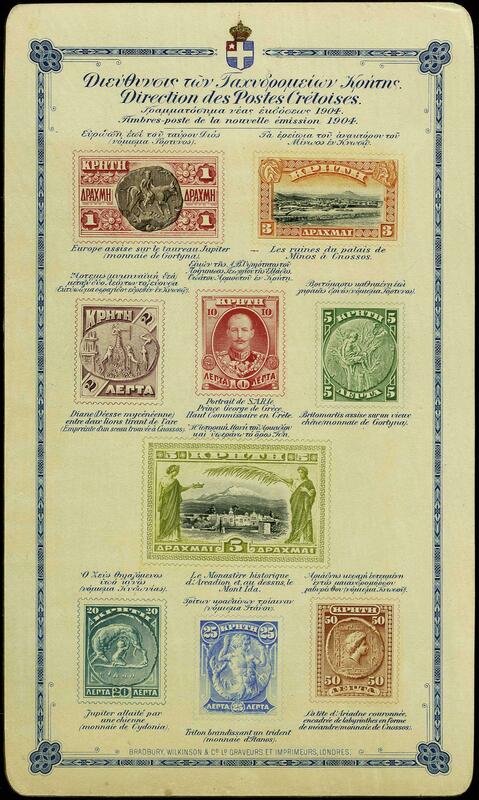 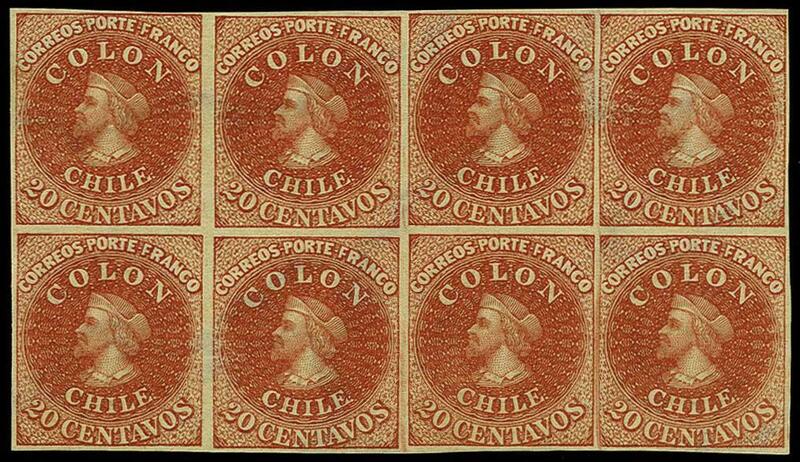 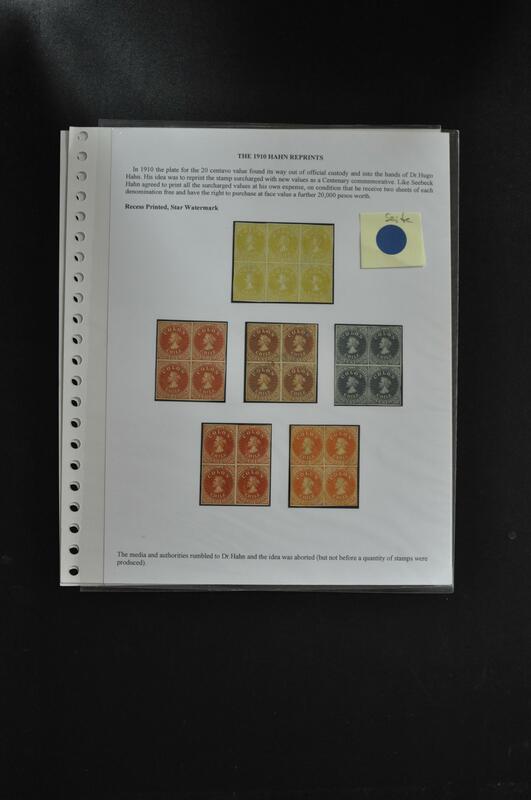 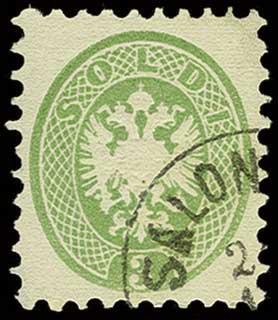 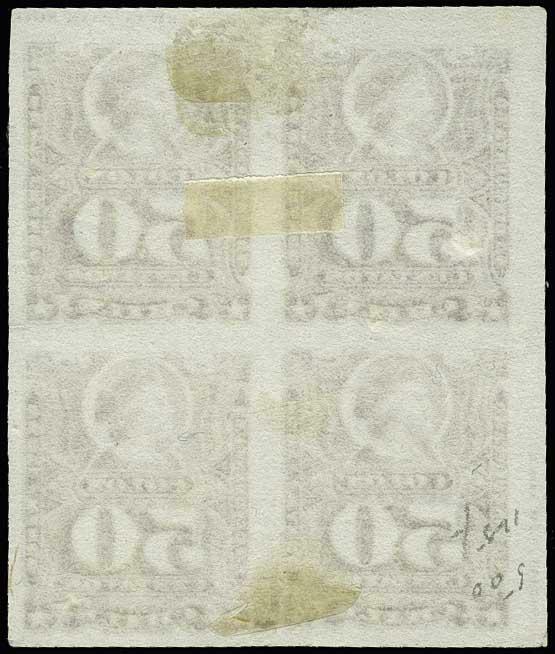 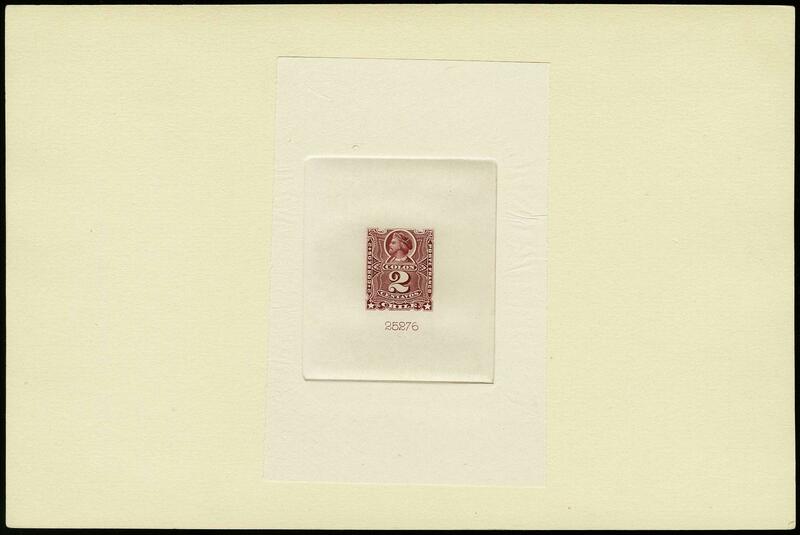 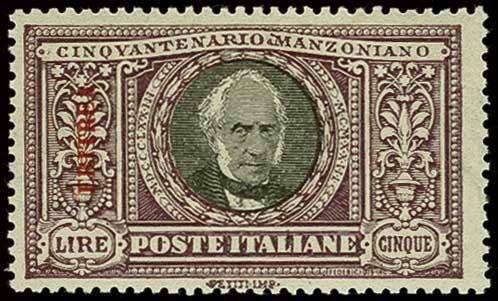 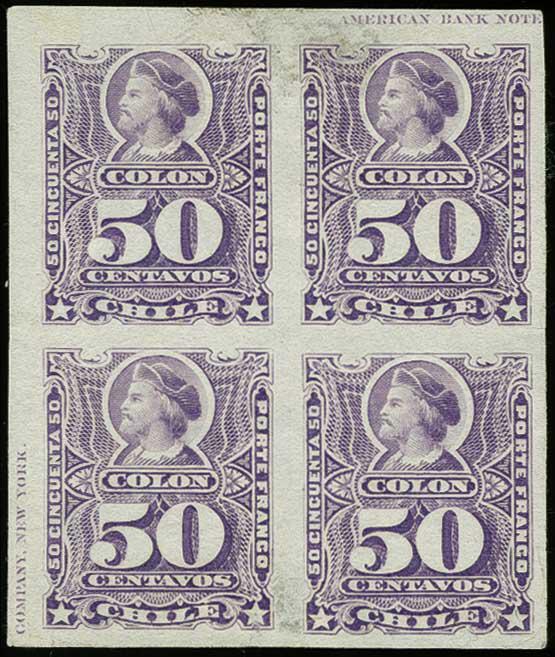 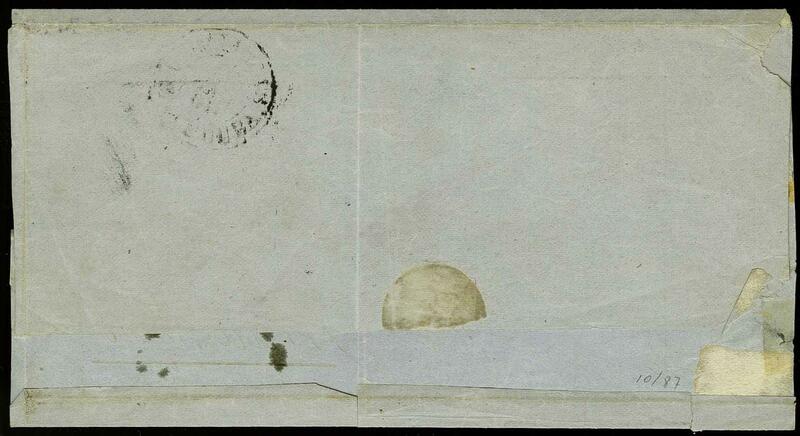 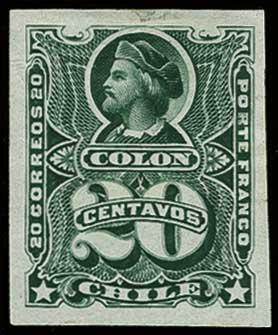 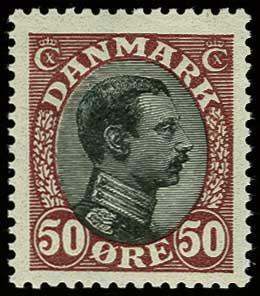 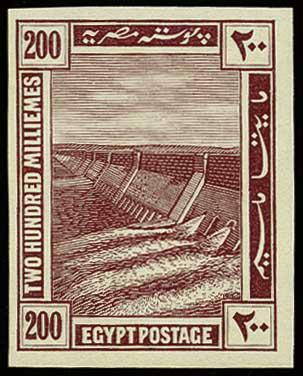 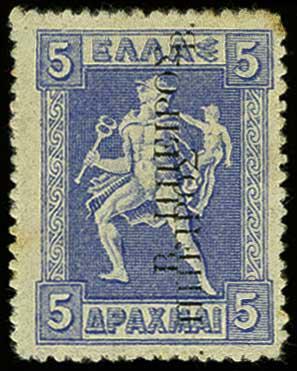 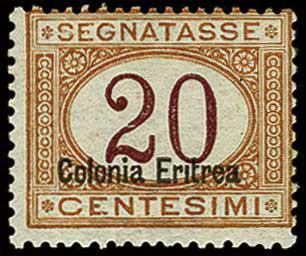 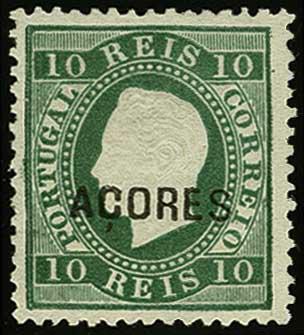 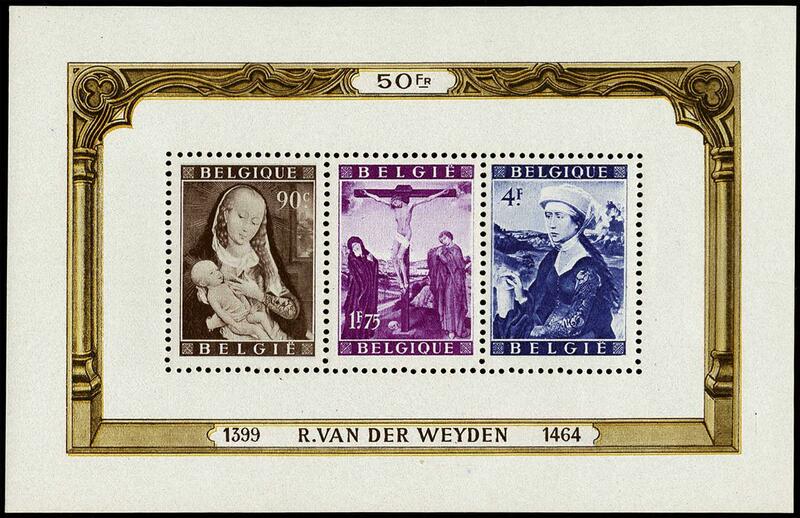 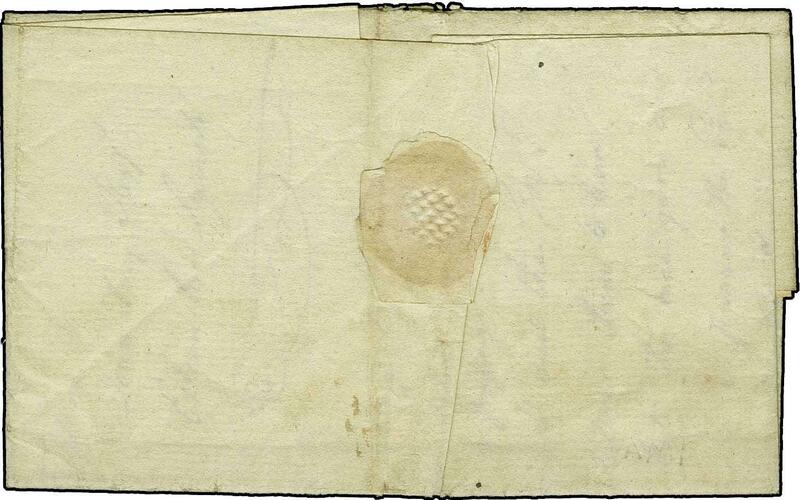 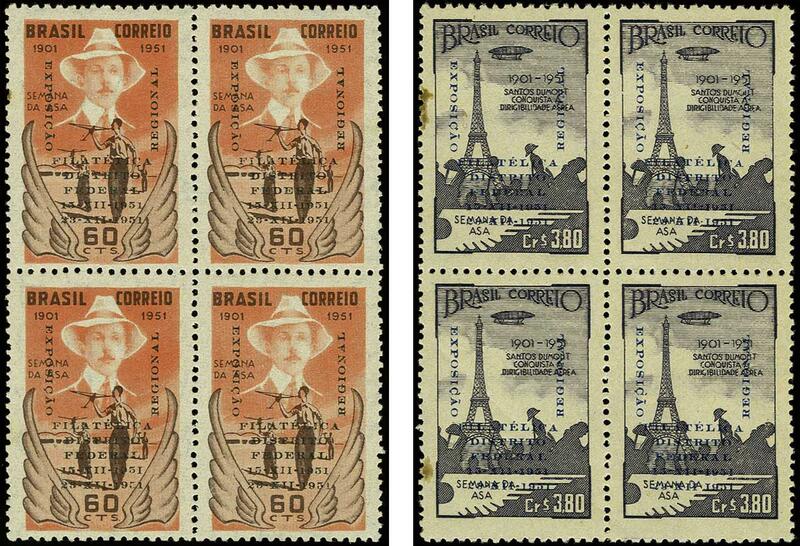 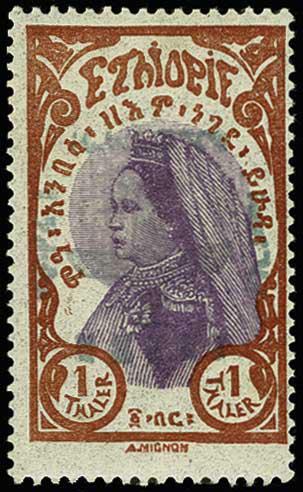 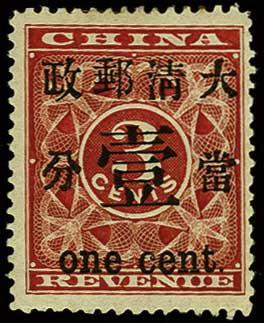 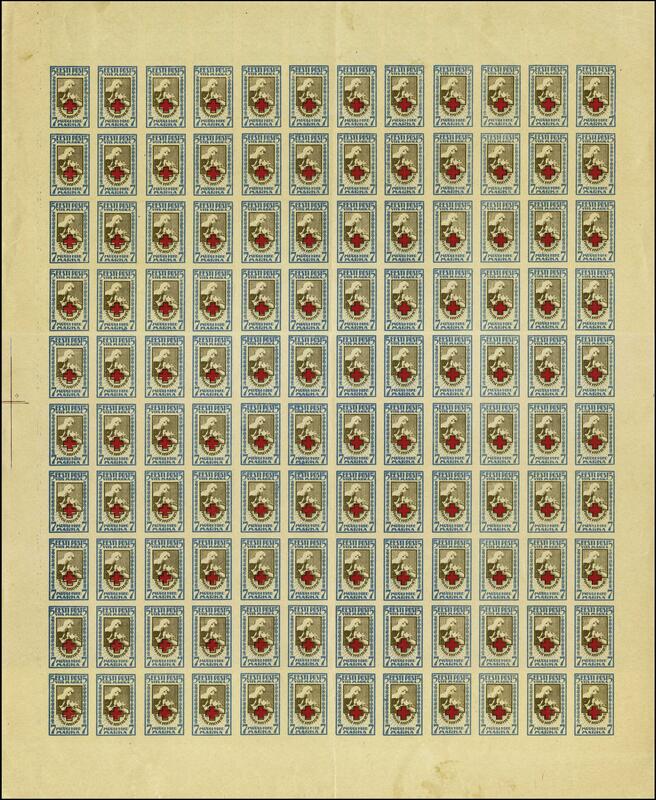 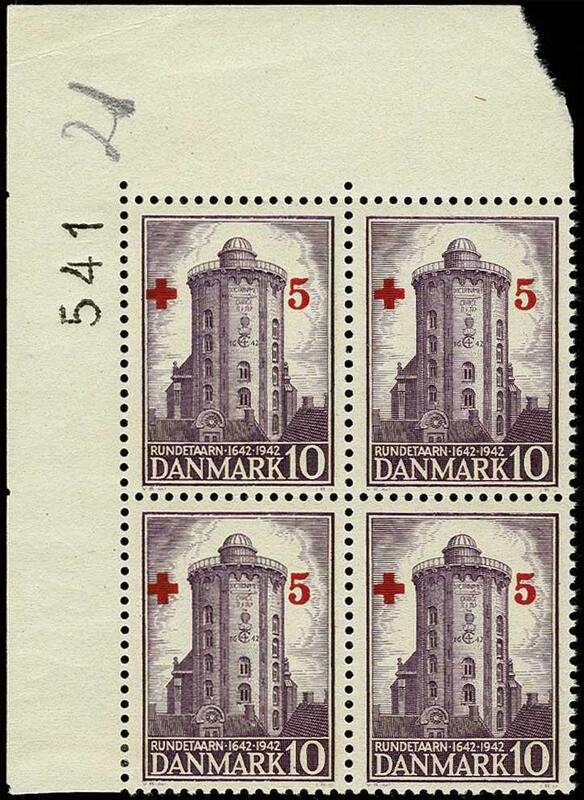 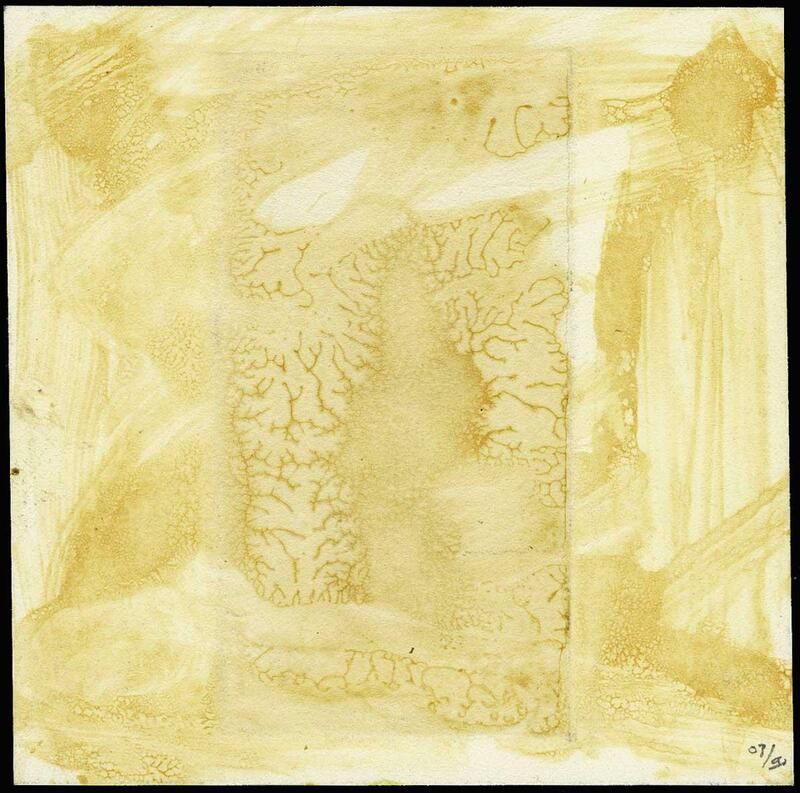 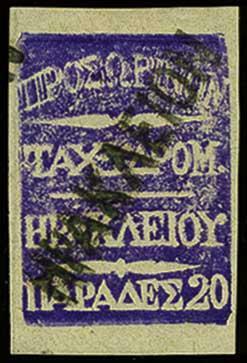 1880 (Circa), 1000r Dom Padro, Trial Color Essays, same unadopted design in four different colors, all die sunk on 3¾x5½" card, Very Fine. 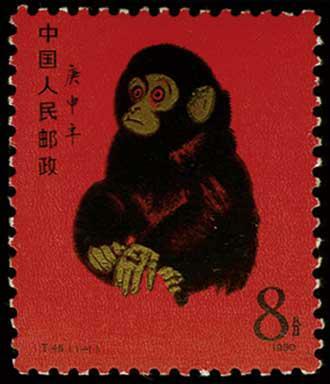 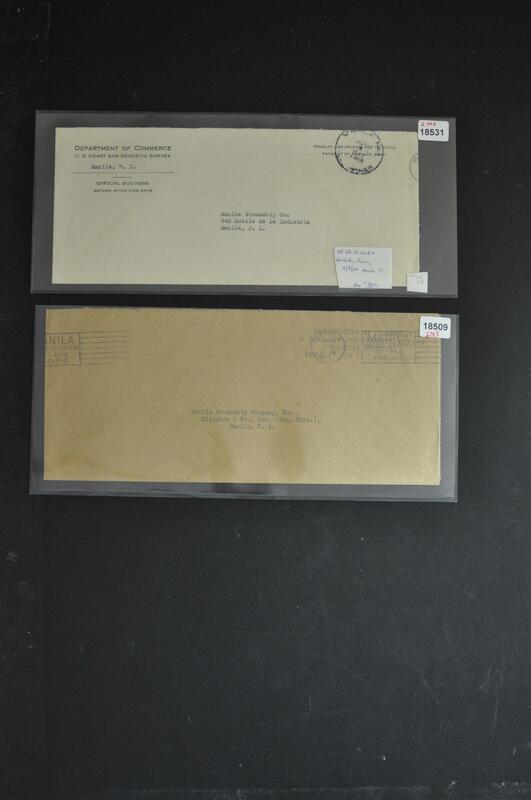 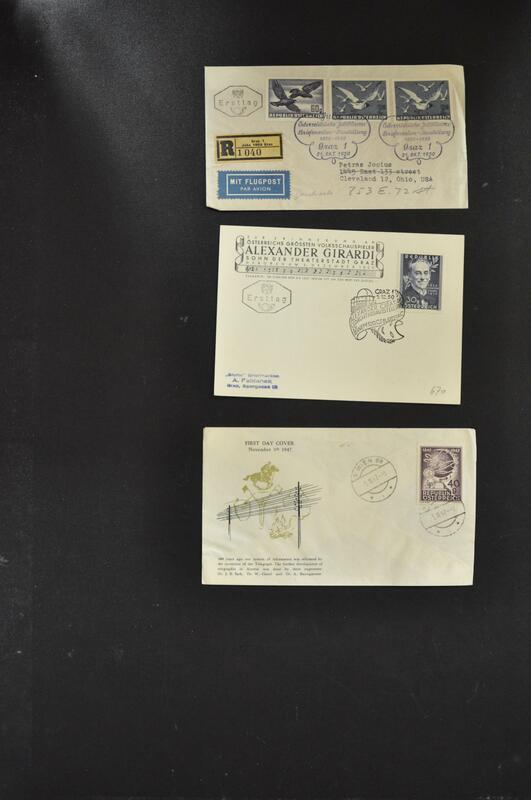 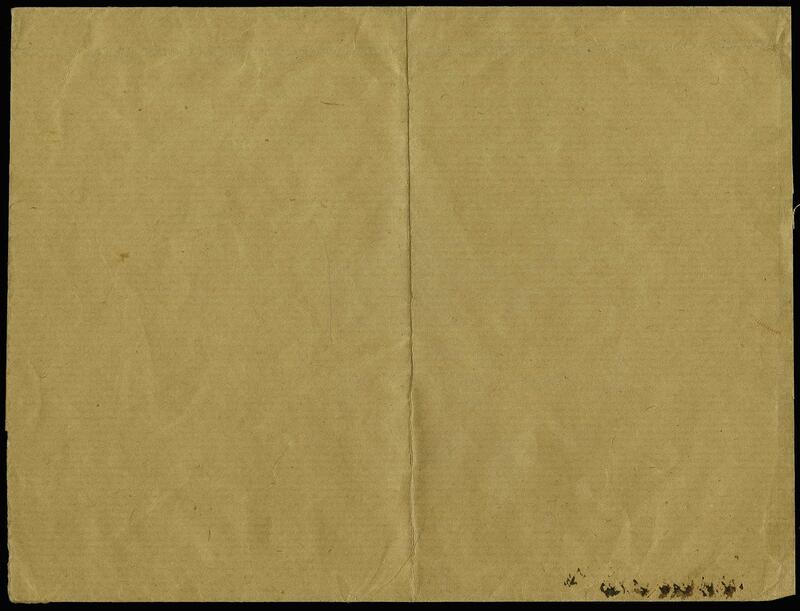 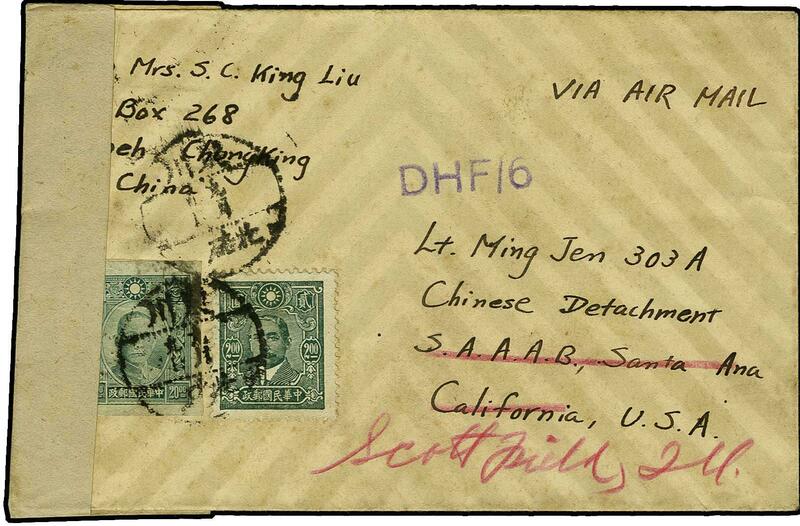 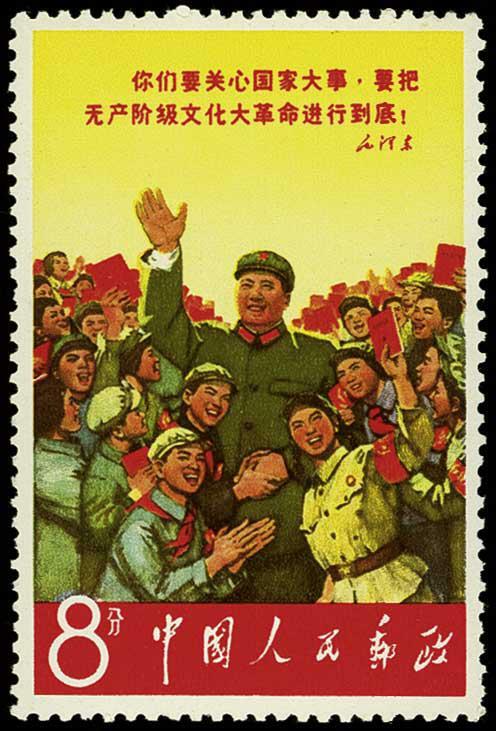 1945 Airmail Censored, CHUNGKING to Chinese Military Officer in USA, very interesting WW II cover franked with $20 Imperf + $2 Sun Yat-Sen, sent to Lt Ming Jen, 303A, attached to the Chinese Air Force Detachment in training at the Santa Ana Army Air Base (SAAAB) in California; forwarded to Scott Field, IL. 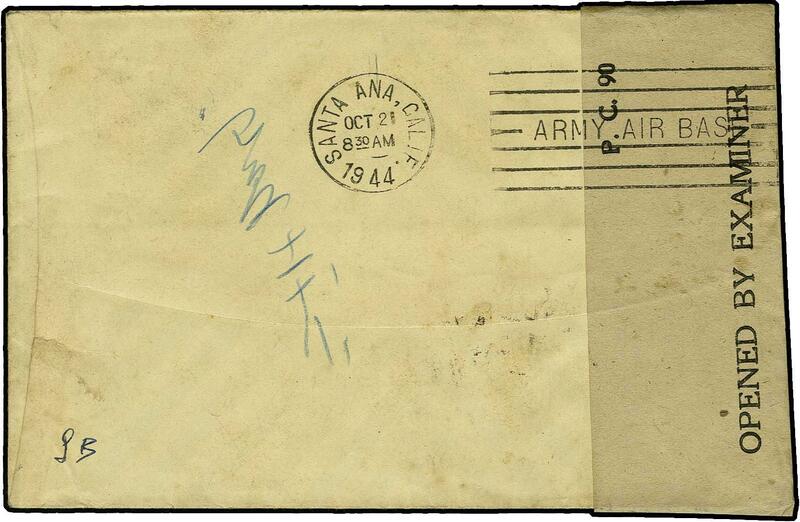 ; censored in transit at Calcutta, India (DHF/6); in September 1943, the SAAAB began to train Chinese Air Force officers to fly in WWII missions in Far East; also includes photograph of Lt Ming Jen. 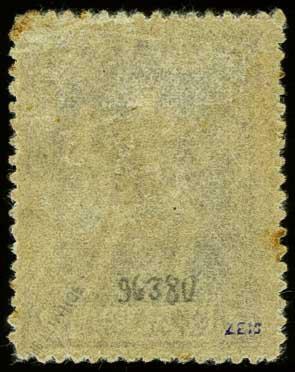 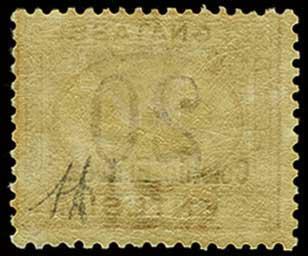 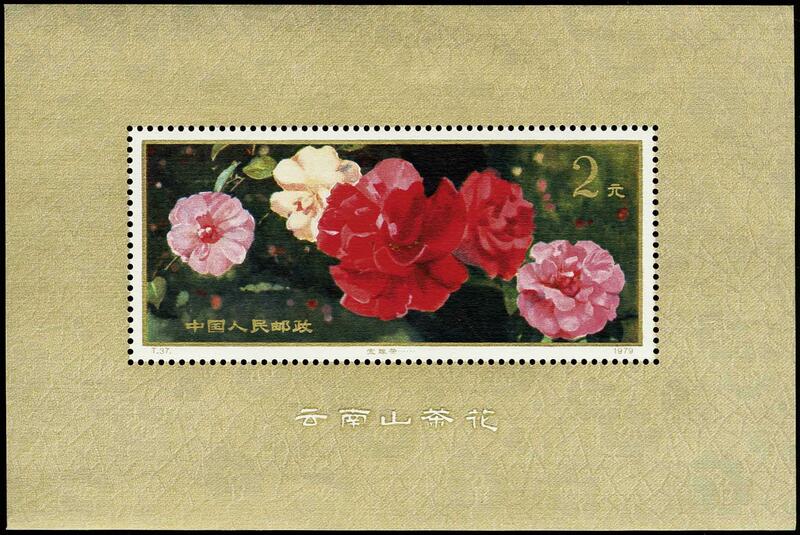 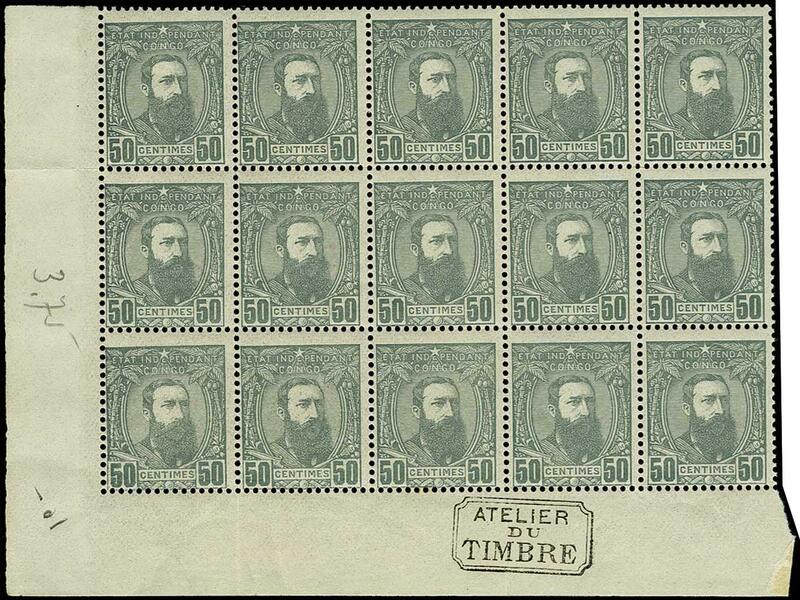 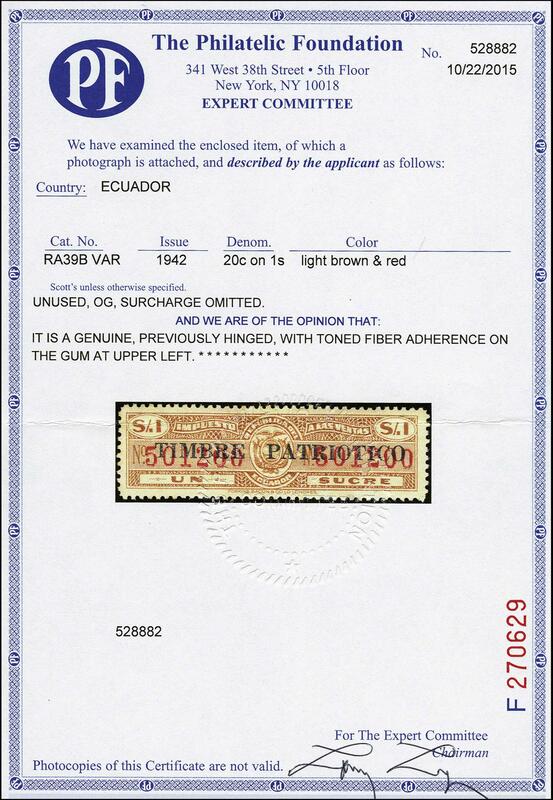 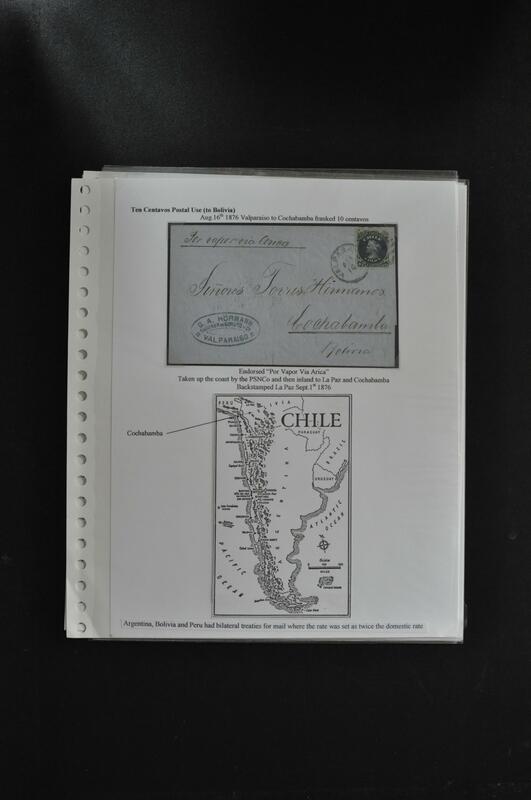 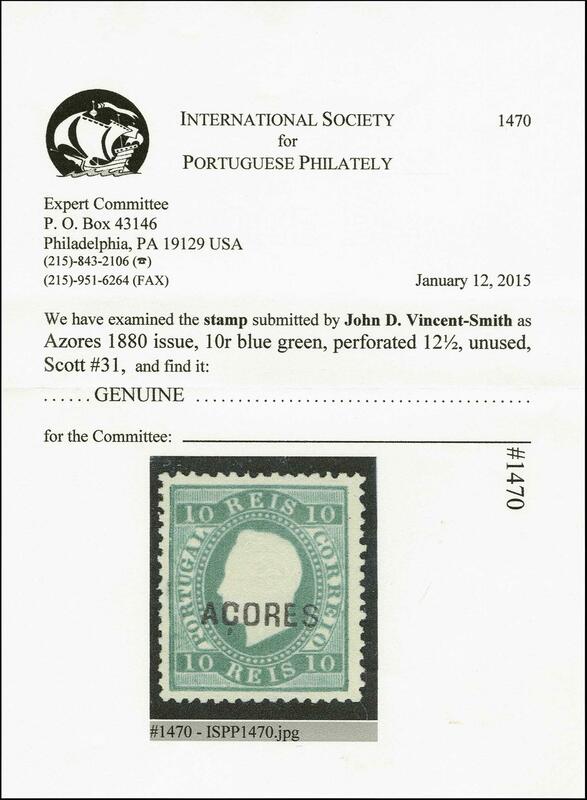 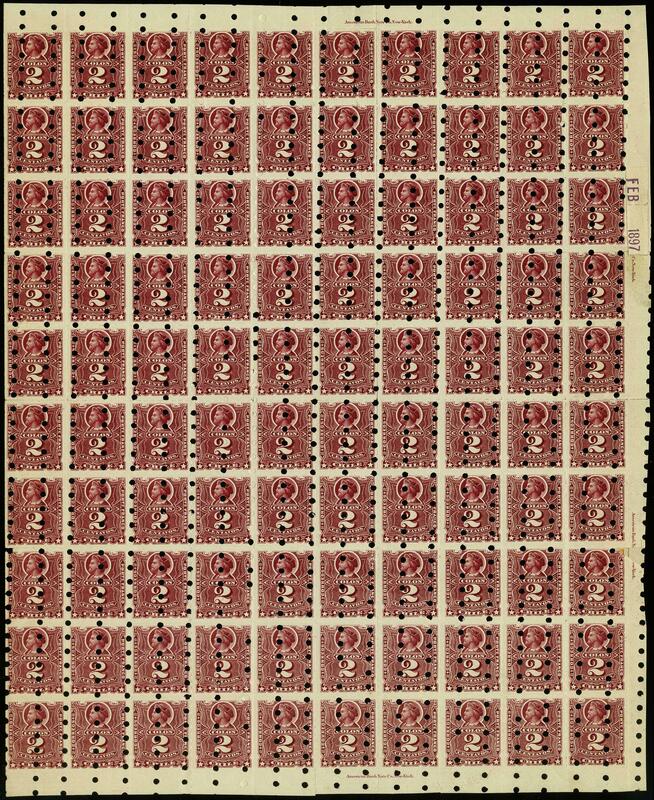 1540, 1979 $2 Rose Souviner Sheet, NH, Very Fine. 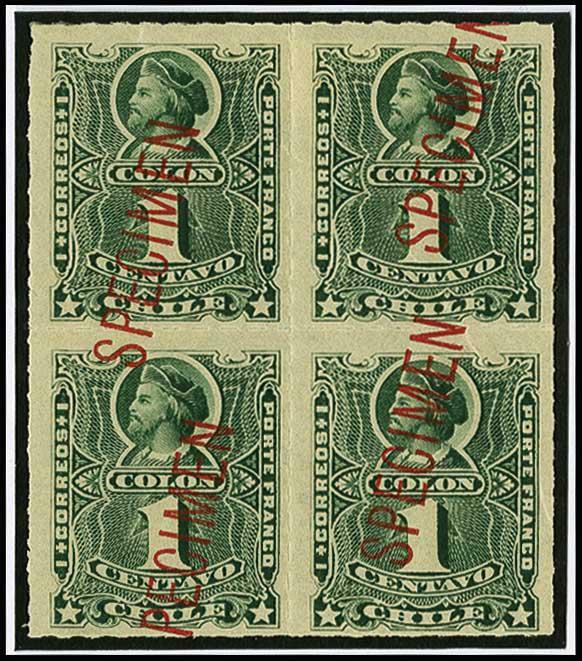 (Scott $240). 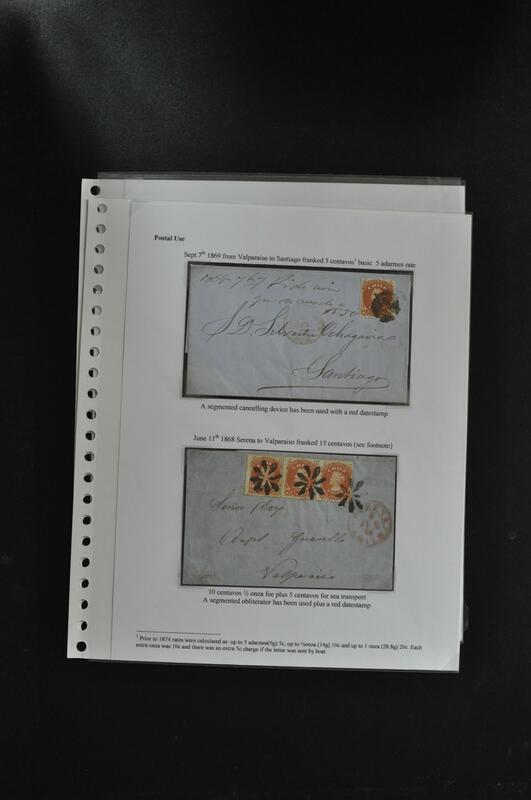 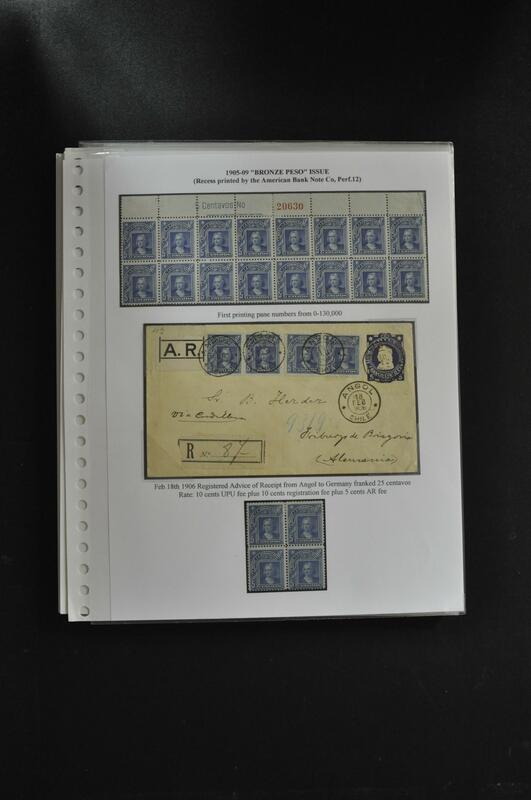 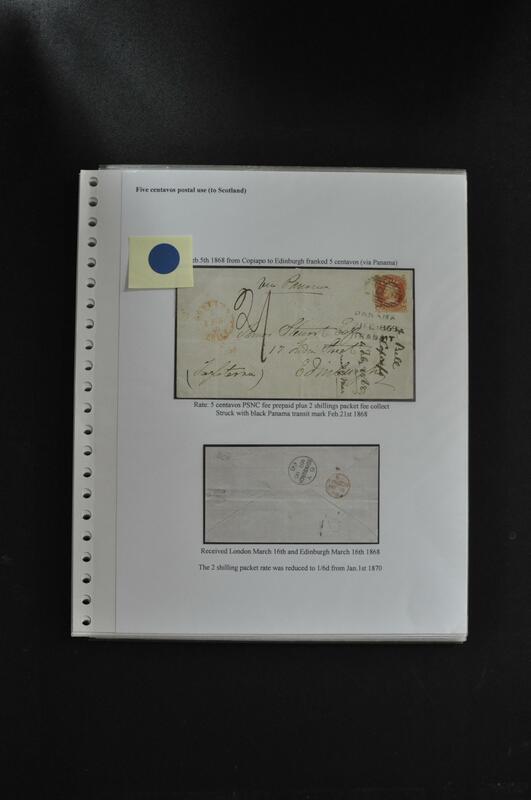 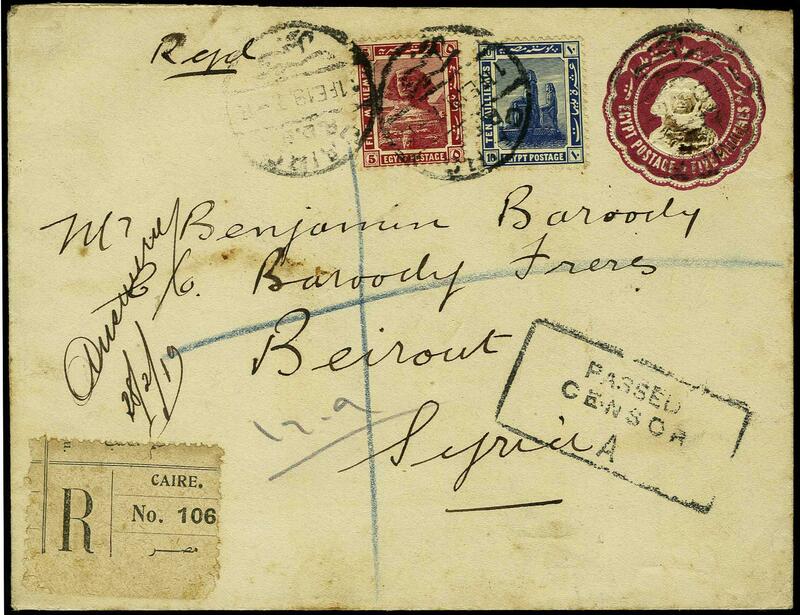 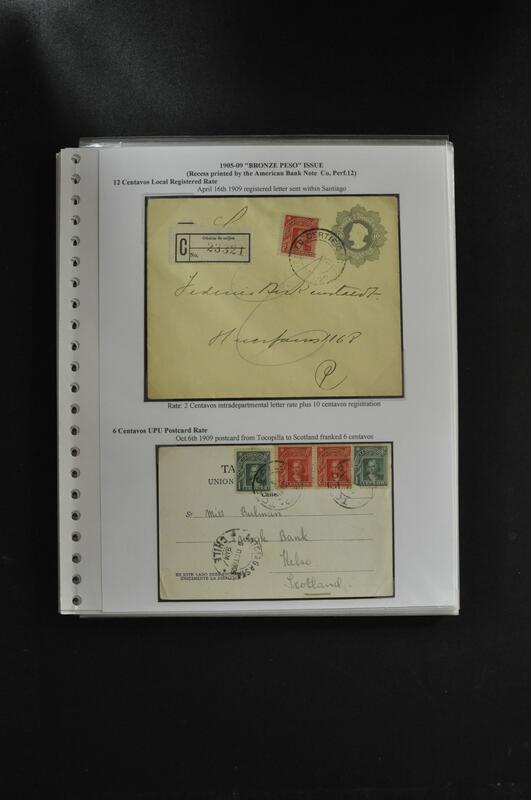 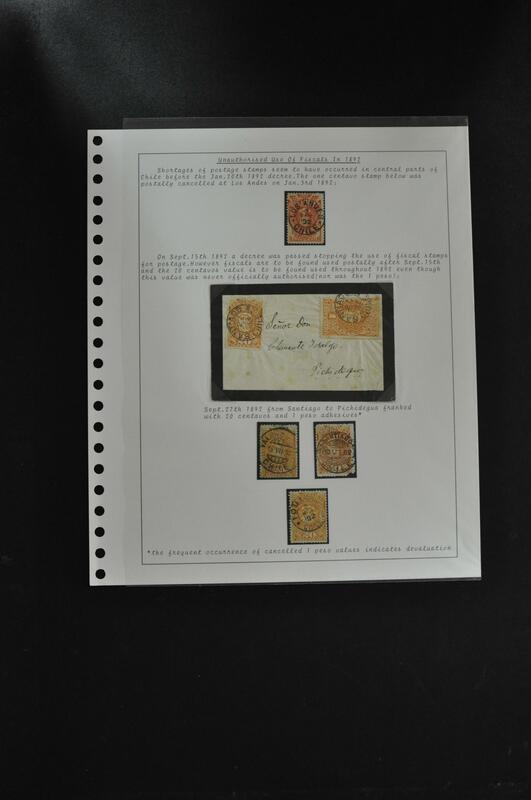 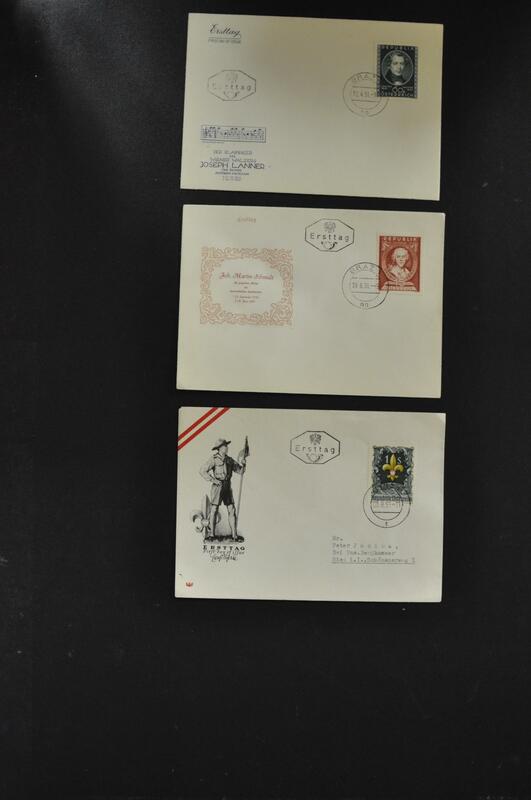 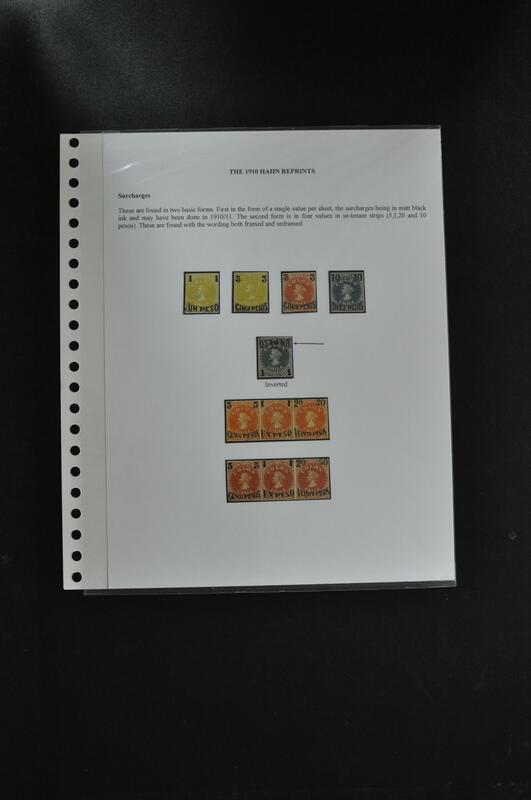 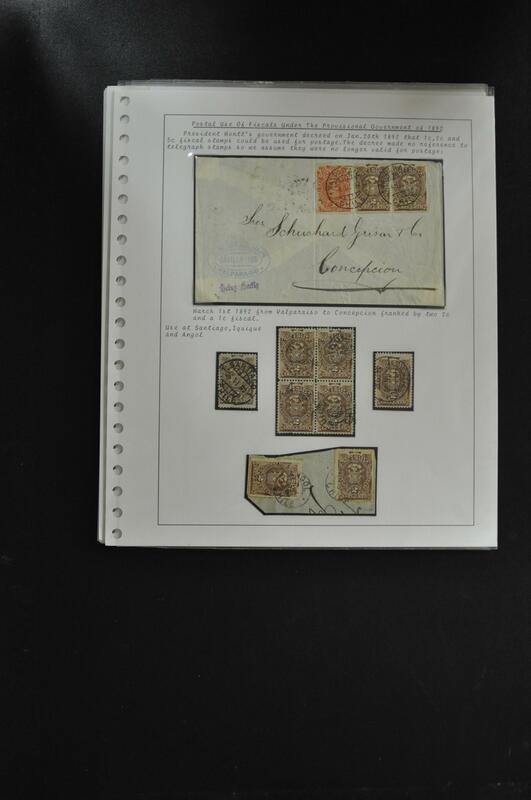 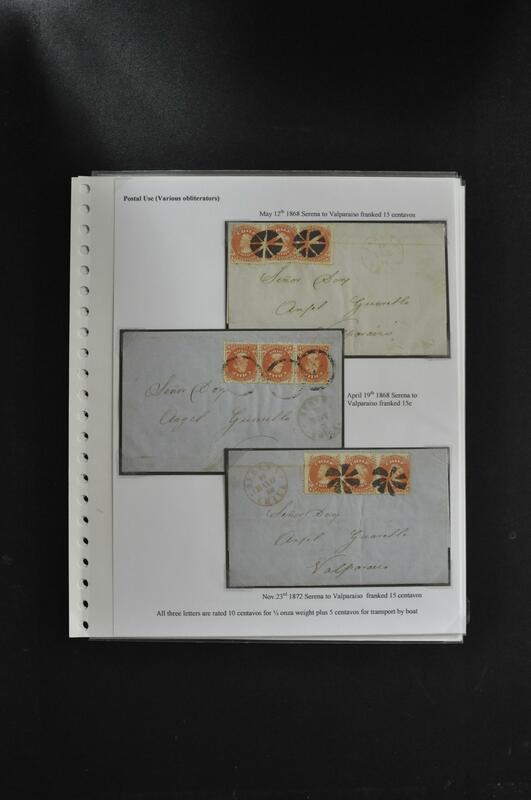 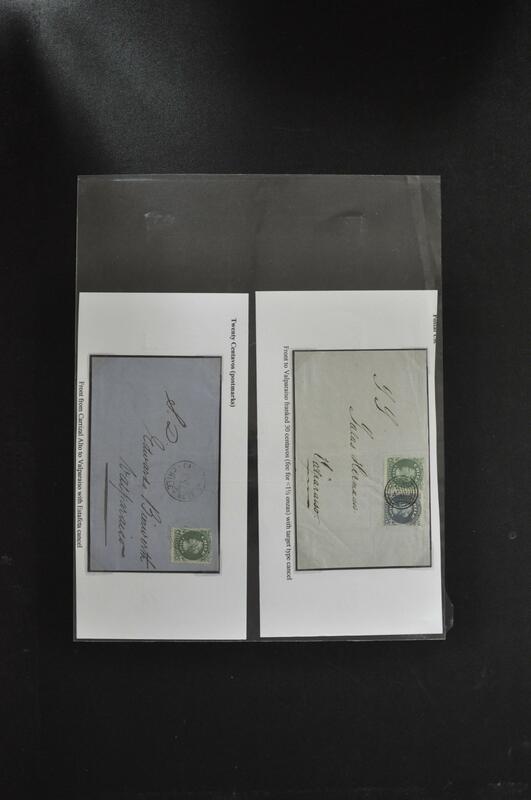 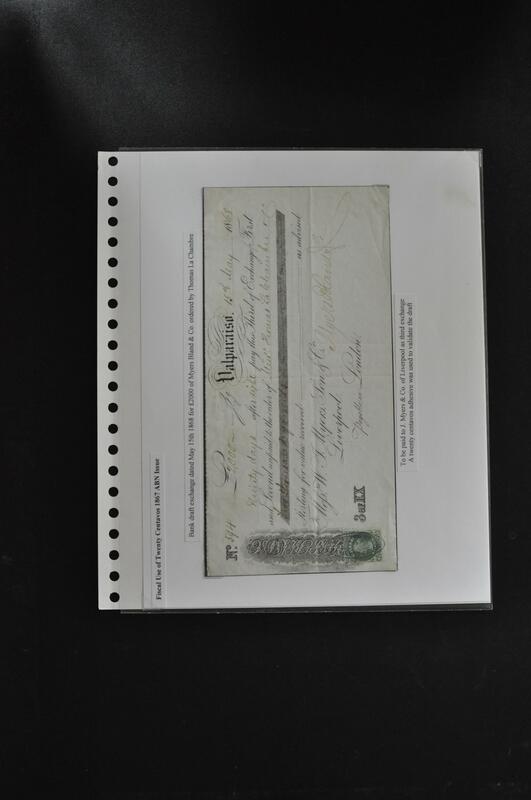 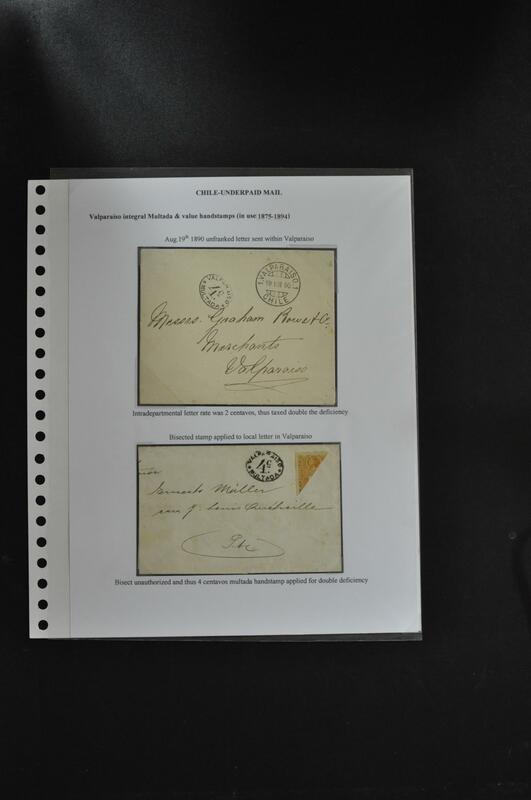 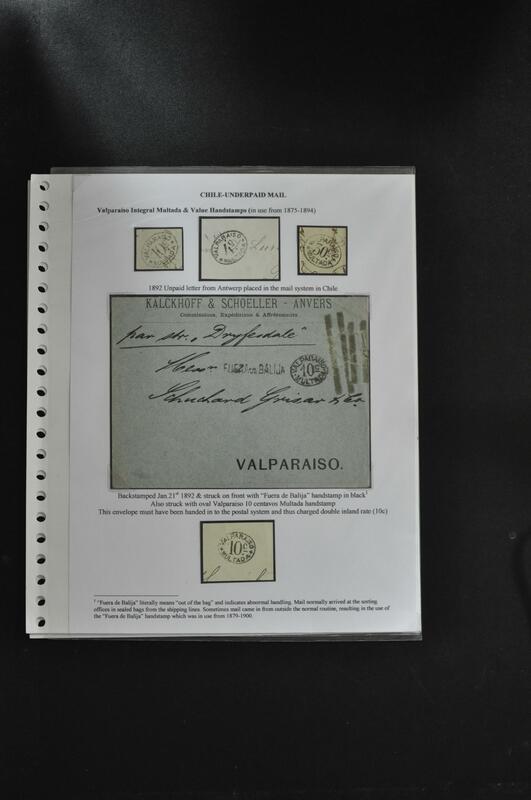 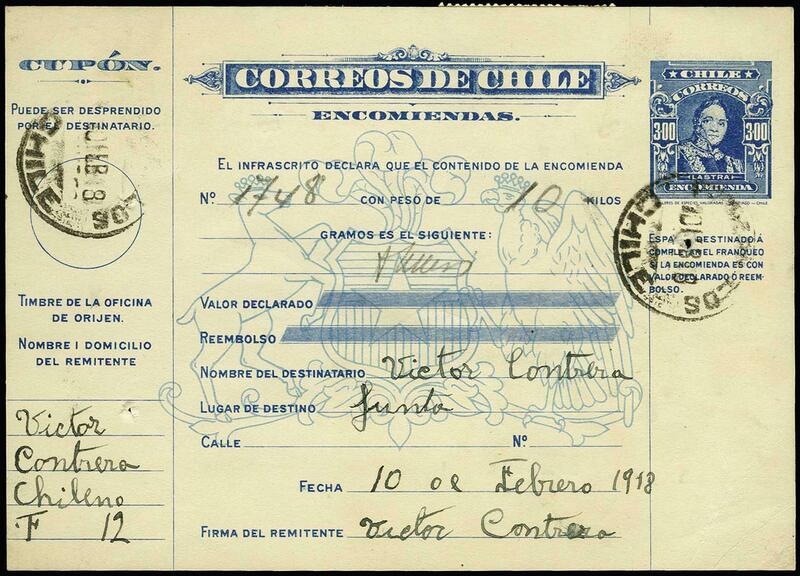 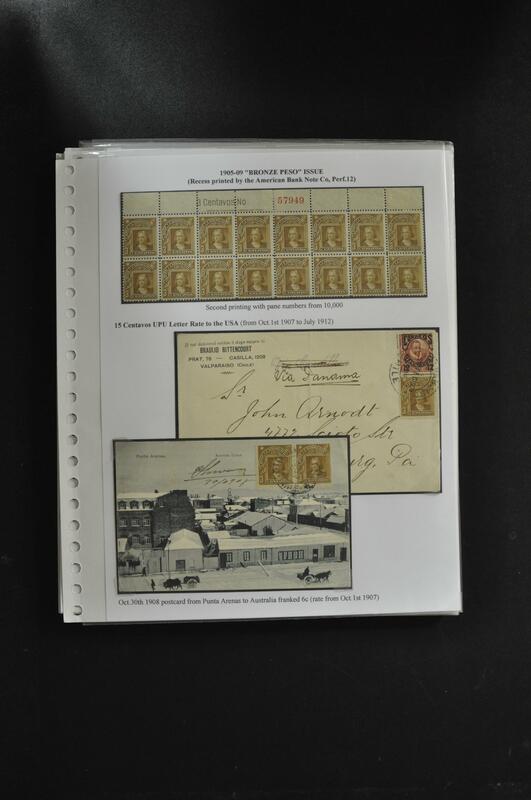 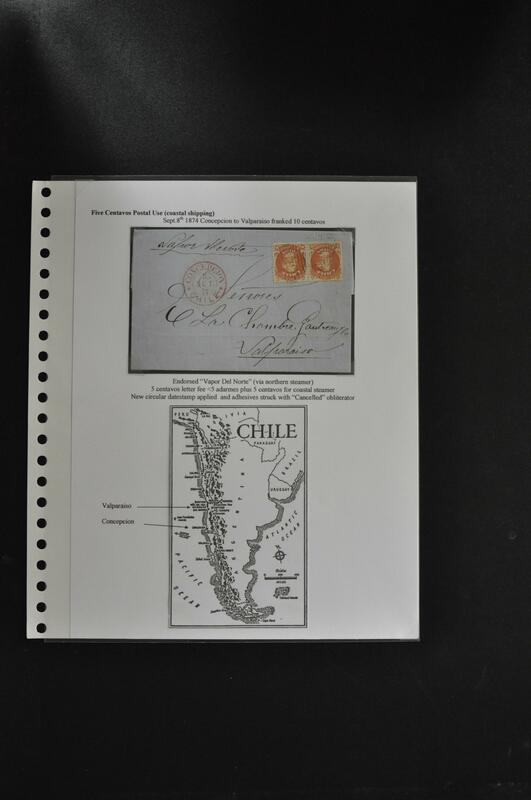 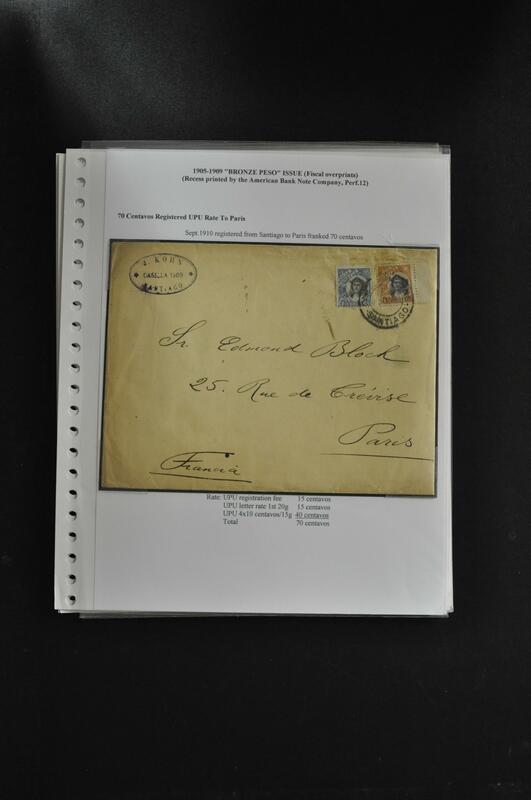 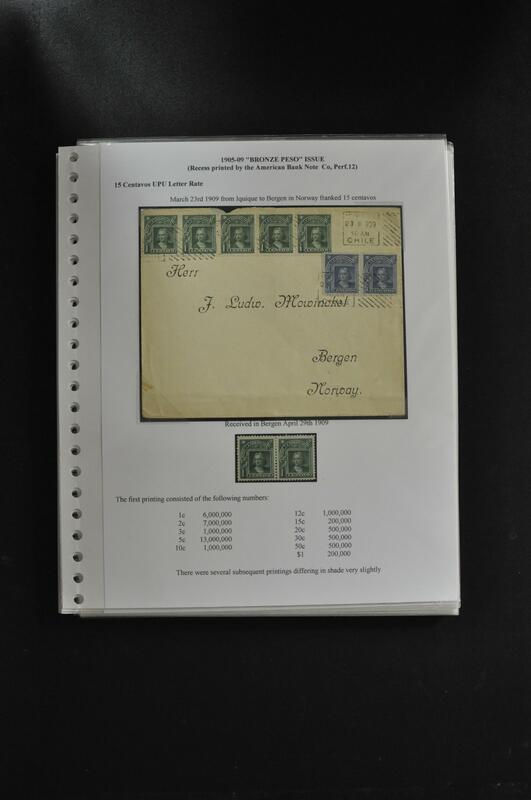 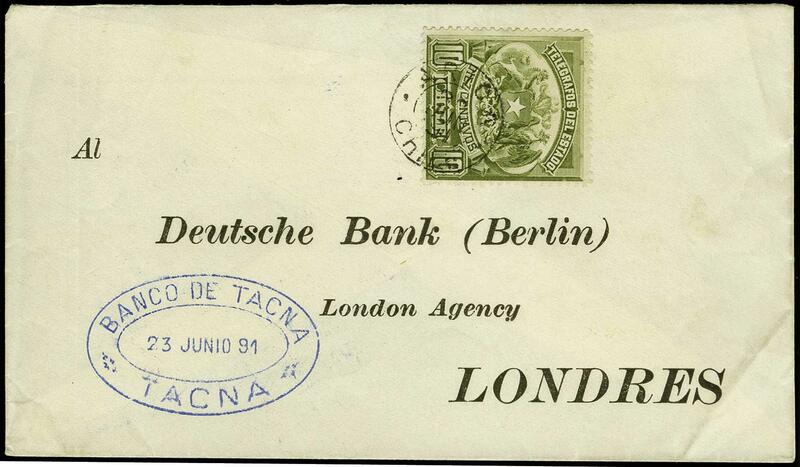 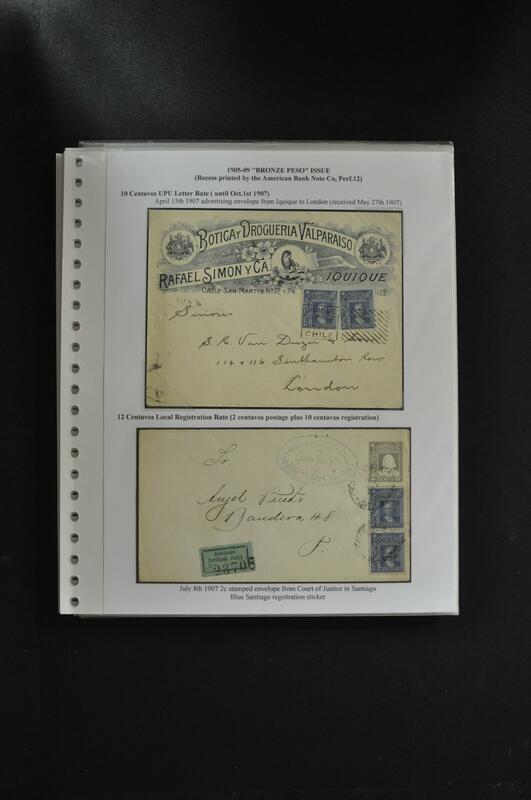 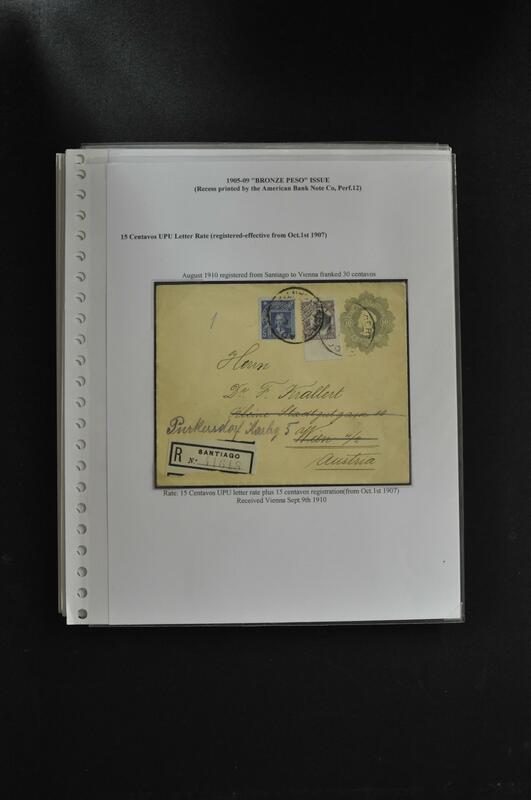 74P-82P, 1905 2l-5d on Proof Card, complete set printed directly on card, Bradbury, Wilkerson & Co. imprint, with gilded edges, backstamped "L' Inspecteur des Postes" and signed, Very Fine, most probably quite scarce. 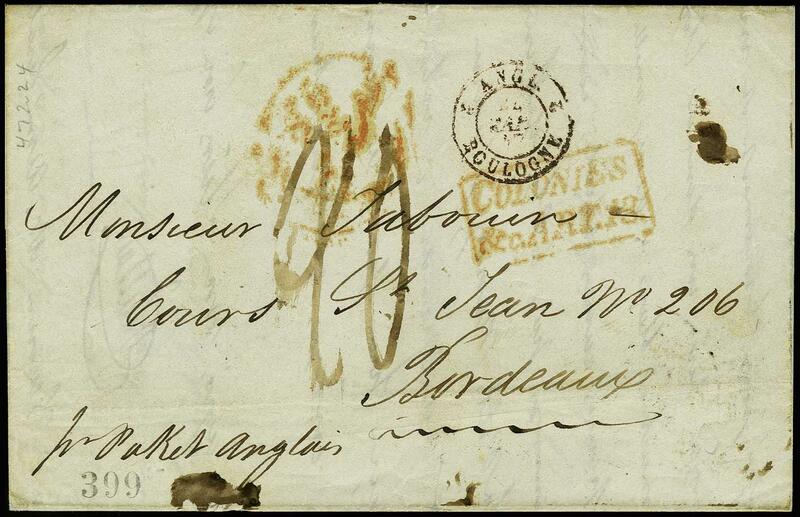 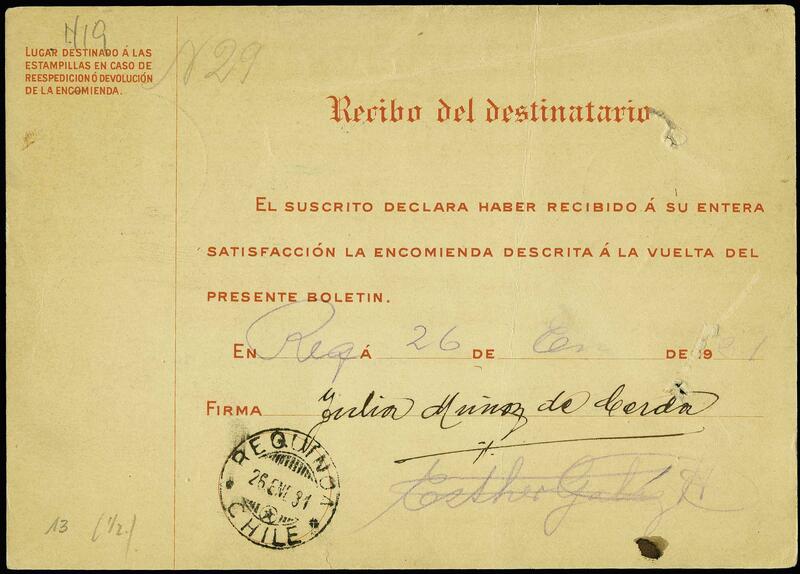 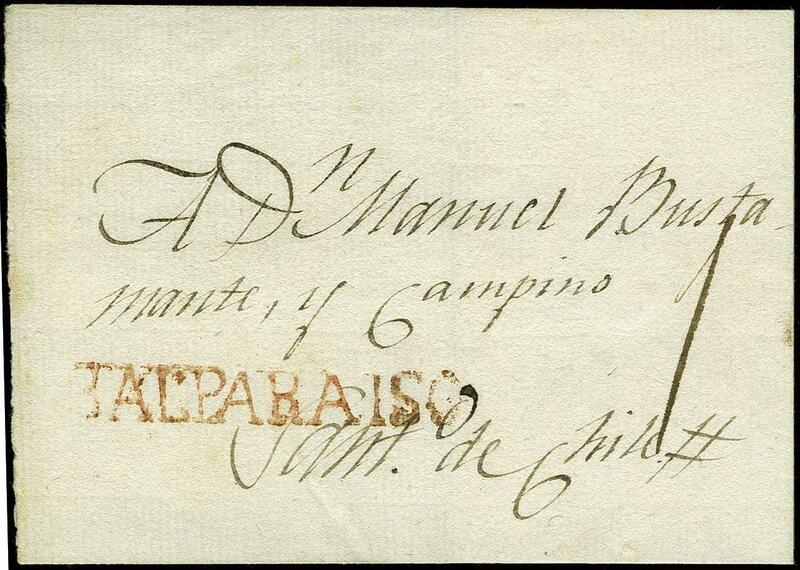 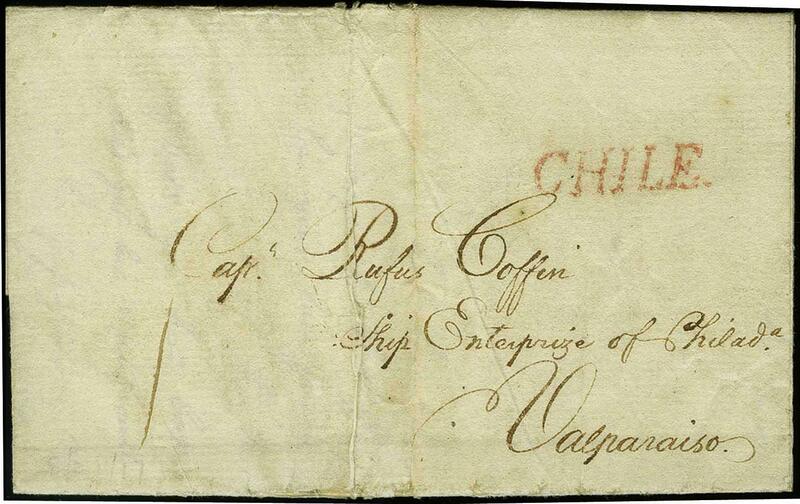 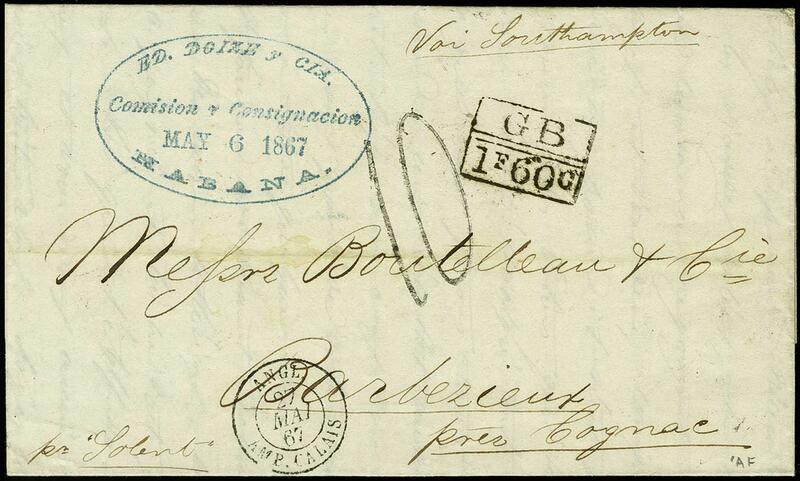 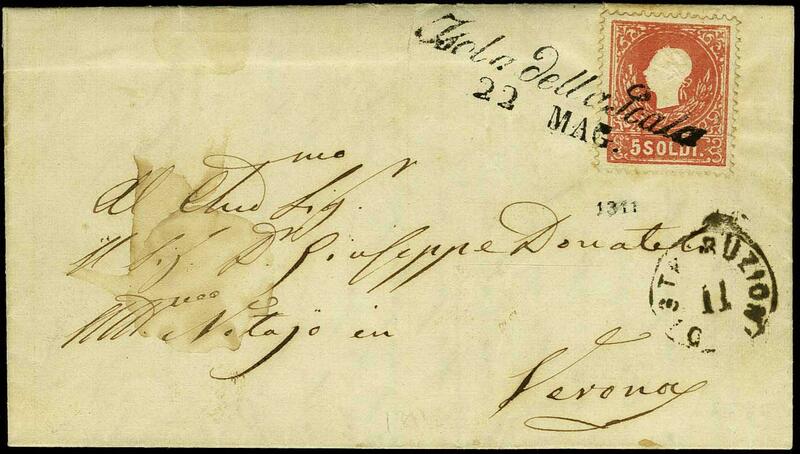 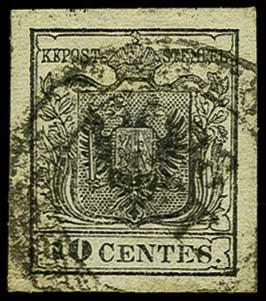 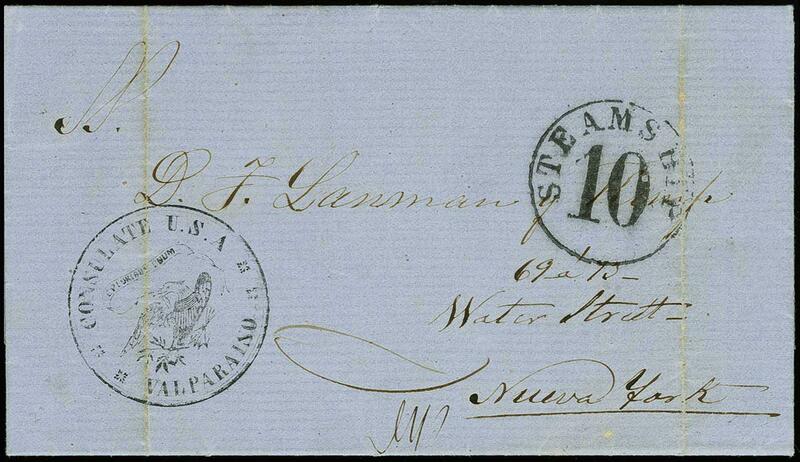 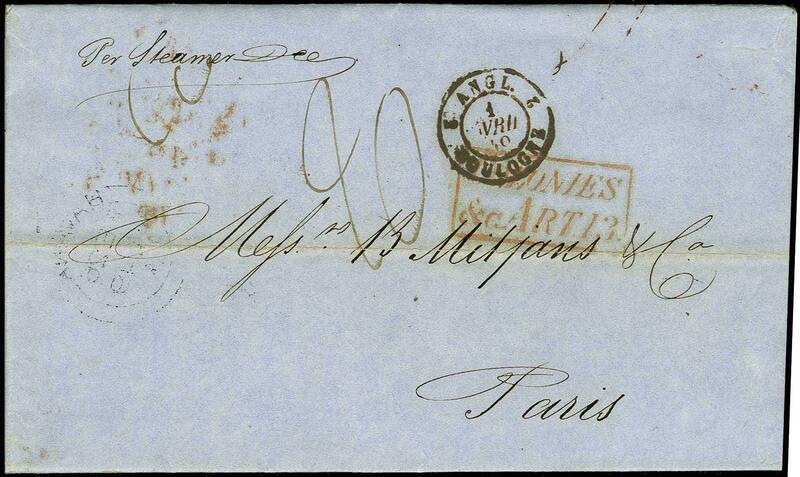 Cuban Stampless, 1828-75 seven stampless: 1828 FLS to Havana with red Puerto Principe straightline; 1830 FLS to Havana, Esperanza straightline; 1834 FLS to Havana, Villacura straightline; 1840 FLS to Havana, red Esperanza straightline; 1854 FLS with "Steamship 10"; same 1869; 1870 French packet to Edinburgh, generally very Fine. 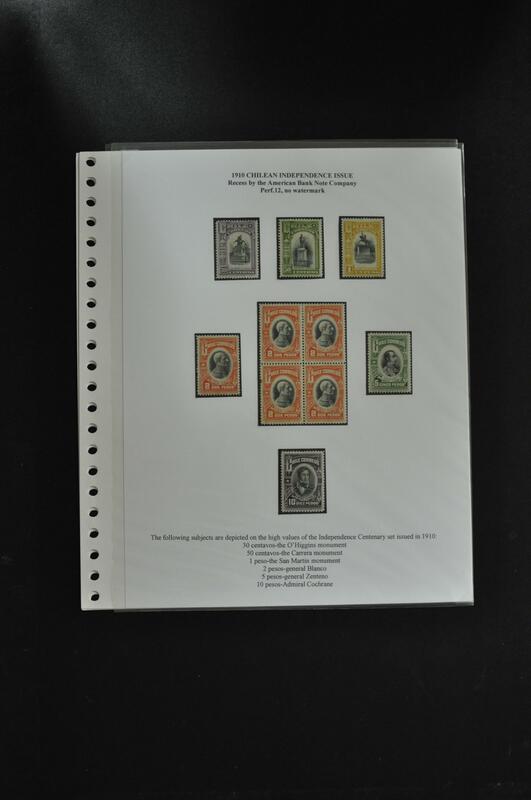 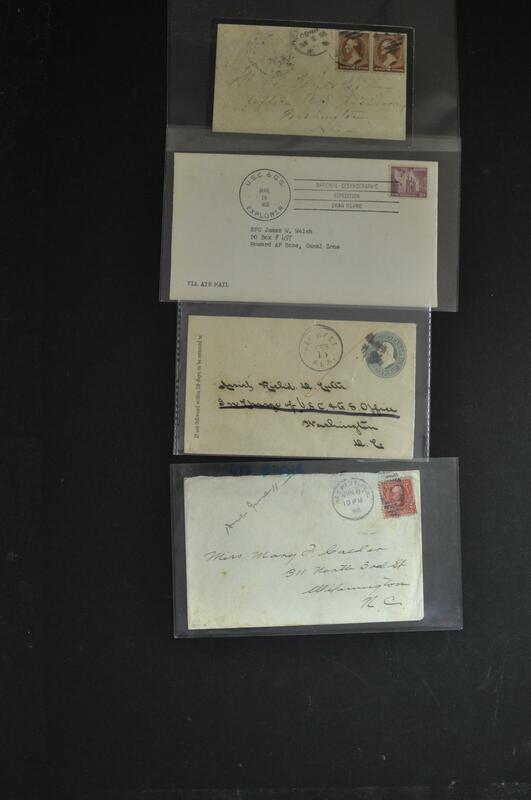 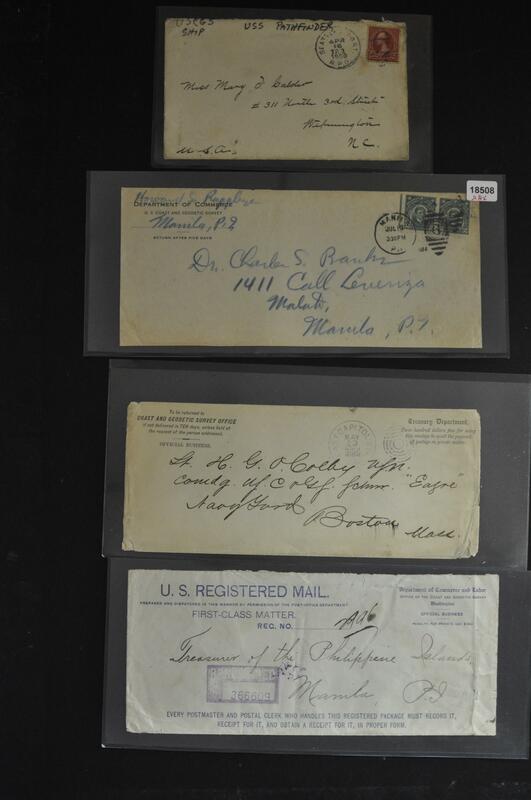 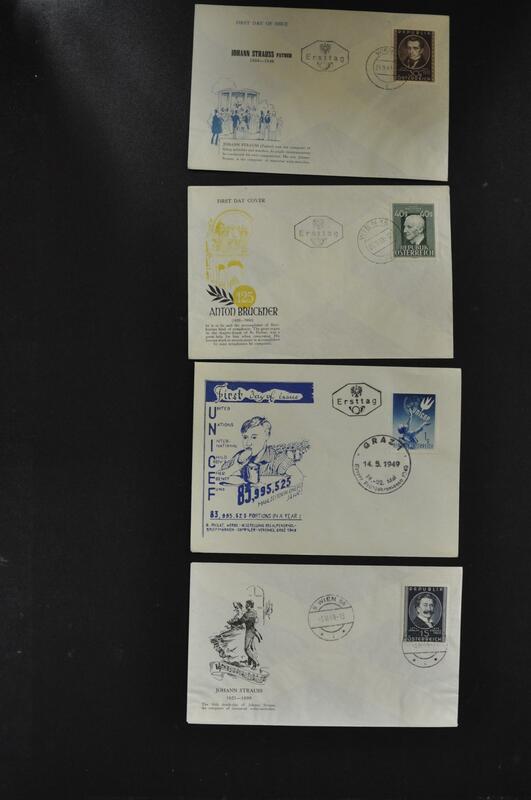 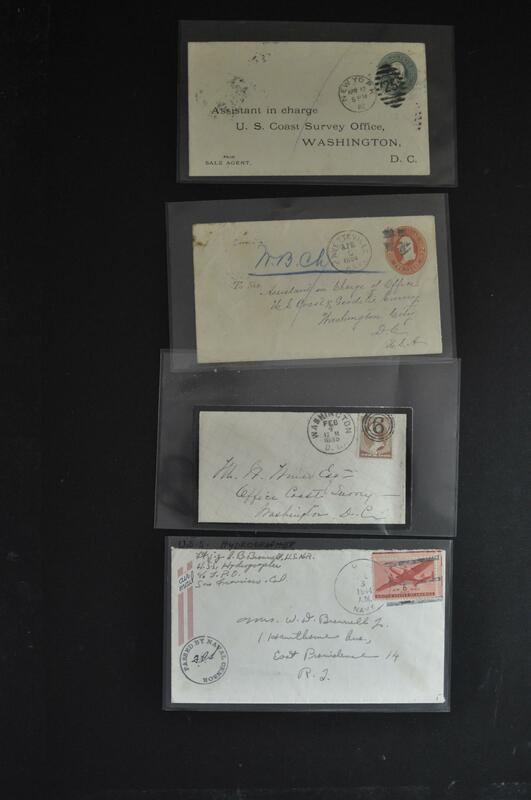 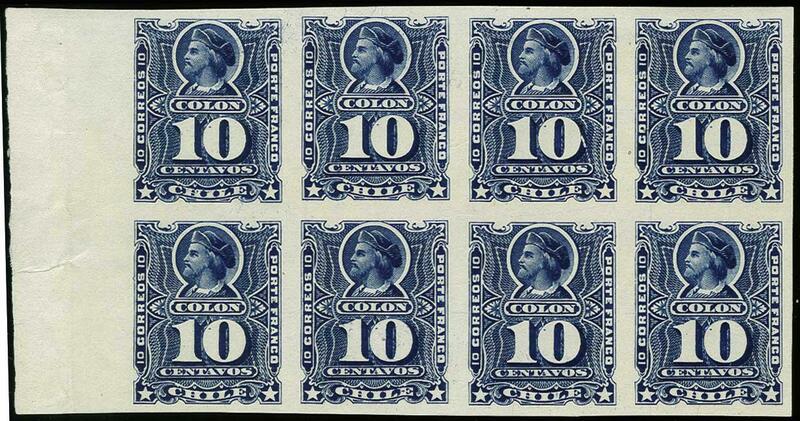 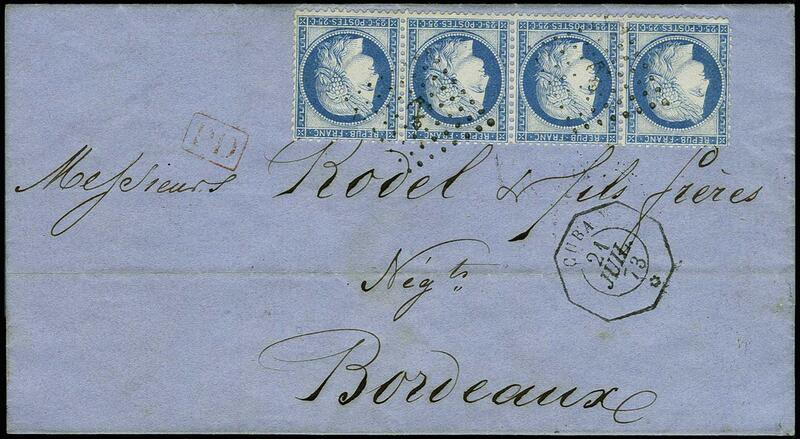 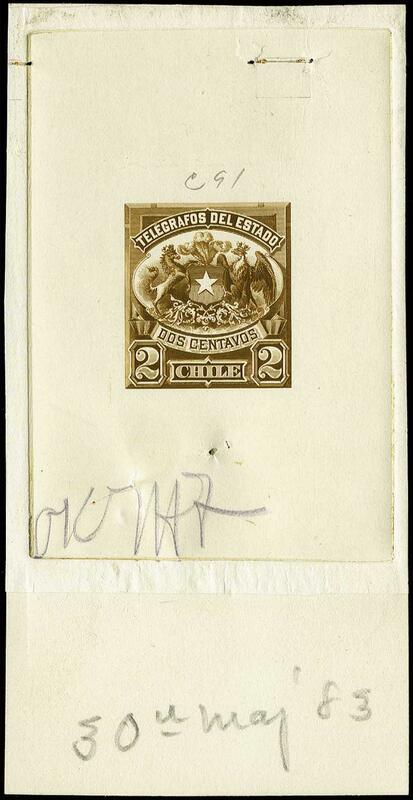 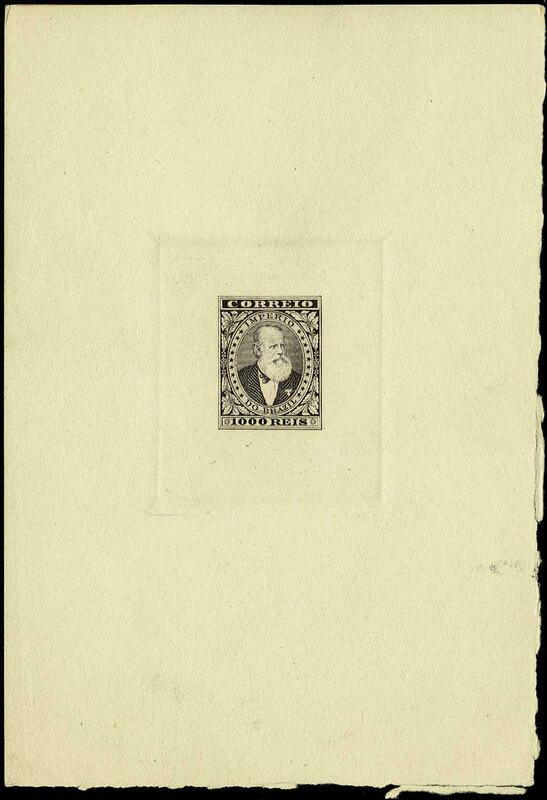 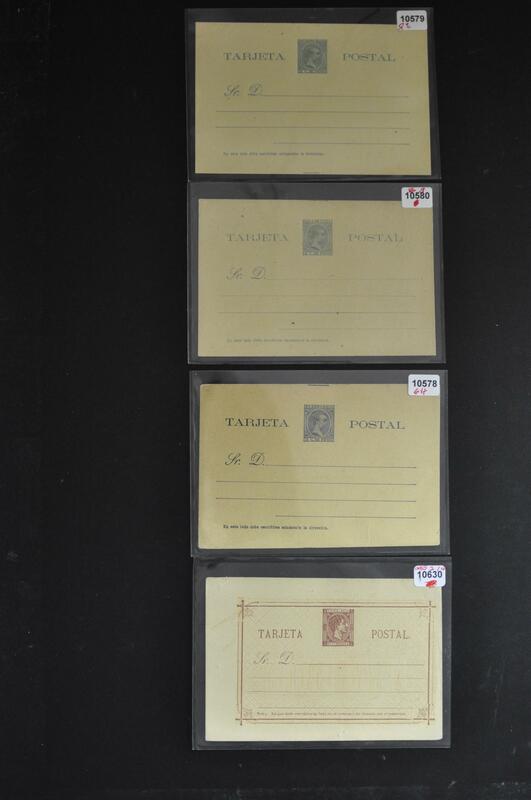 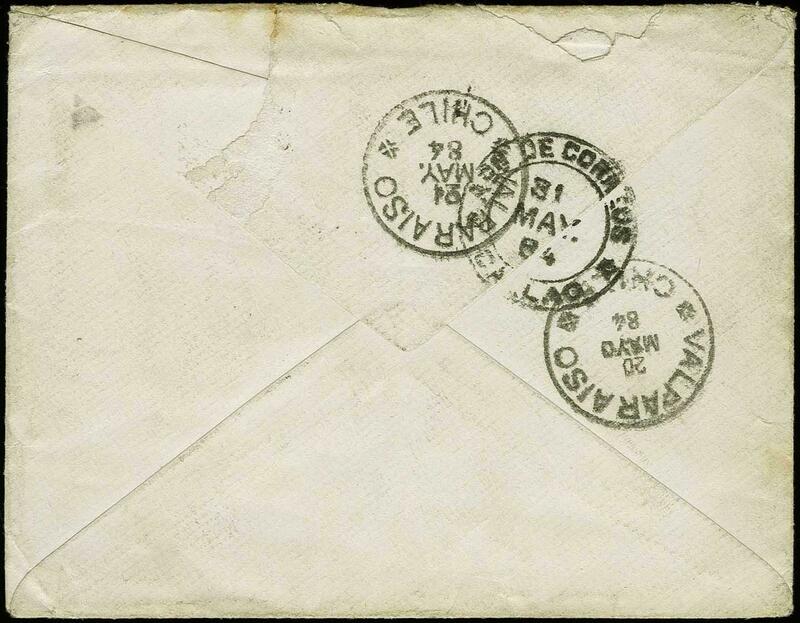 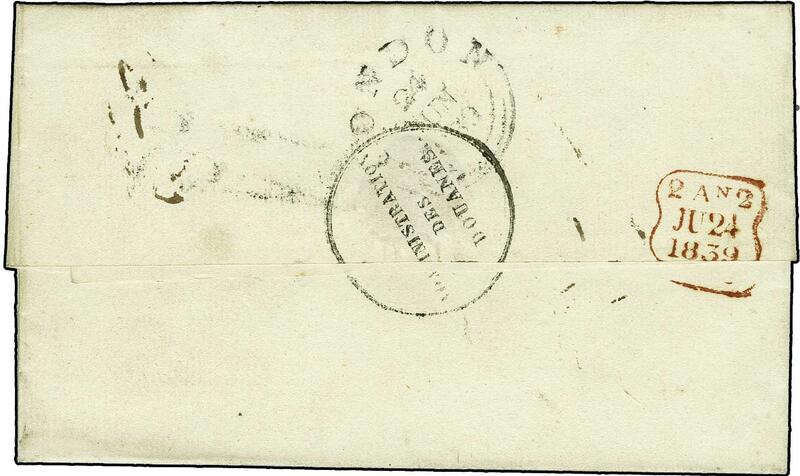 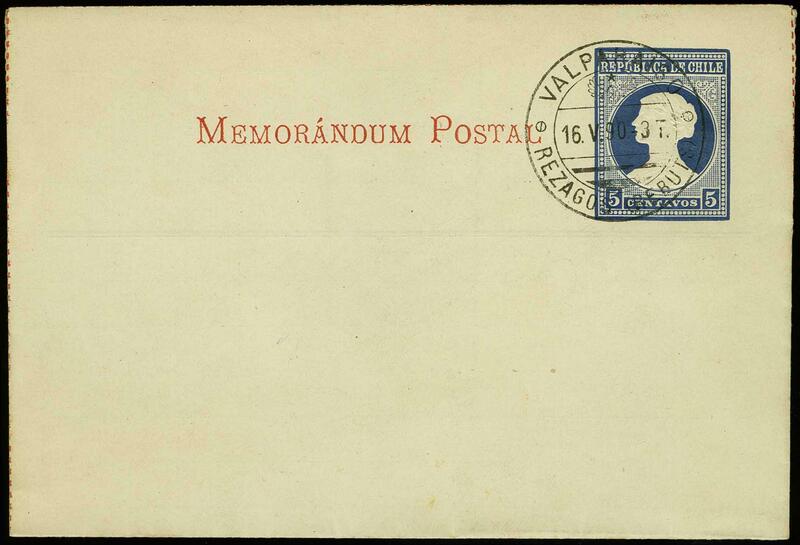 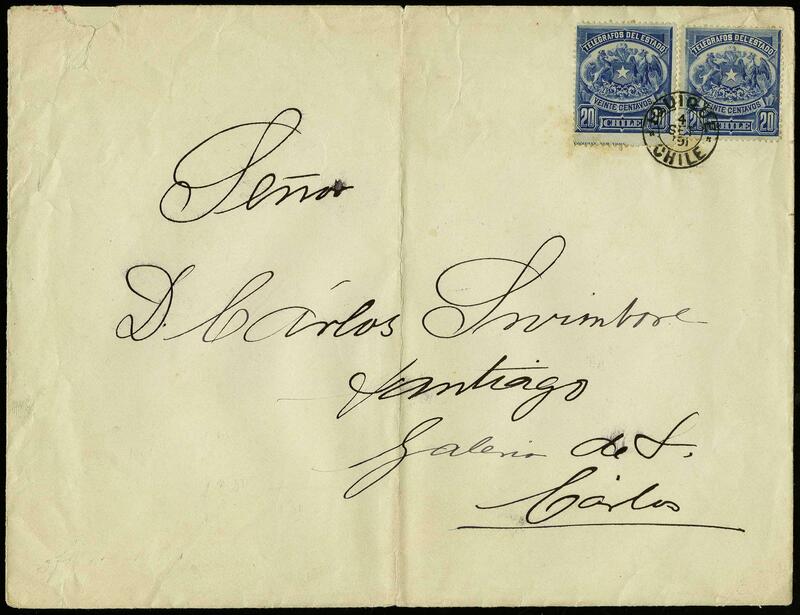 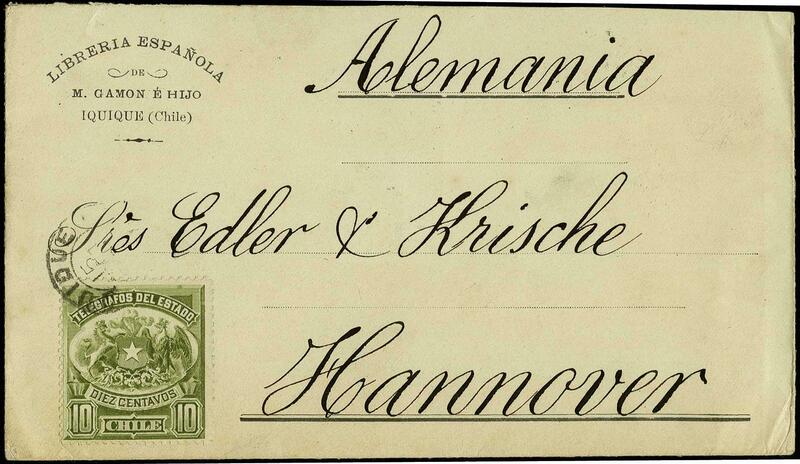 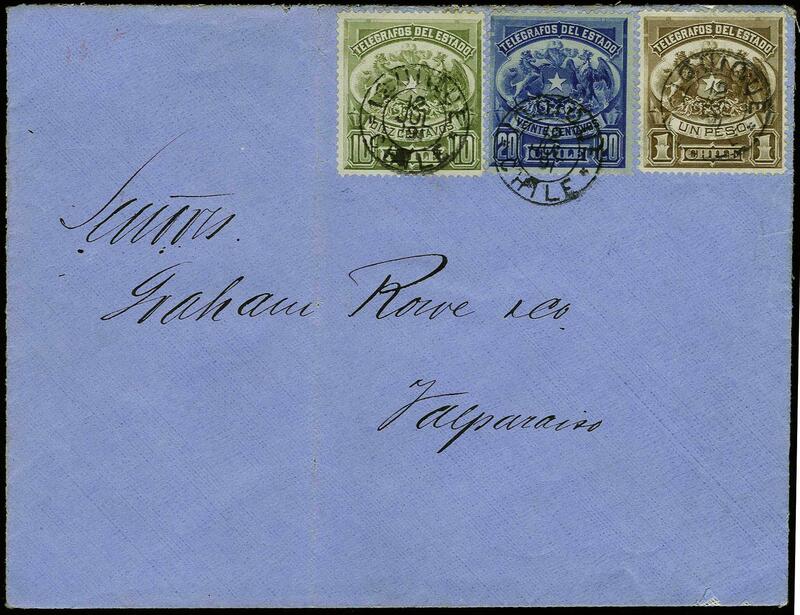 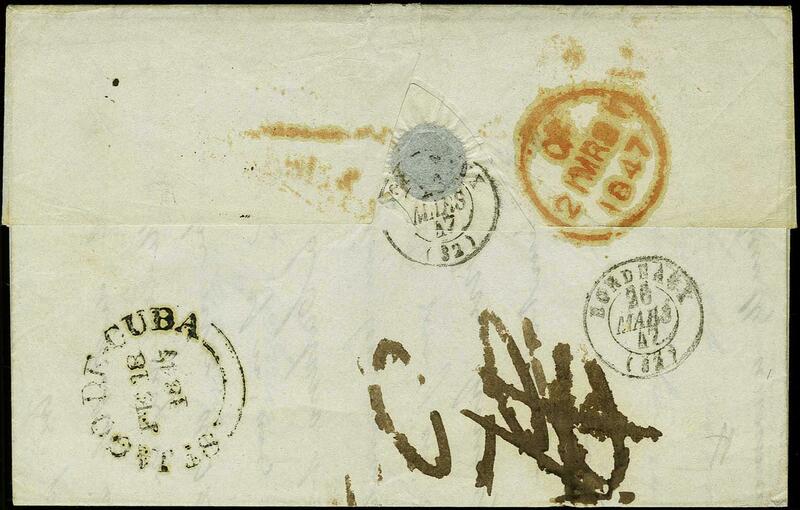 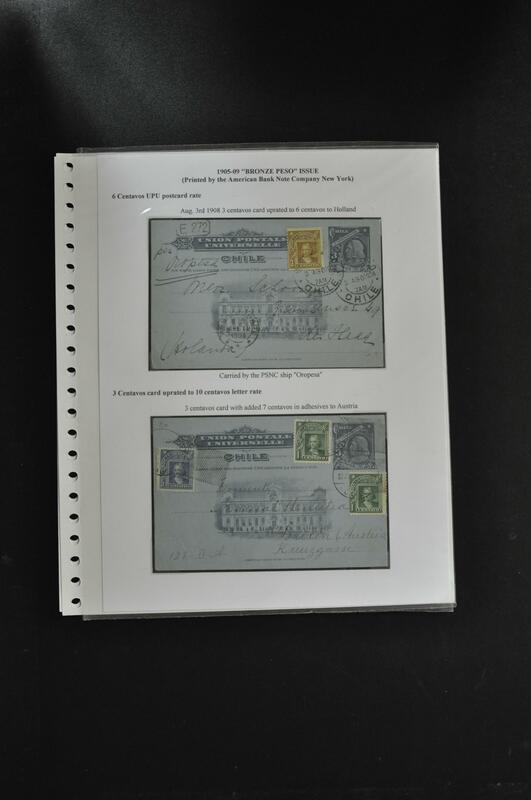 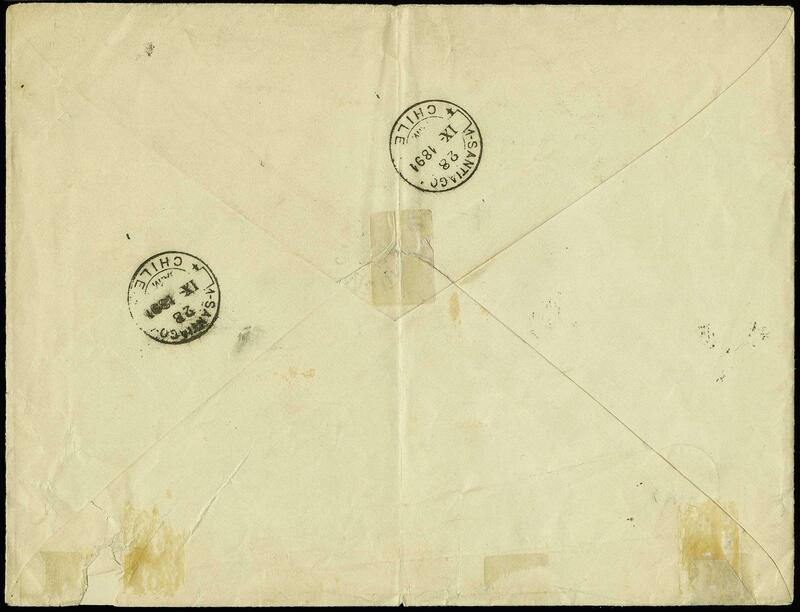 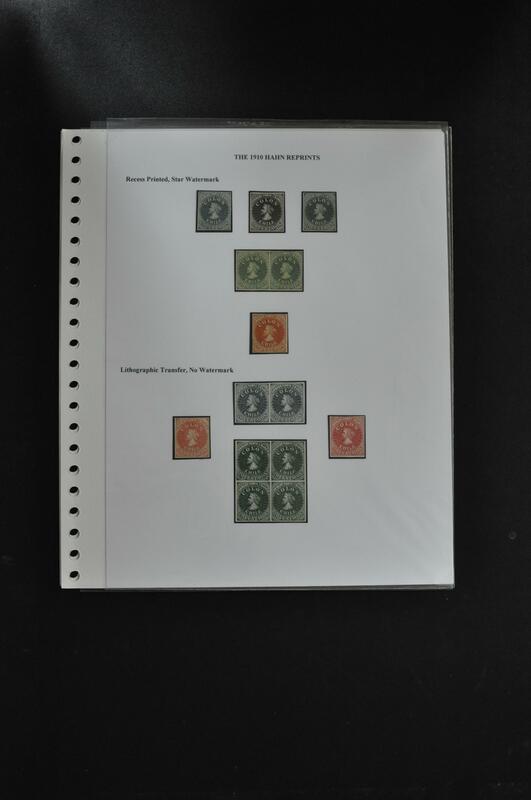 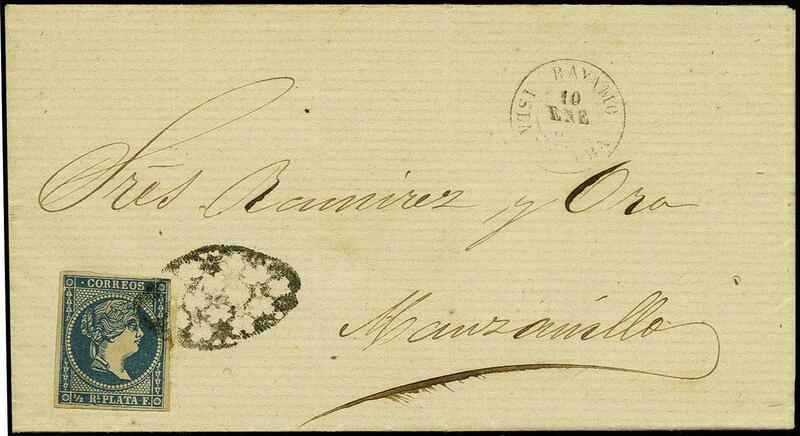 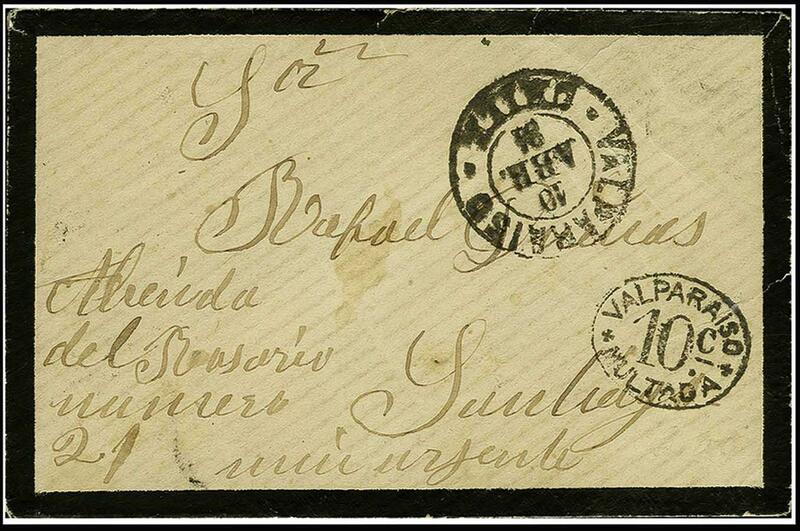 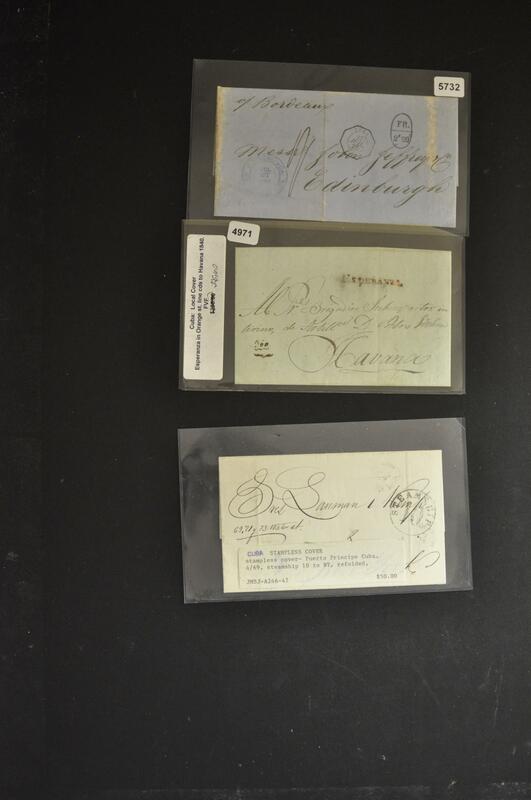 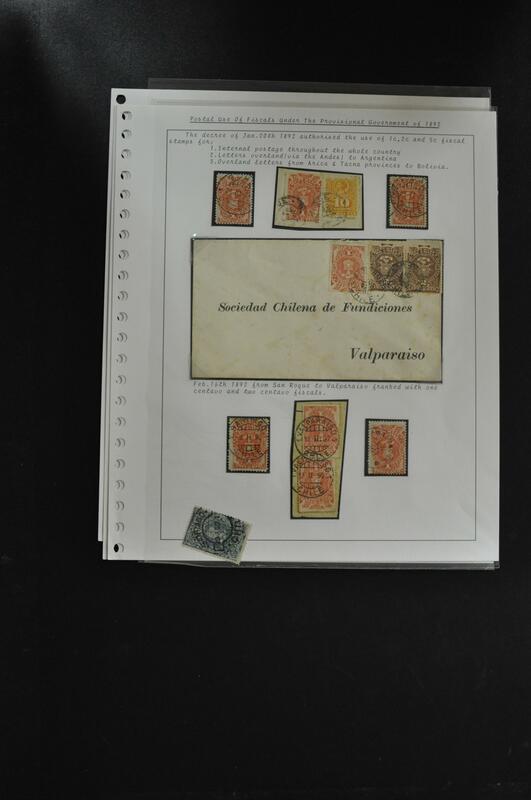 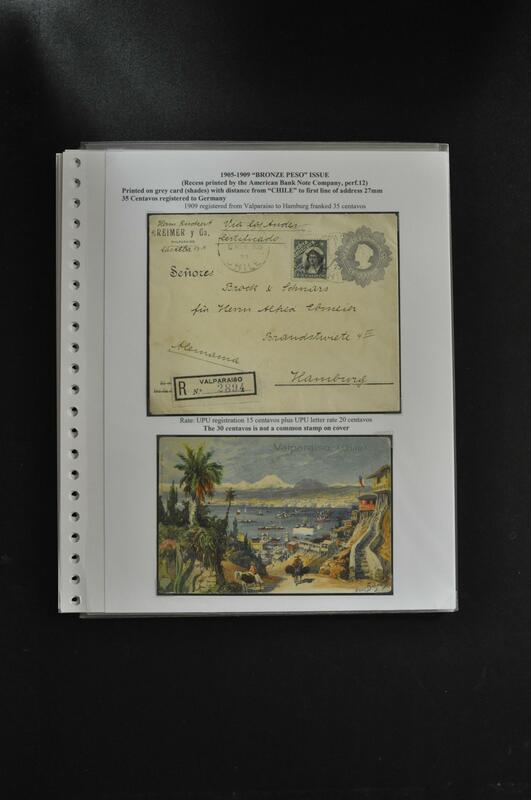 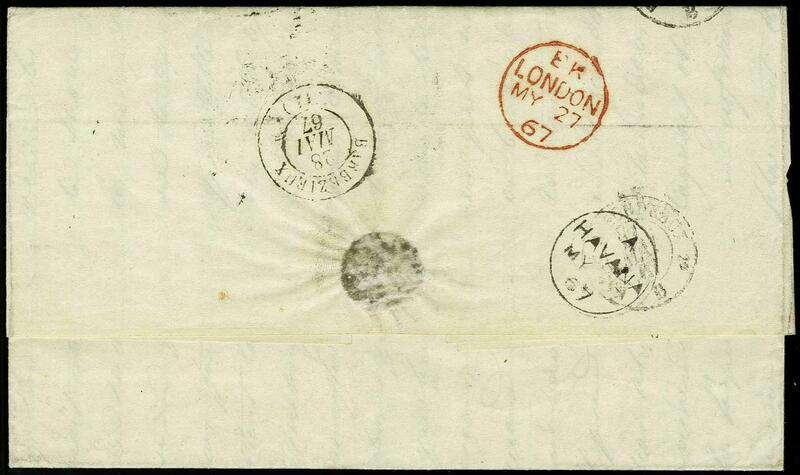 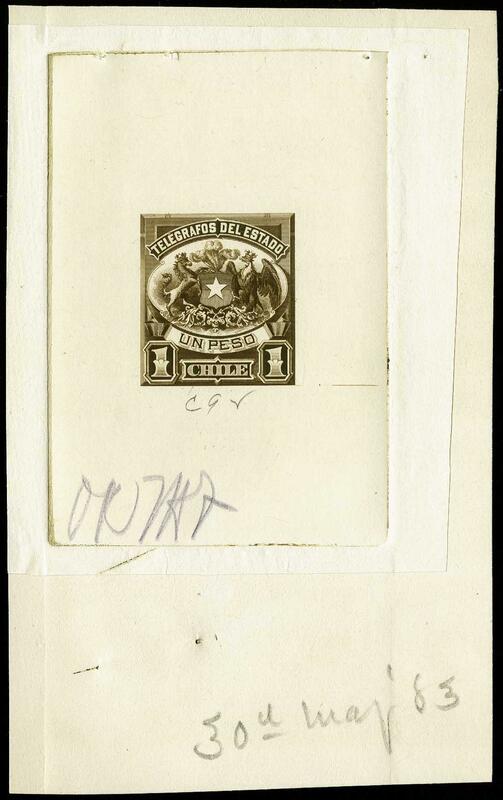 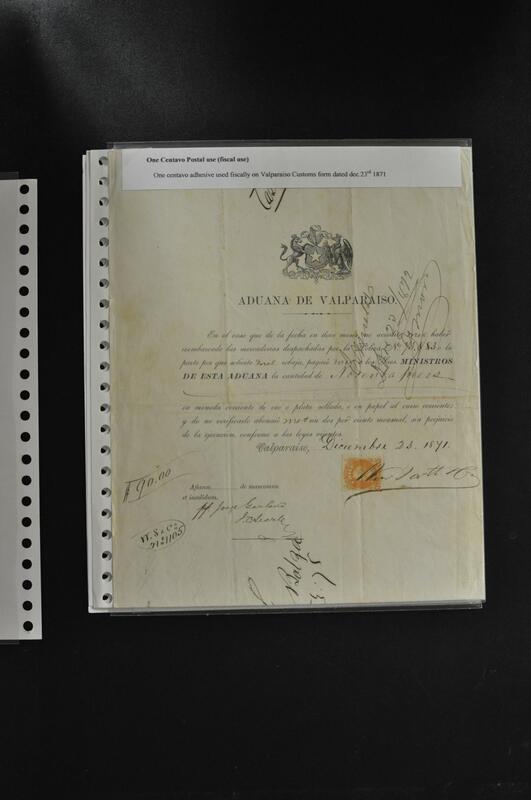 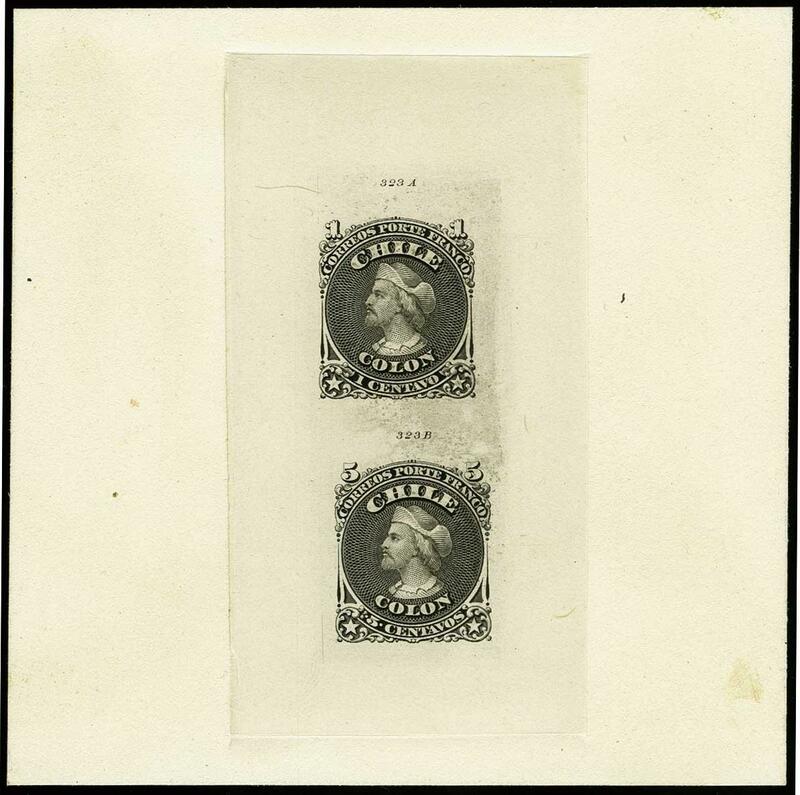 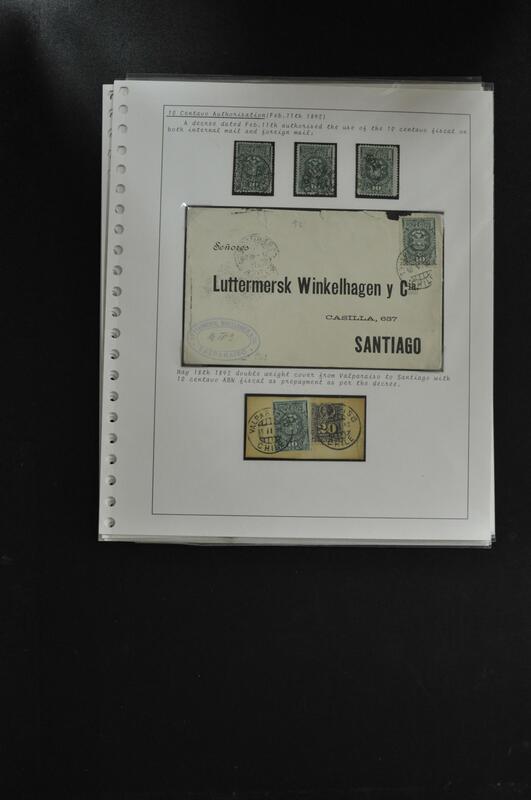 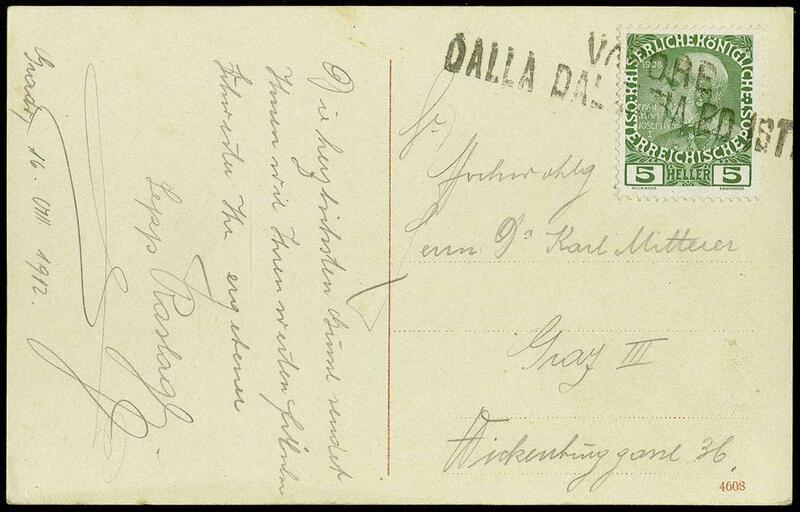 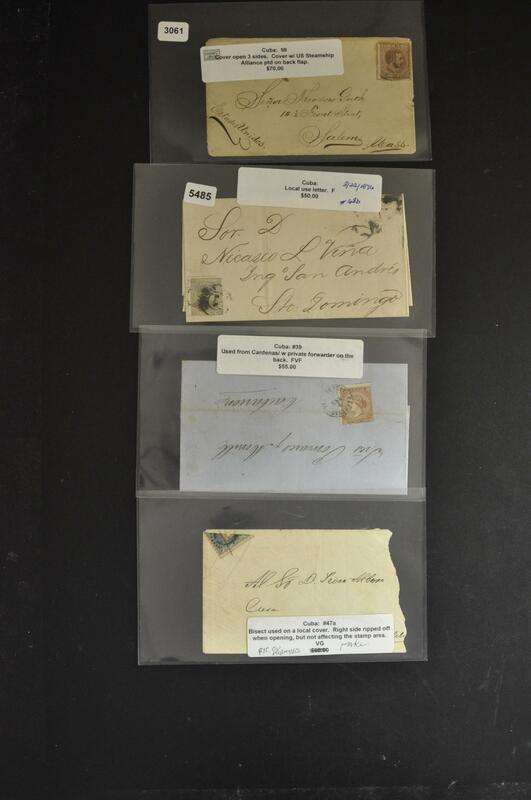 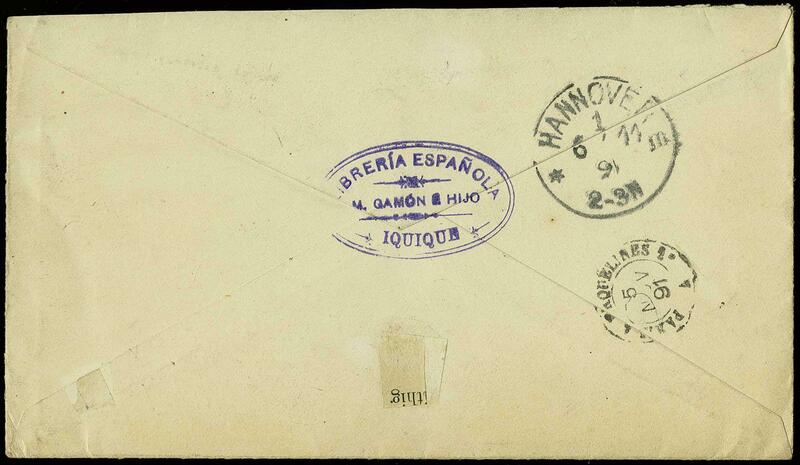 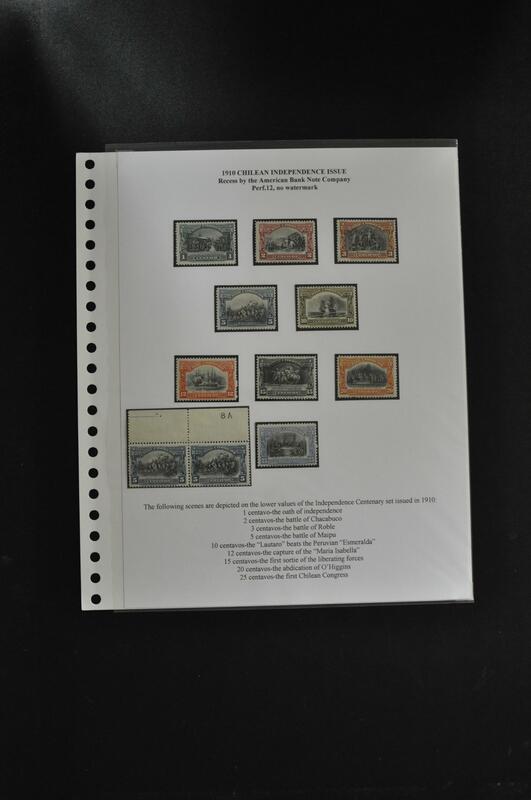 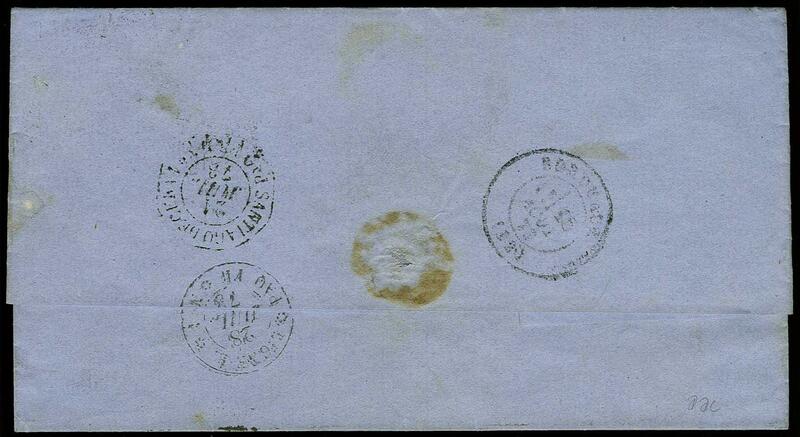 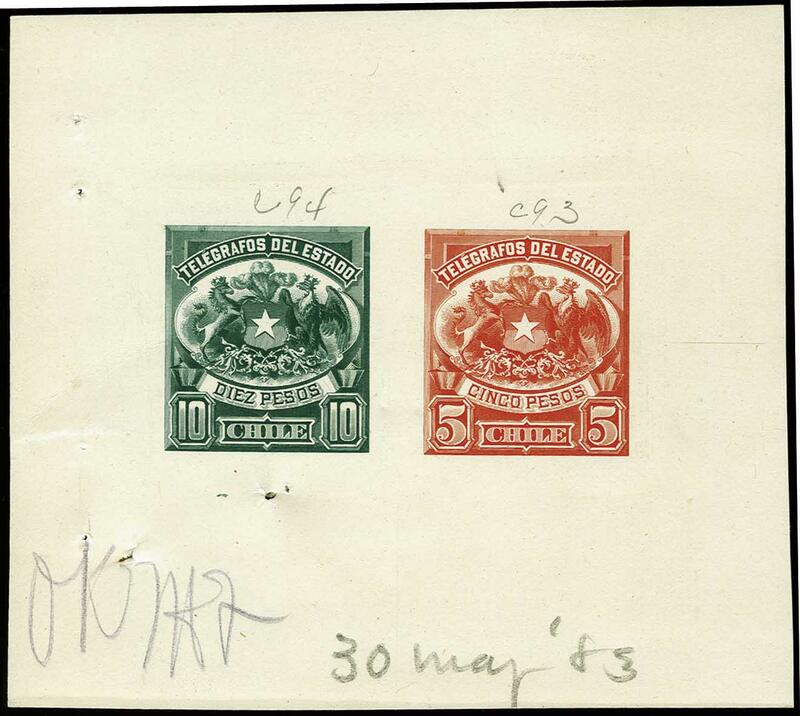 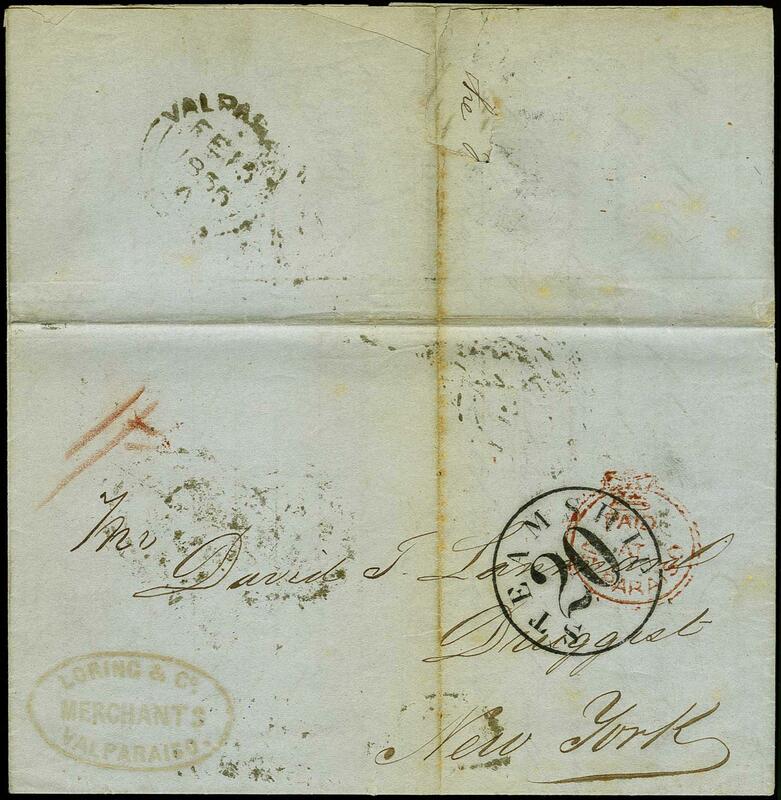 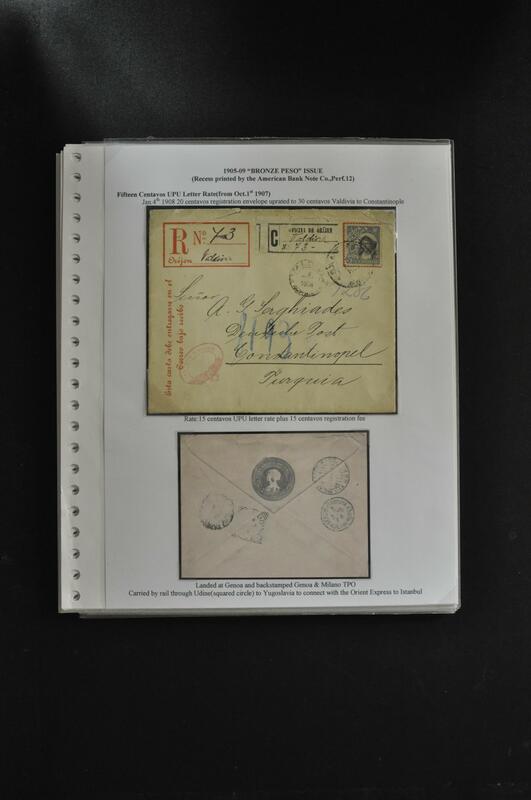 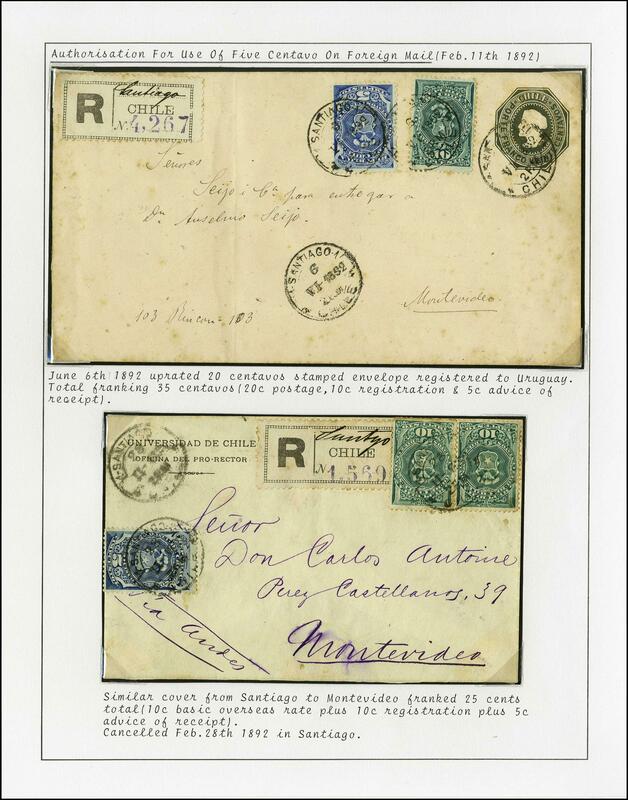 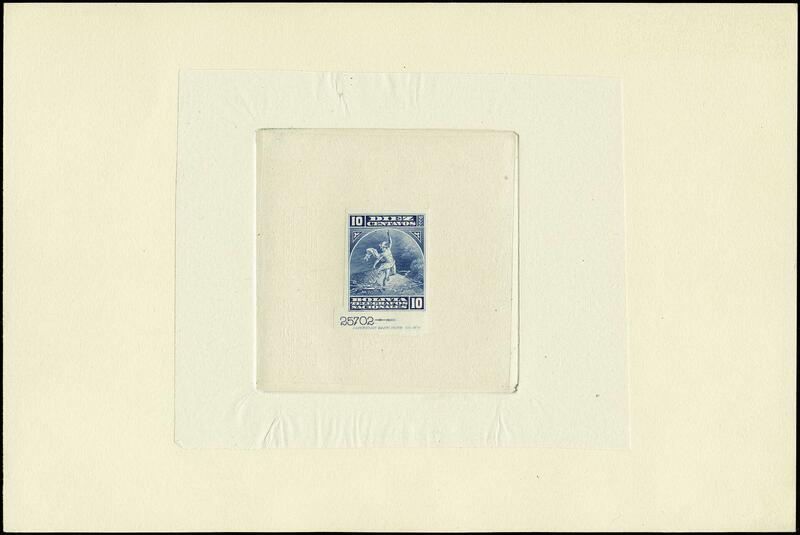 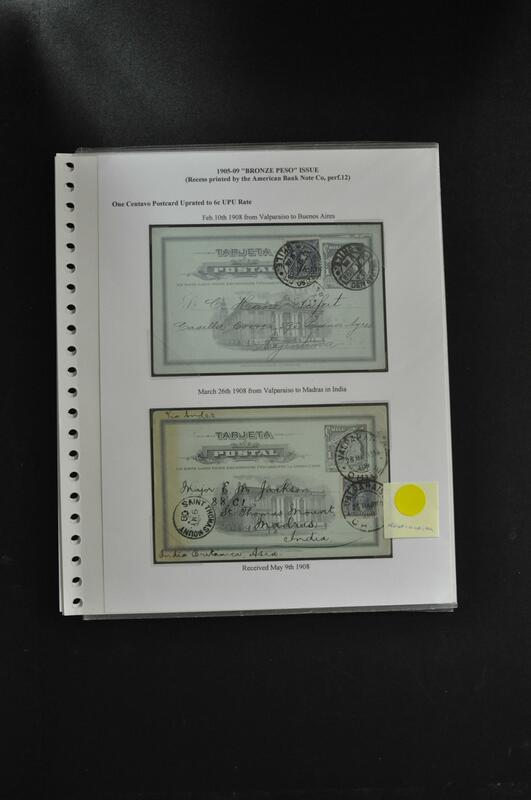 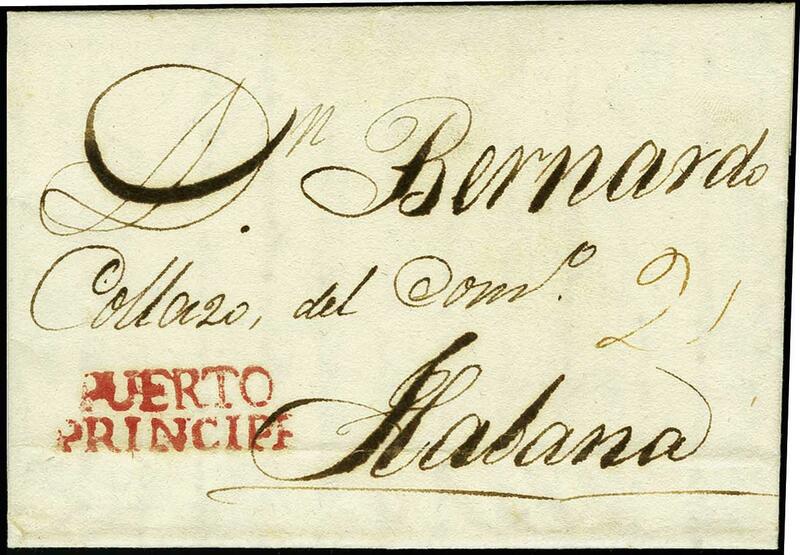 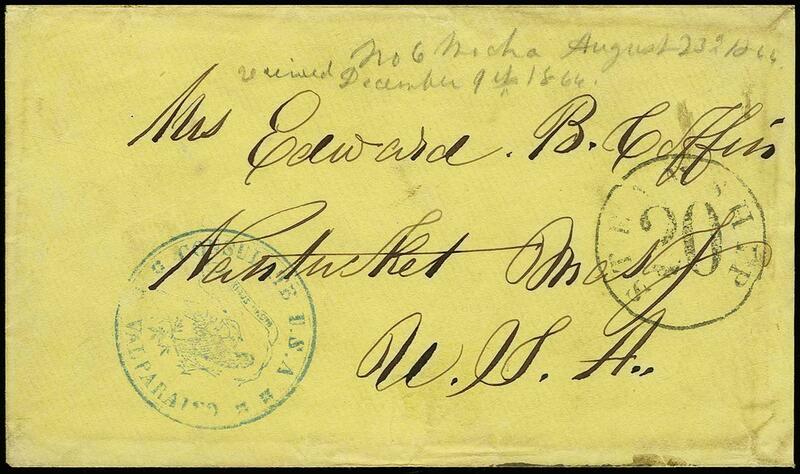 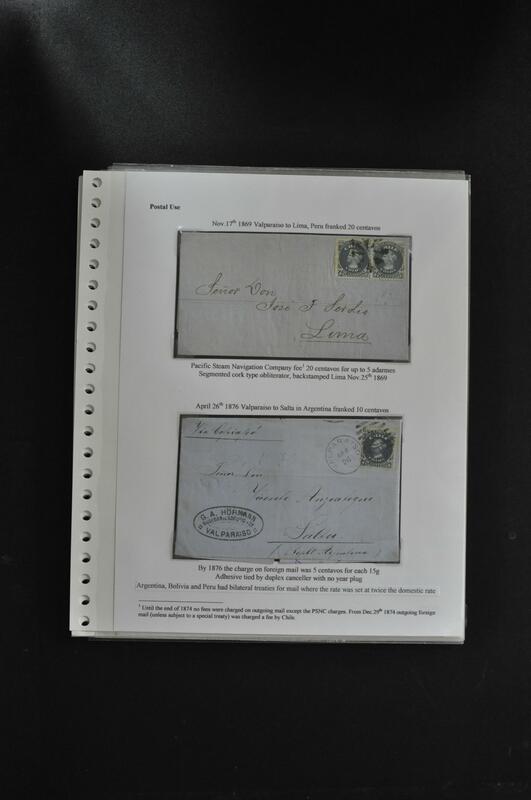 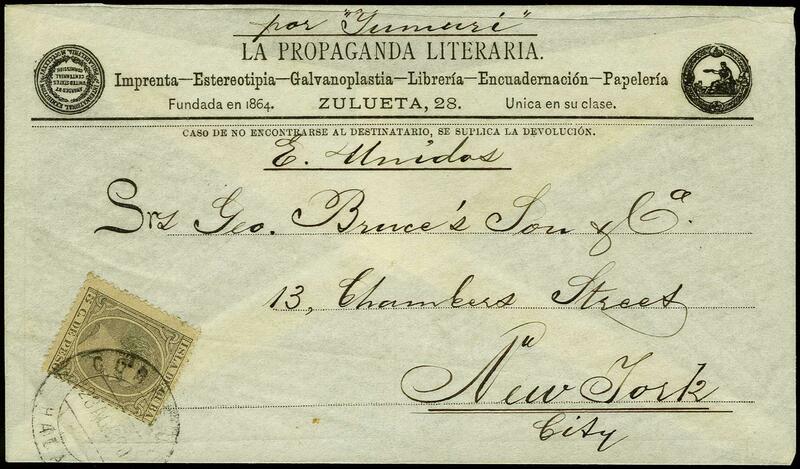 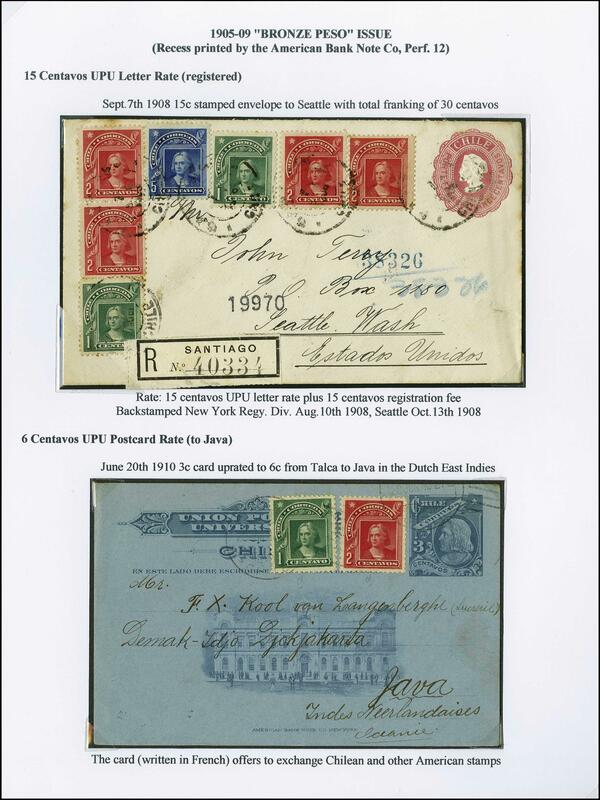 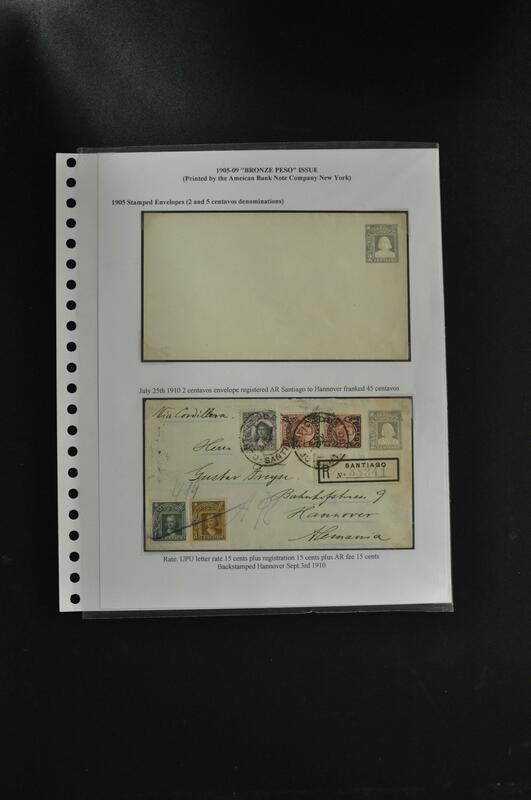 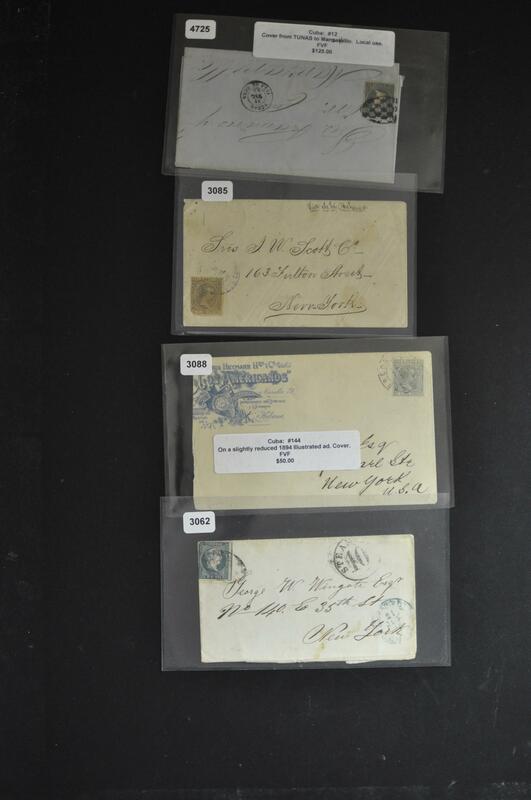 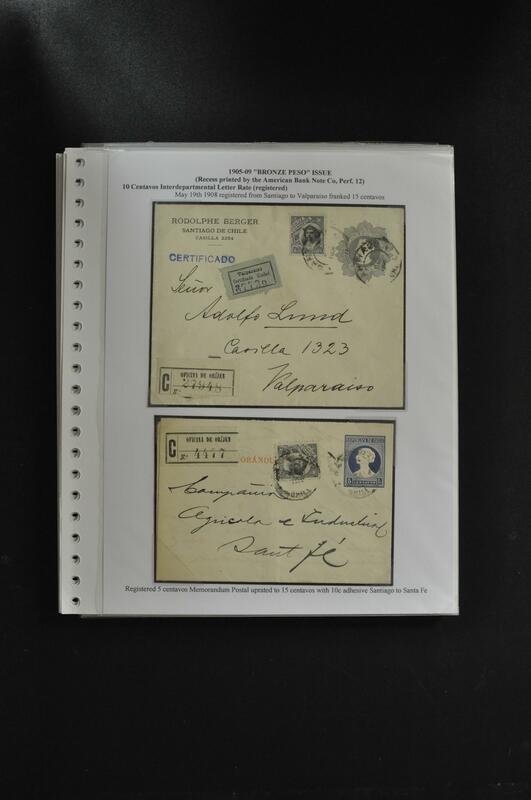 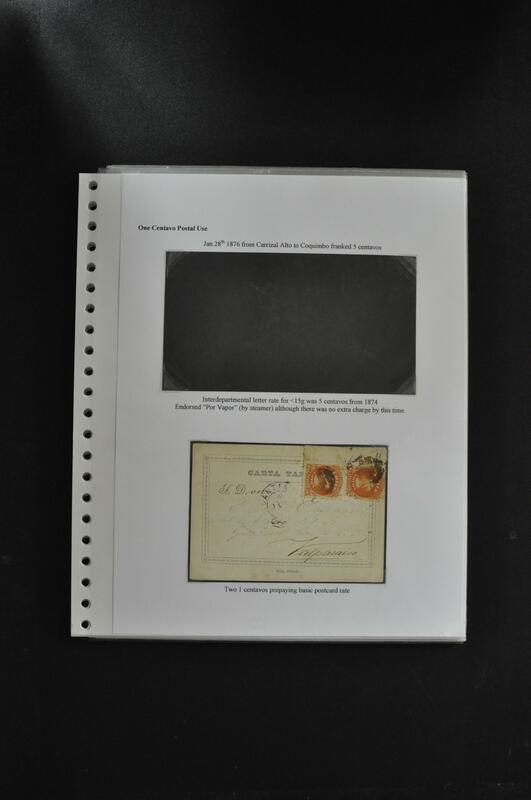 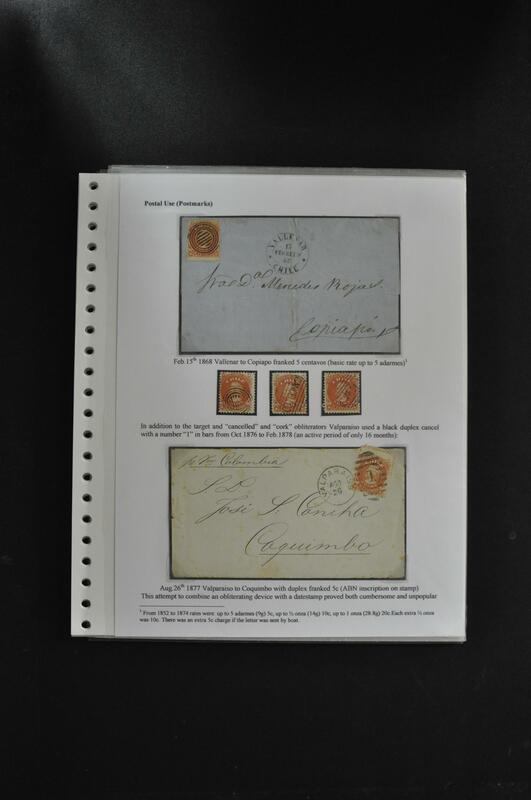 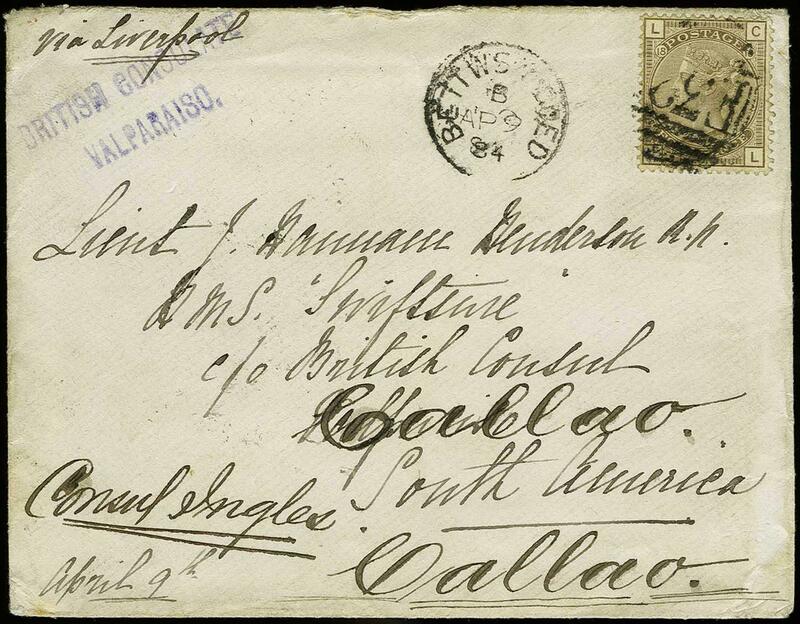 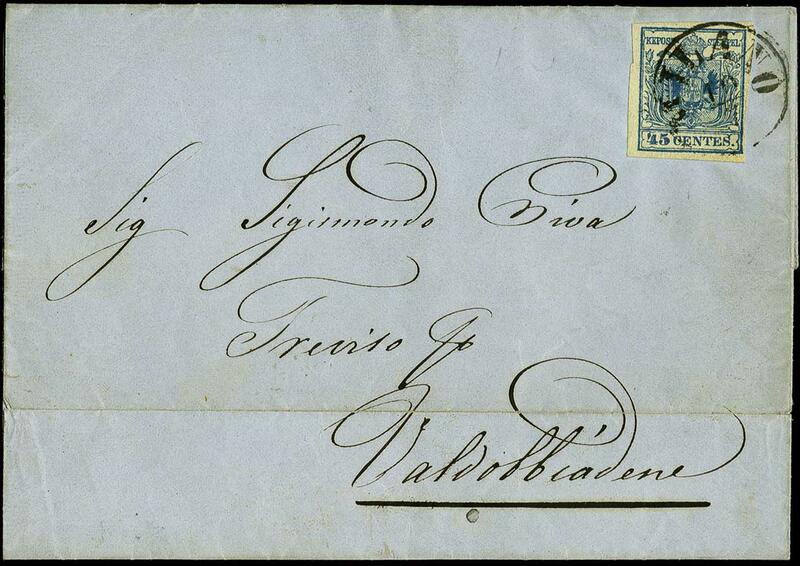 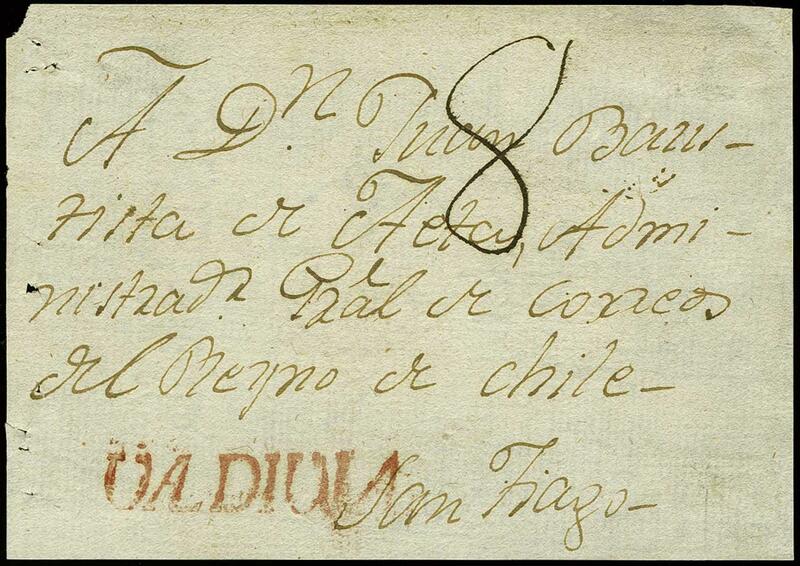 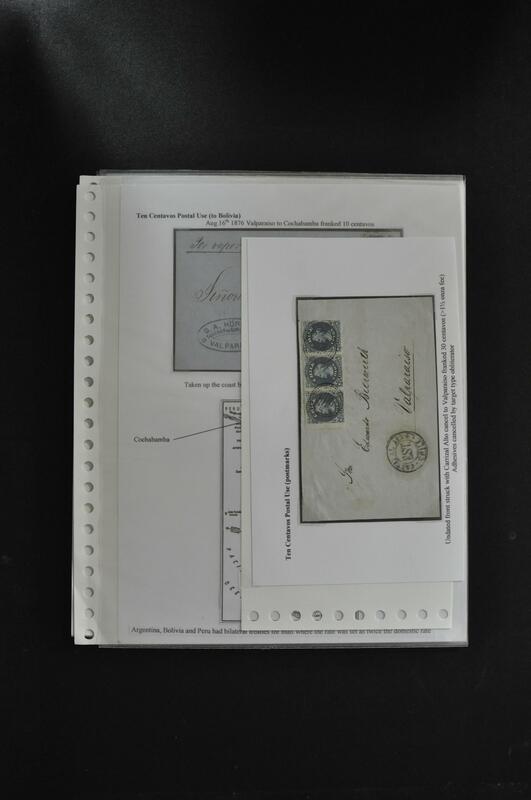 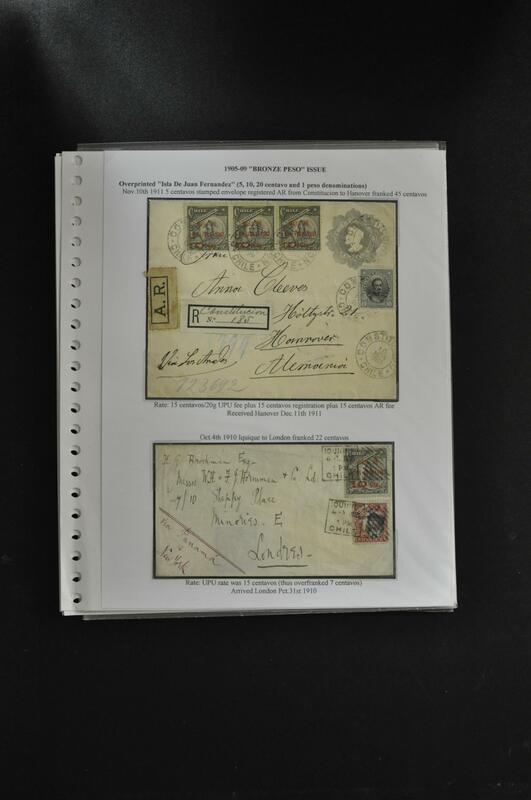 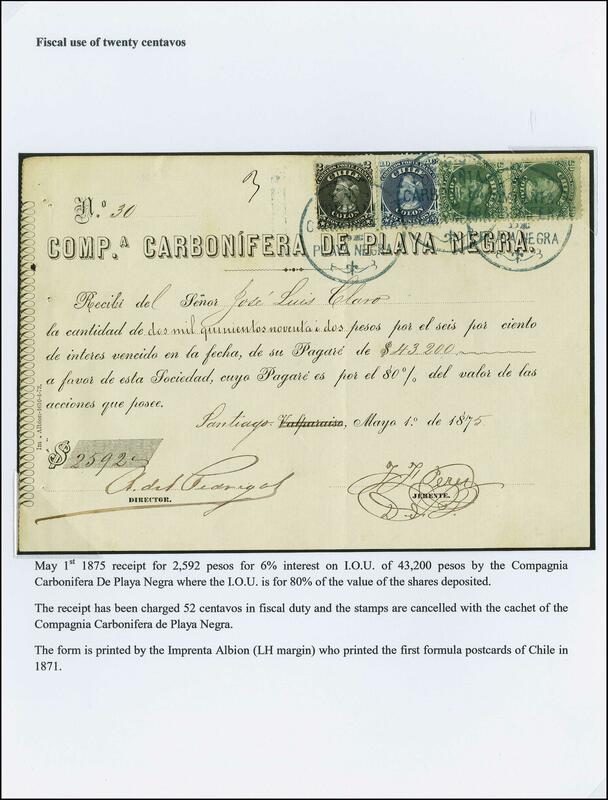 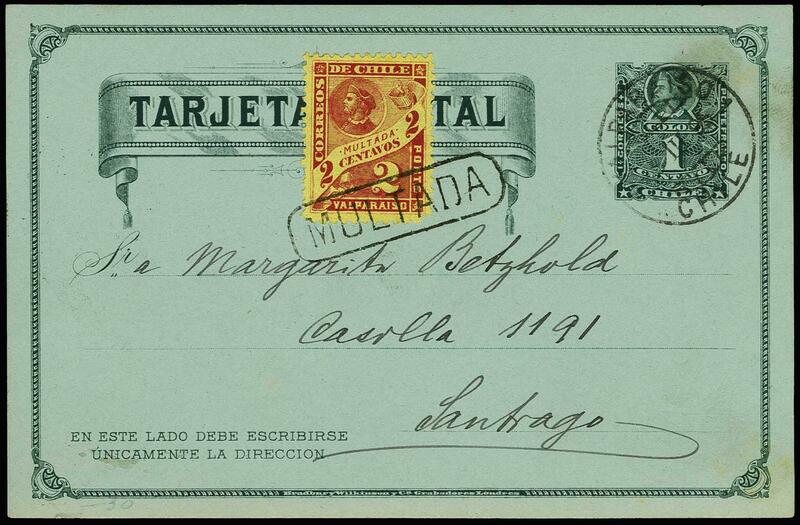 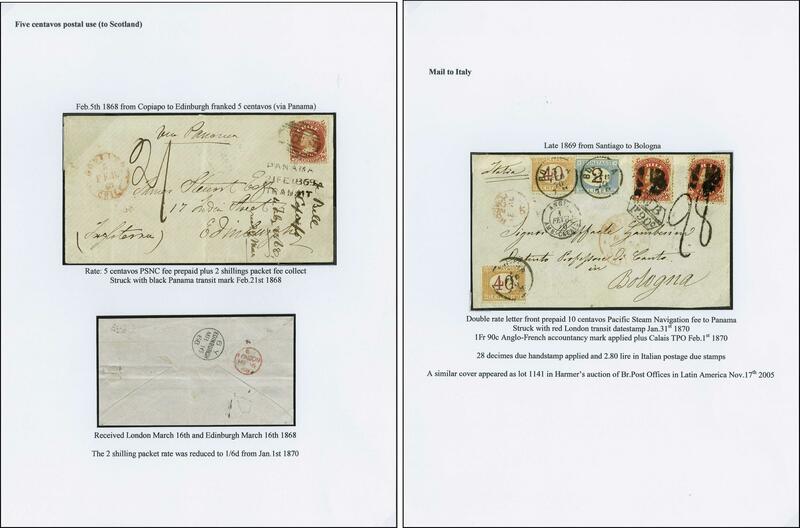 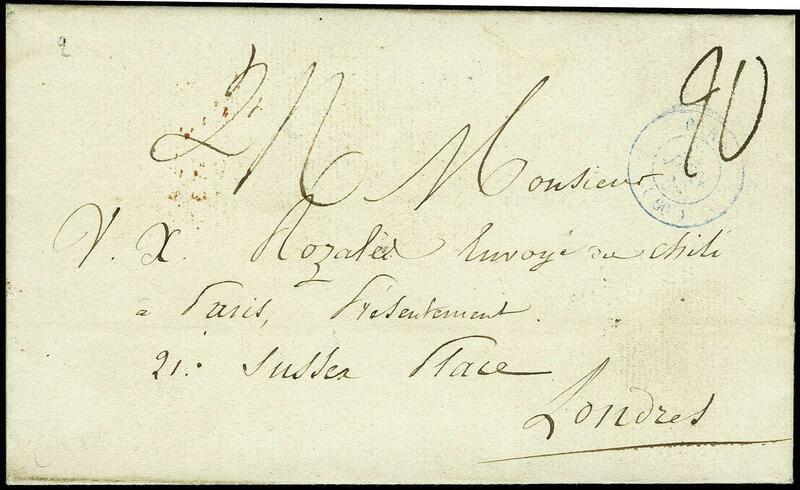 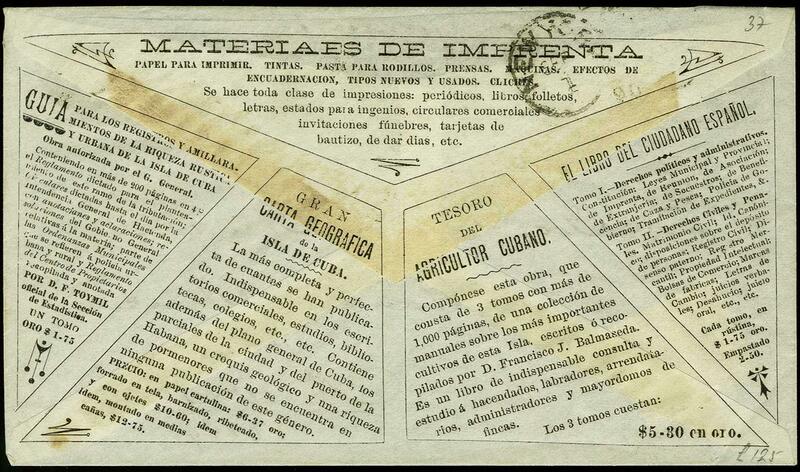 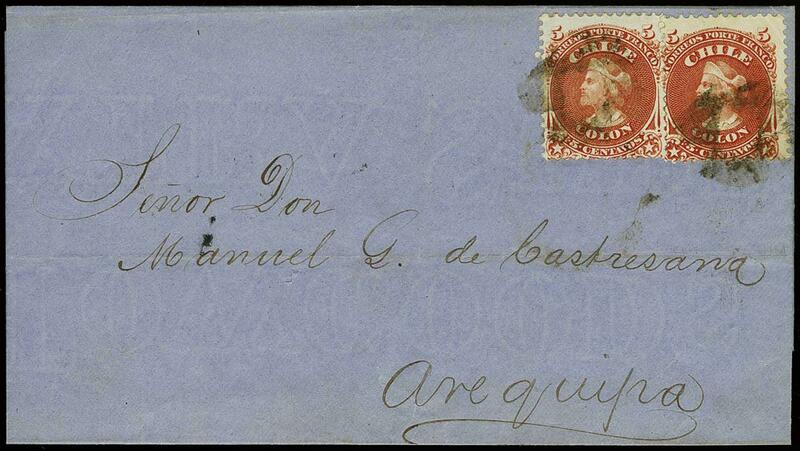 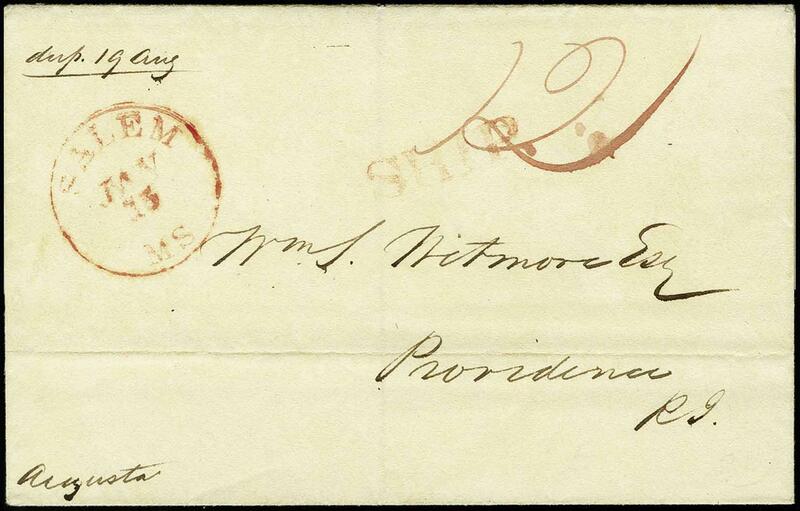 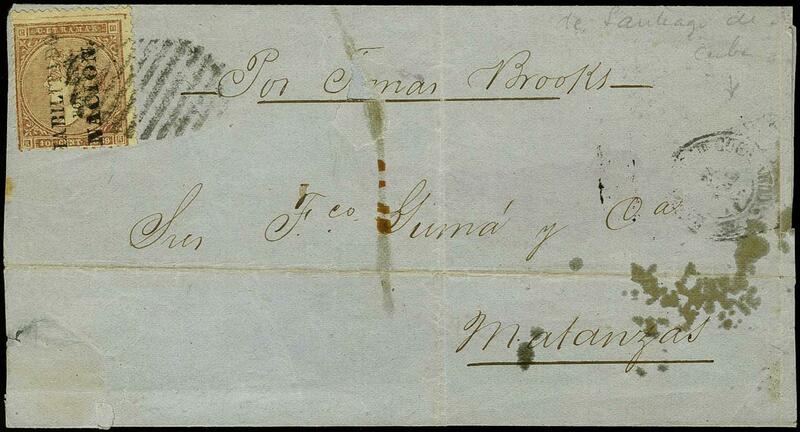 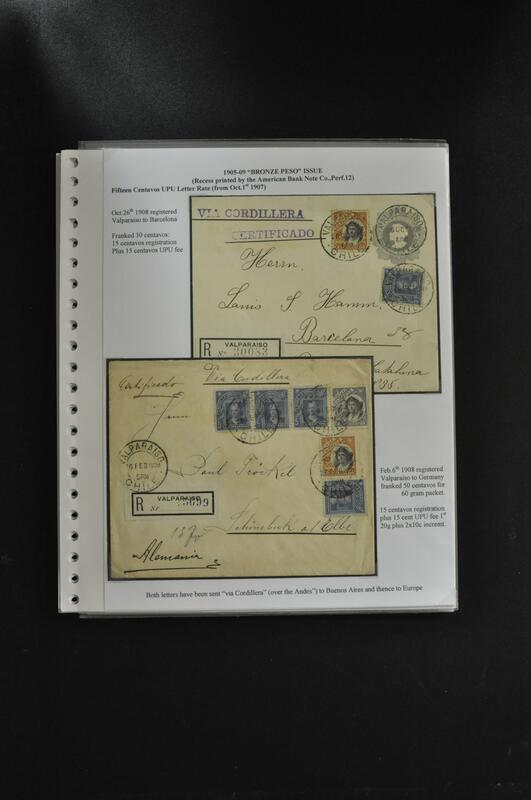 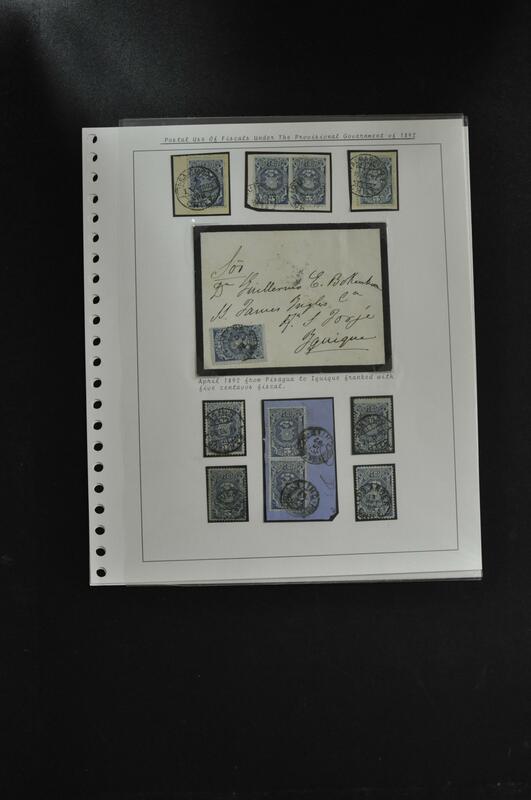 Early Cuba Covers, twelve covers with early stamps + four unused Postal cards, circa 1860-95, better noted 1862 ½r (#12) Baymo to Manzarillo, additional 1862 cover Tunas to Manzarillo; 1867 10c (28), Mantanzas to Colisia; 1875 25c (64), local use; 1879 25c (85) local to Havana; etc, overall Fine or better, owners retal price $610 with several unpriced, interesting group for Cuba specialist.